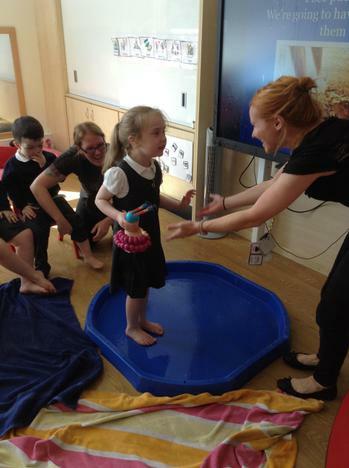 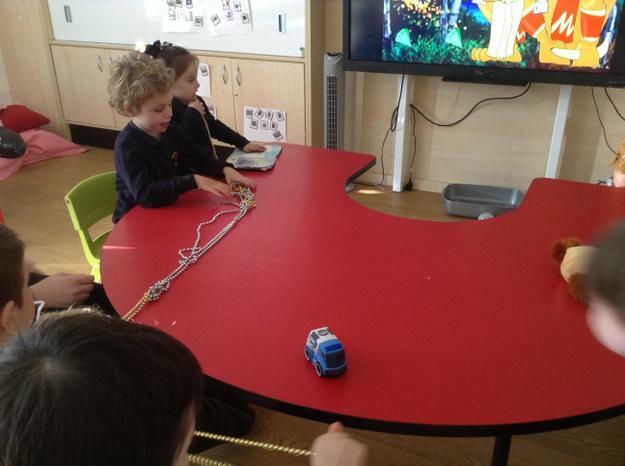 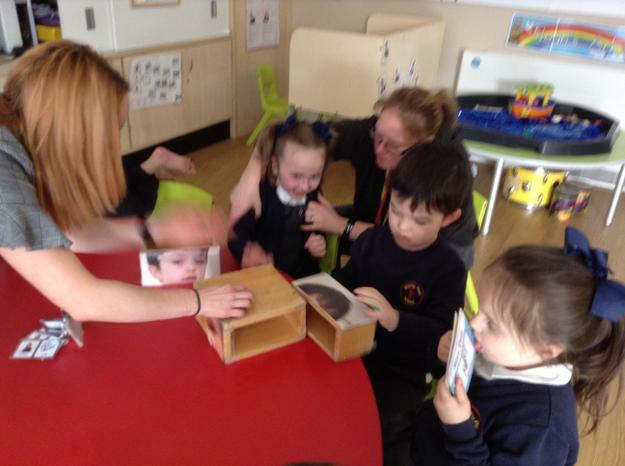 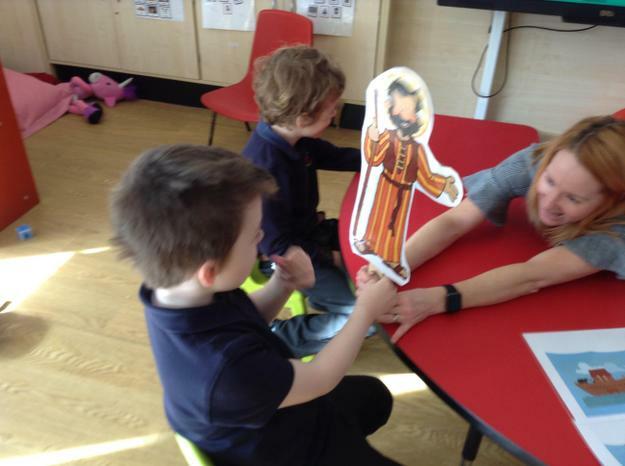 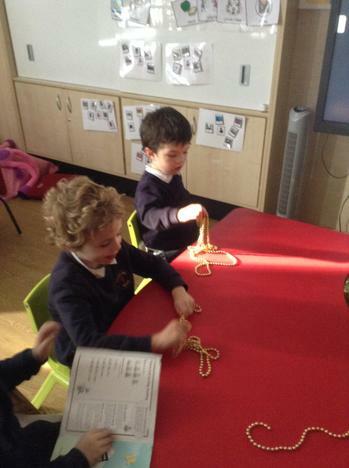 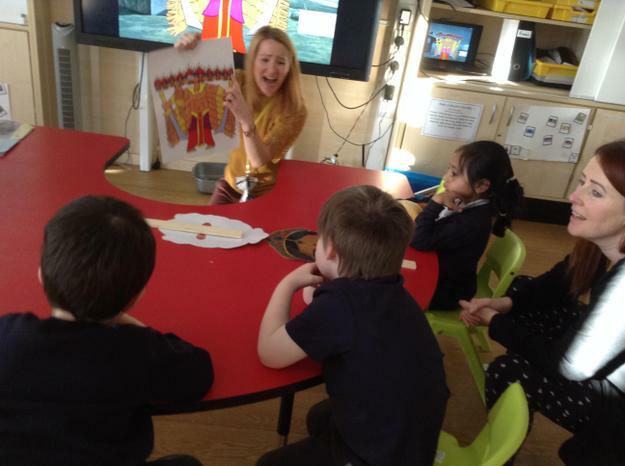 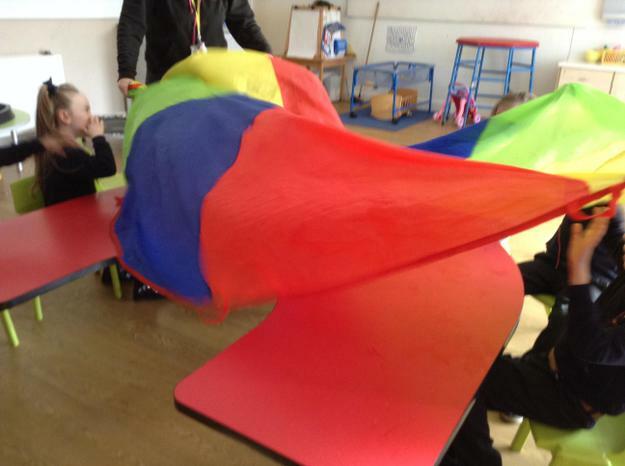 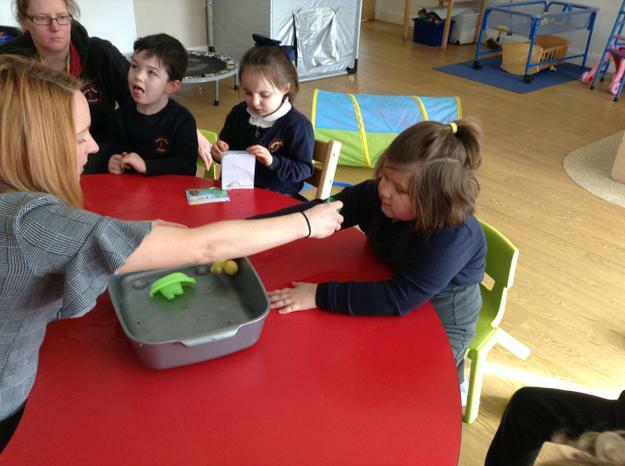 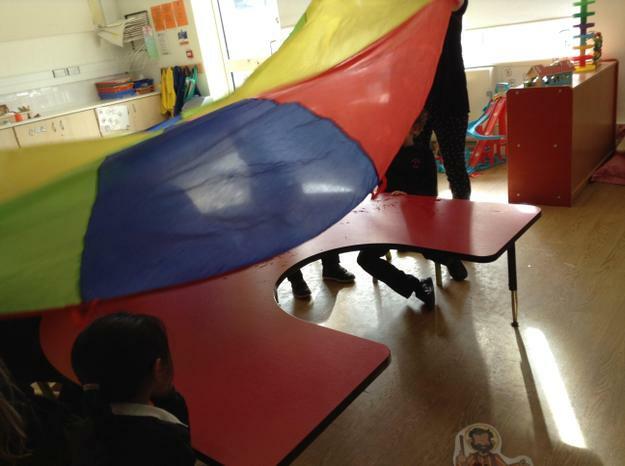 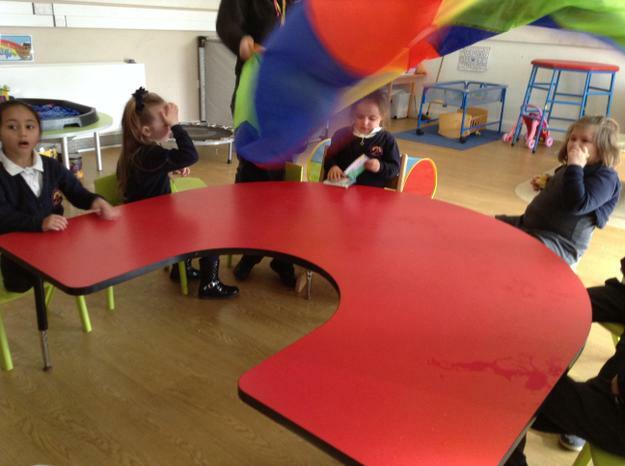 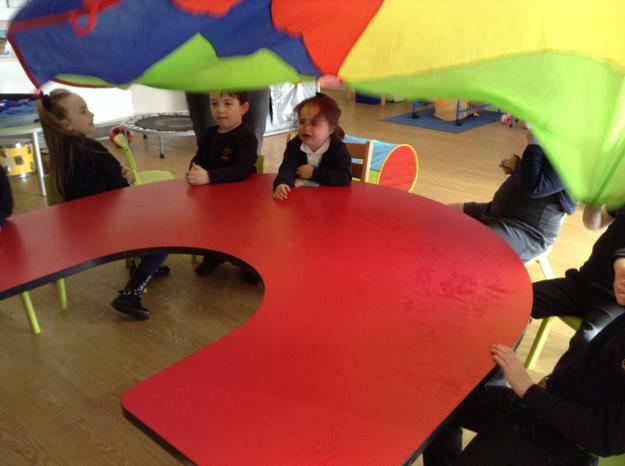 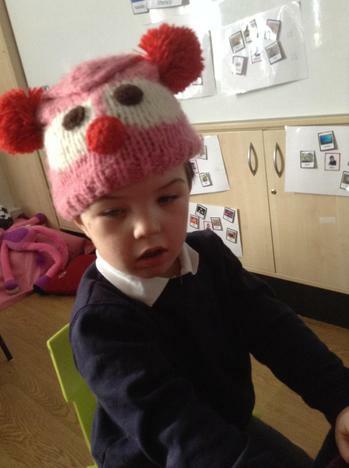 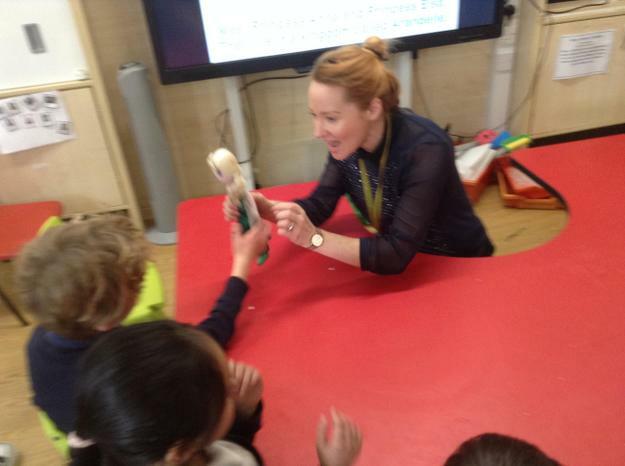 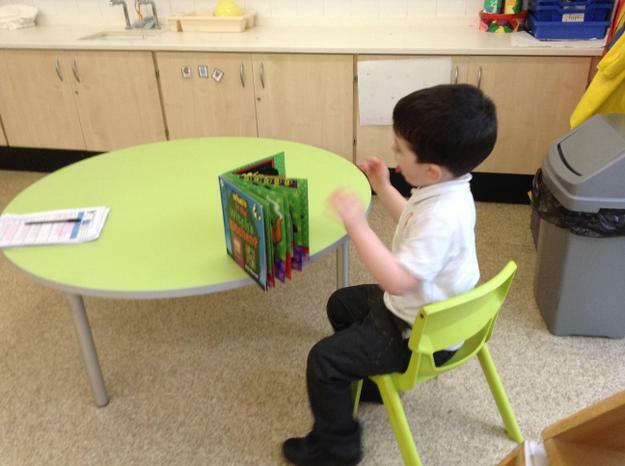 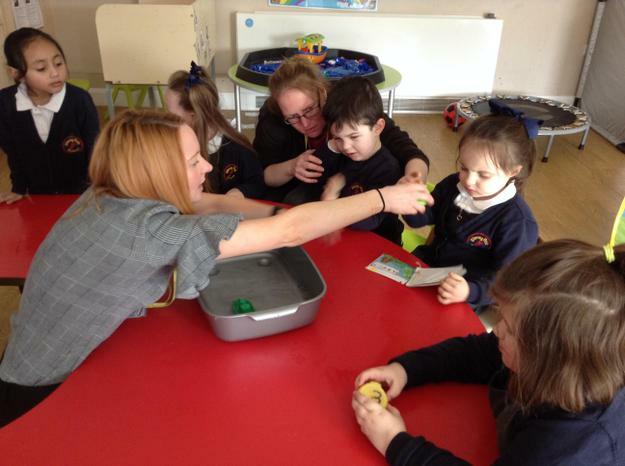 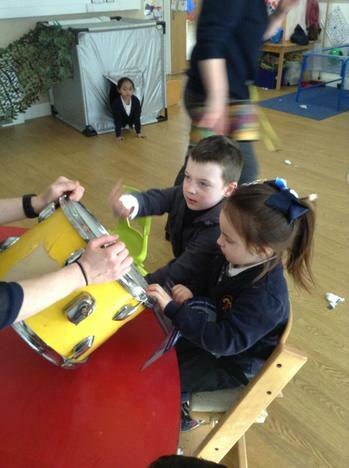 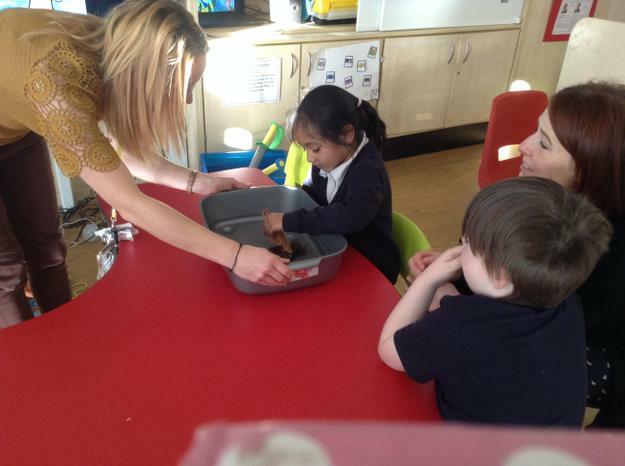 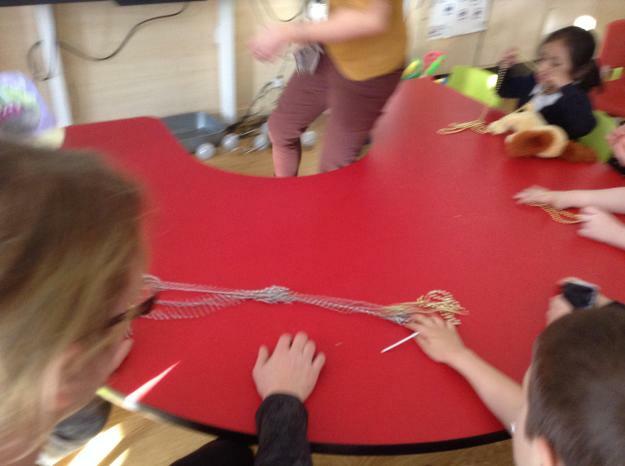 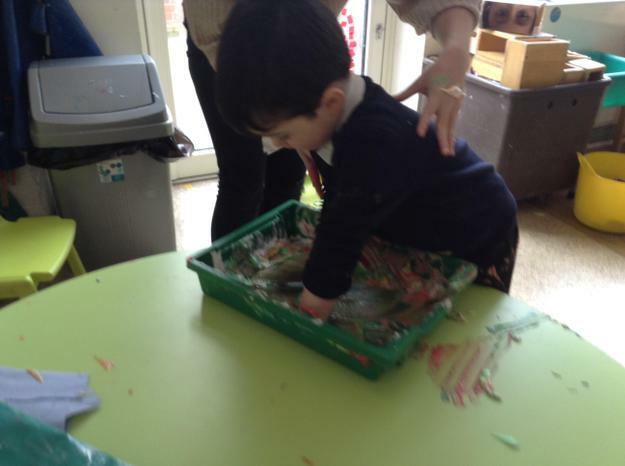 This term our first sensory story was 'Noah's Ark'. 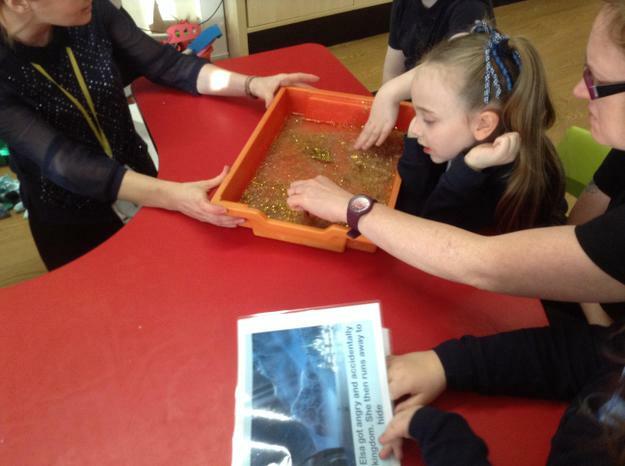 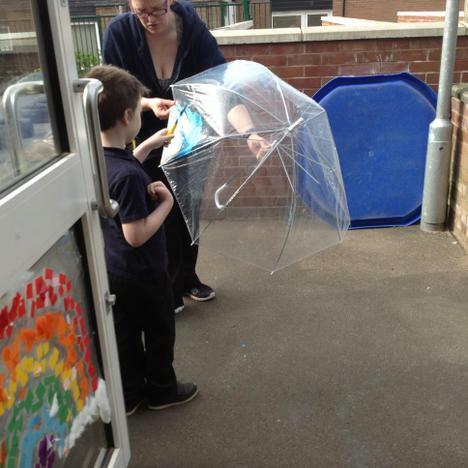 This linked our learning about the Christian faith and our topic focus 'rain'. 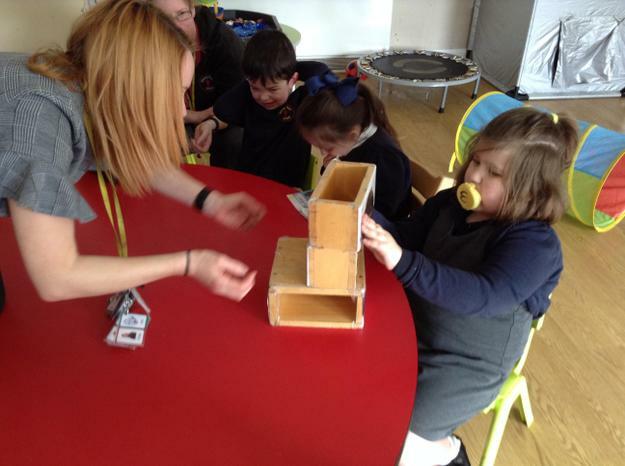 We met Noah and used blocks to help him build an ark. 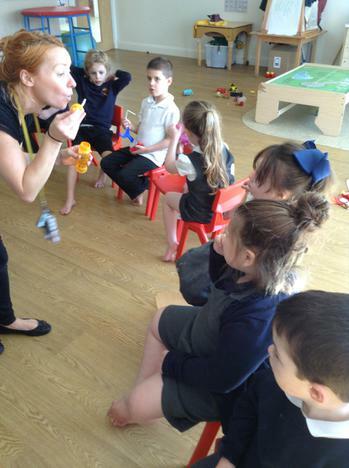 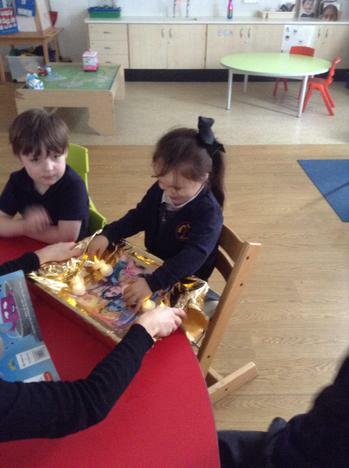 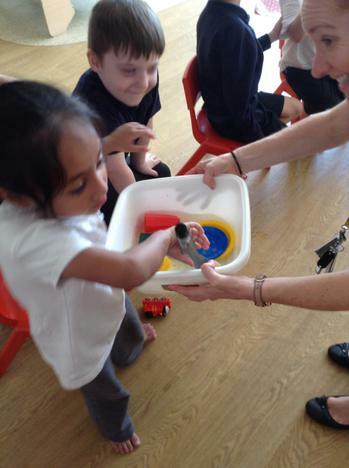 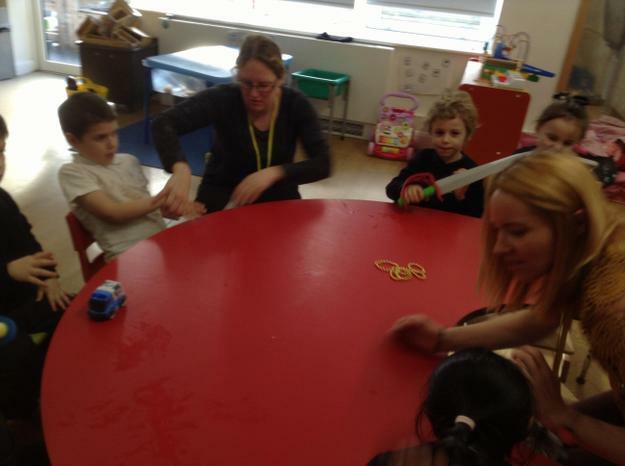 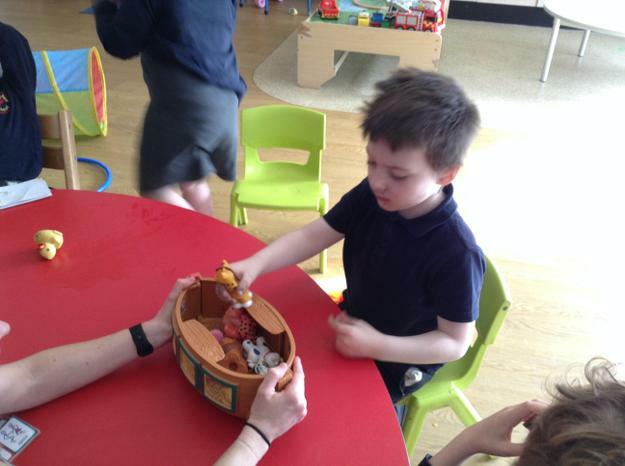 We then all had a turn of putting the toy animals onto the boat, then we felt the rain from the water sprays. 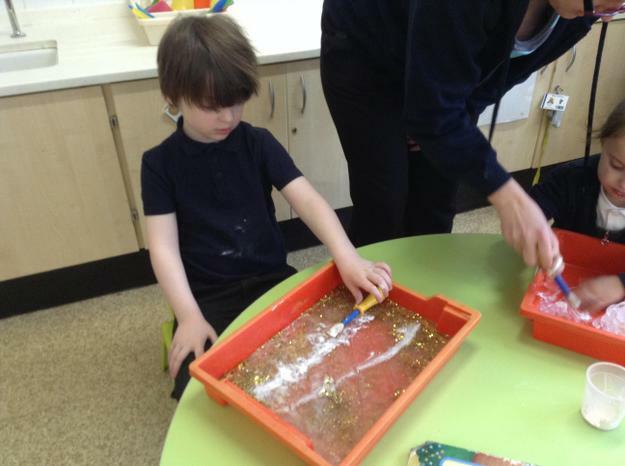 We also put boats into the water to show the ark on the waves. 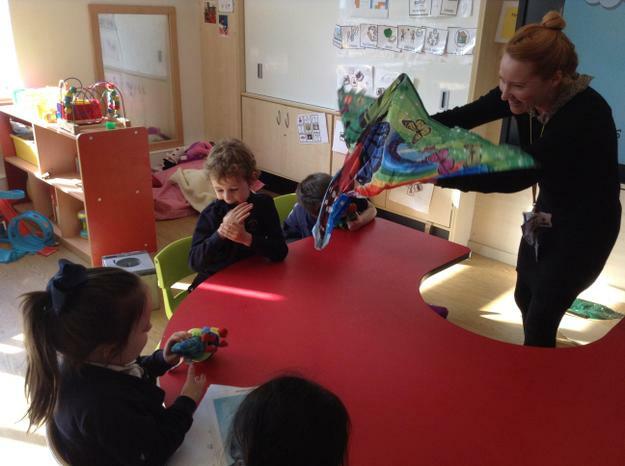 Finally, when the rain stopped we looked up and saw a colourful parachute rainbow in the sky. 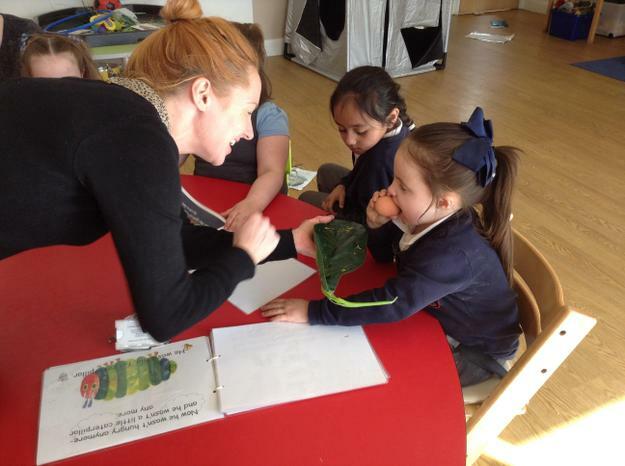 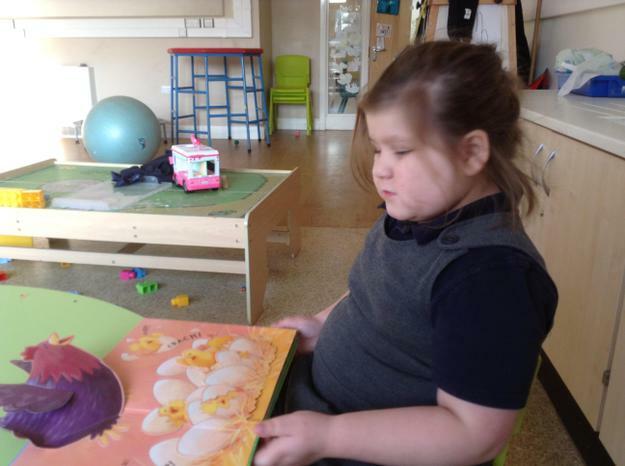 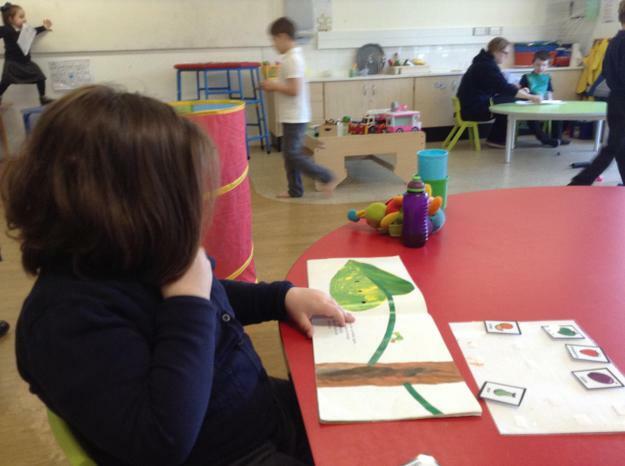 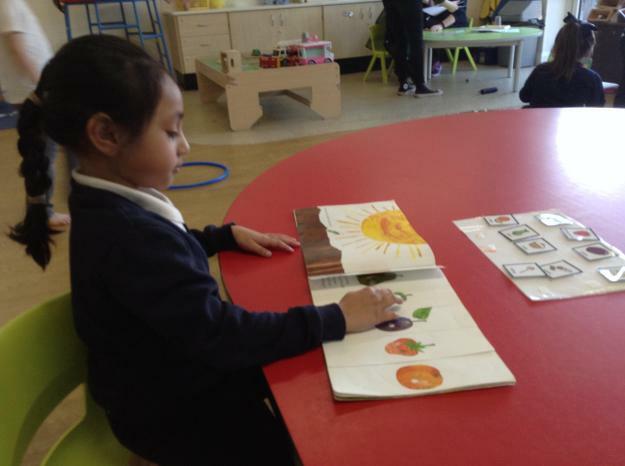 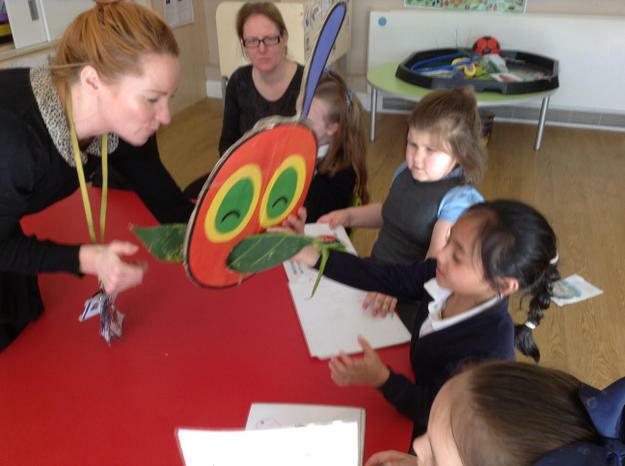 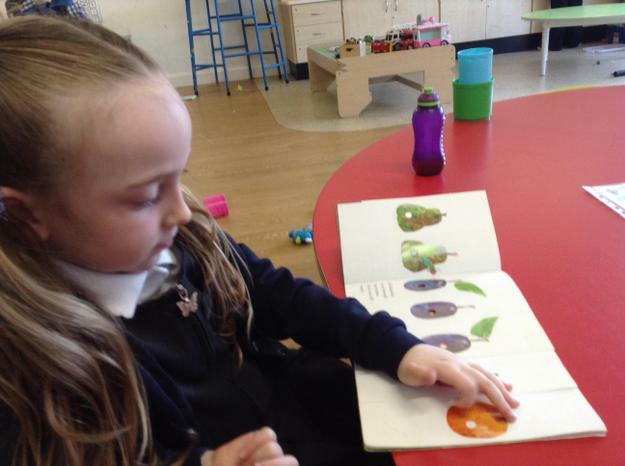 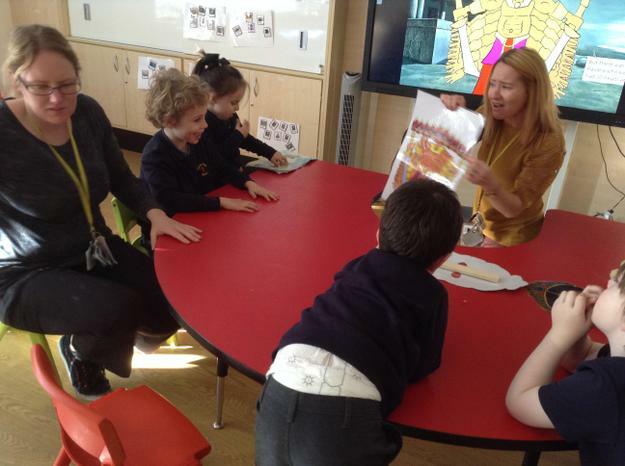 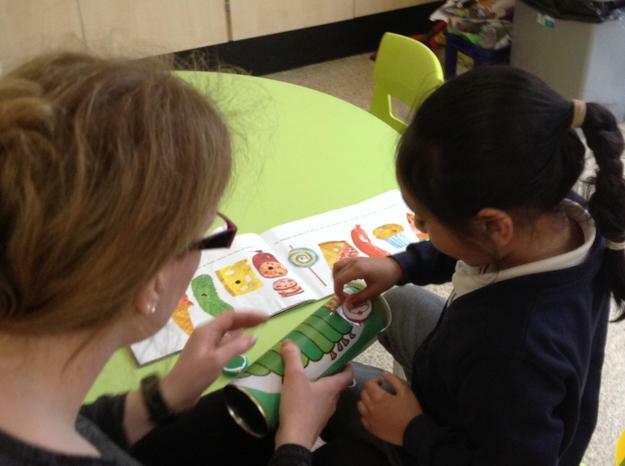 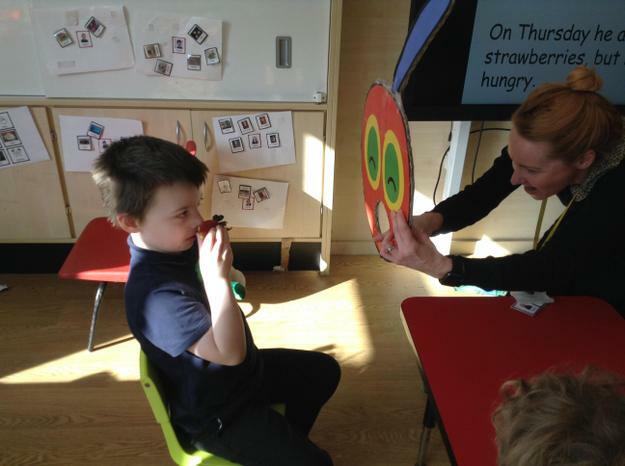 For world book week we also enjoyed the hungry caterpillar story. 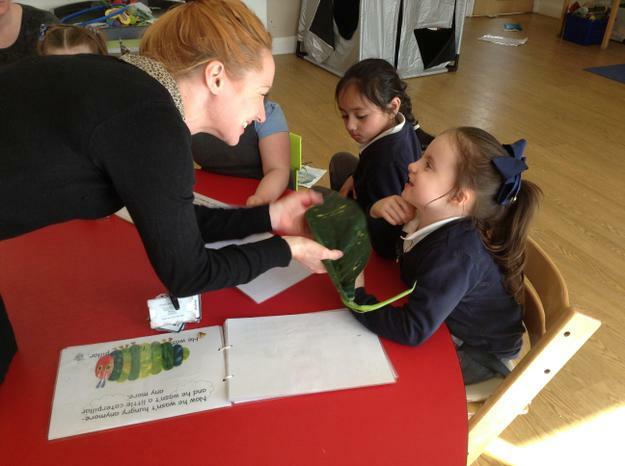 We posted fruit through the caterpillars mouth, wrapped him in his cocoon and then saw a beautiful butterfly at the end. 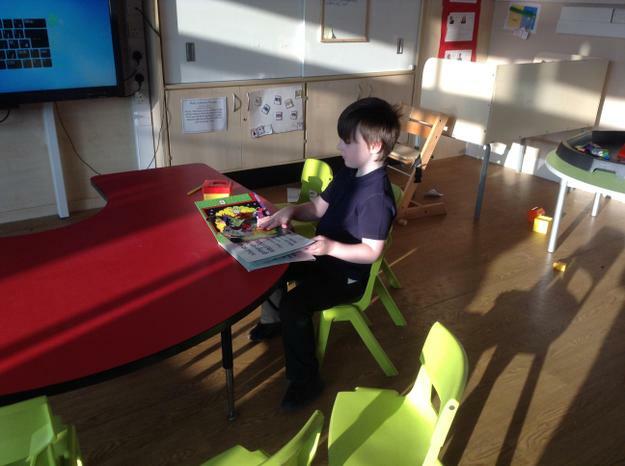 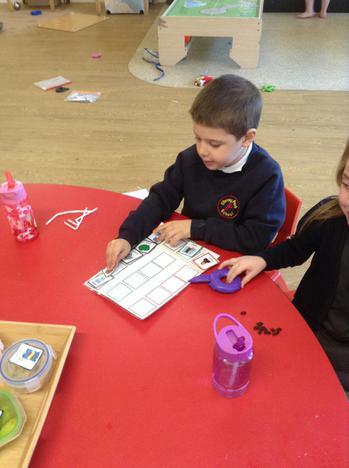 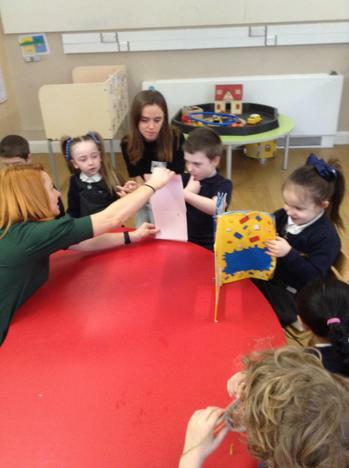 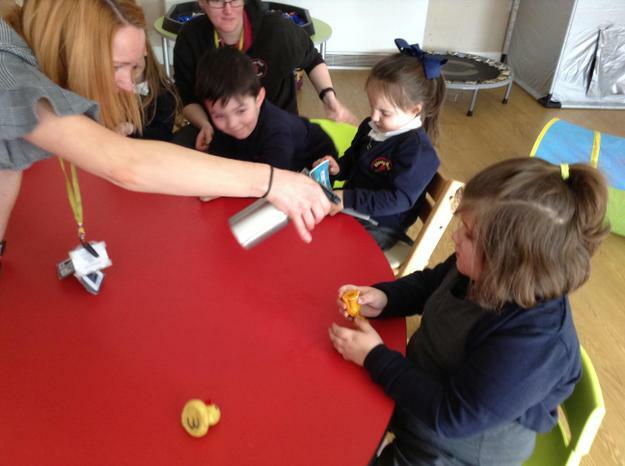 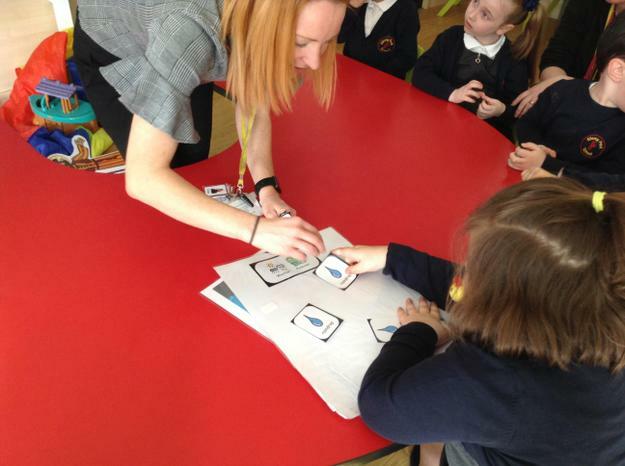 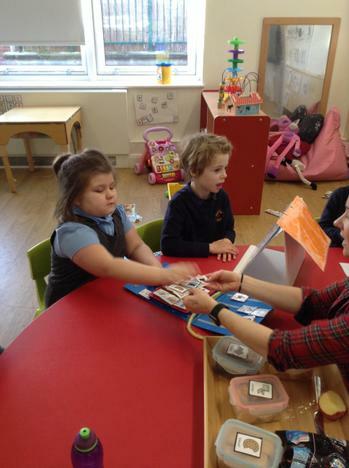 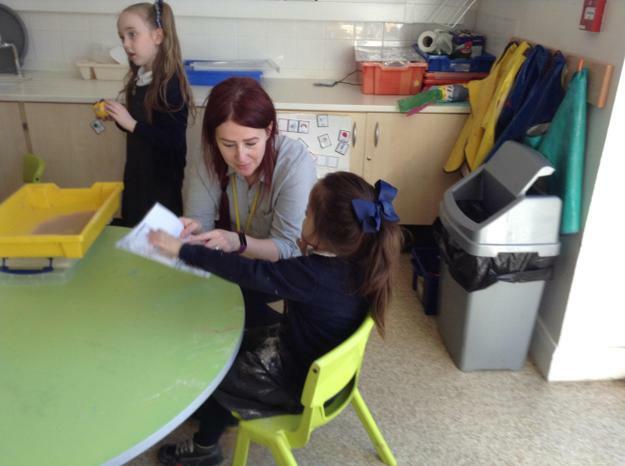 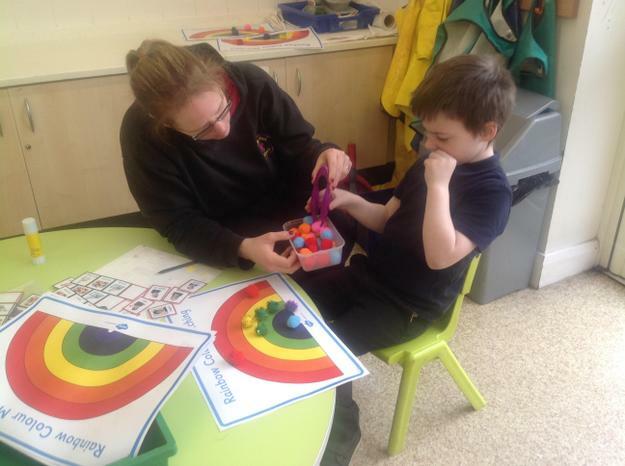 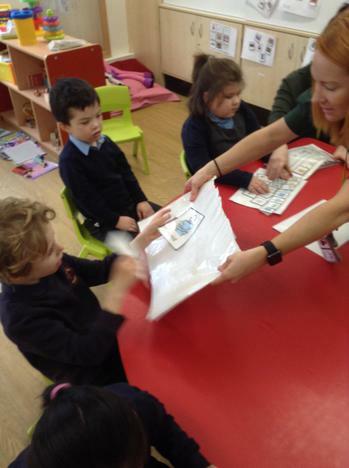 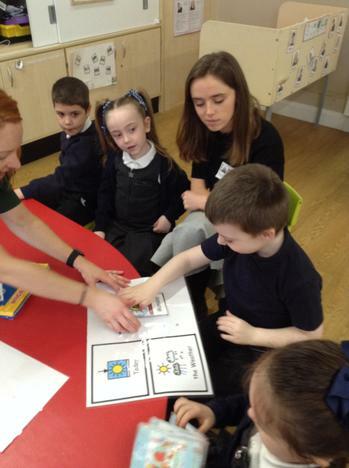 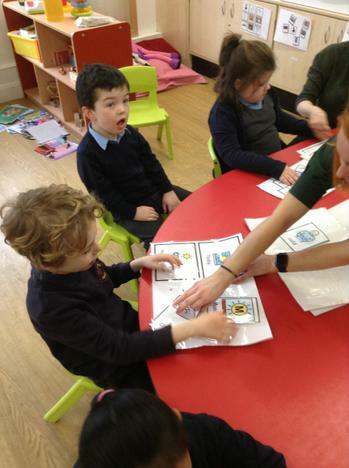 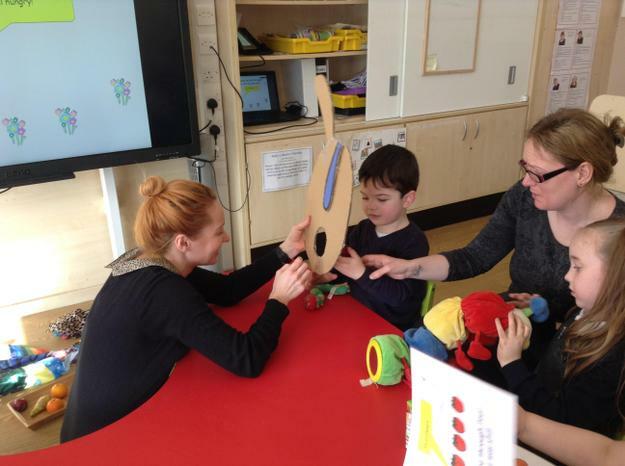 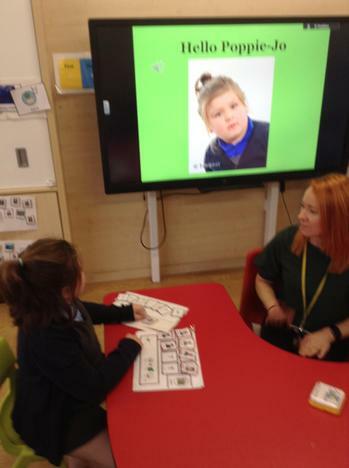 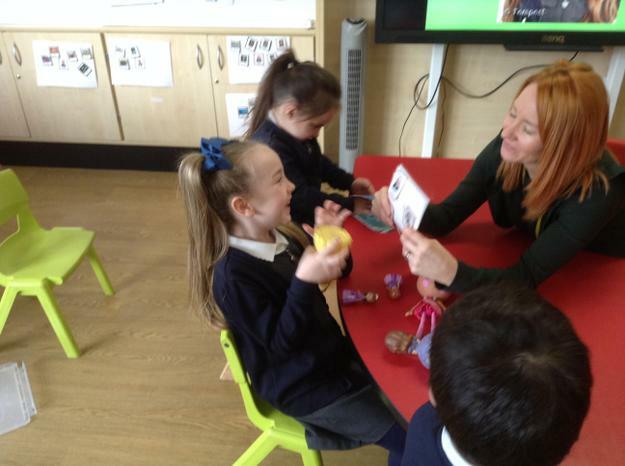 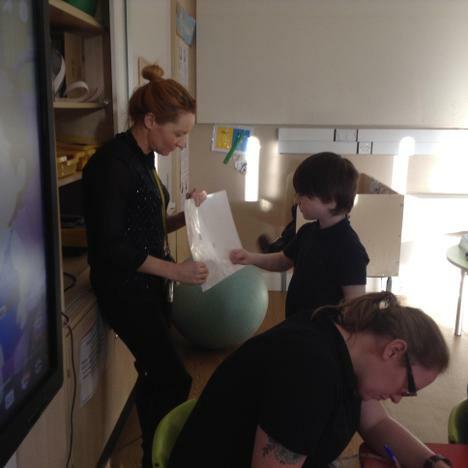 The children in Lime class have continued to build upon the skills developed during Spring 1 and all of them have been learning how to use symbols (PECS or a PODD board) to request things. 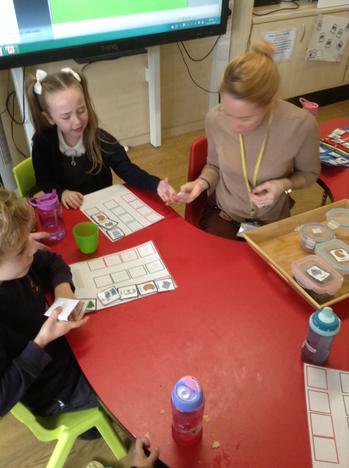 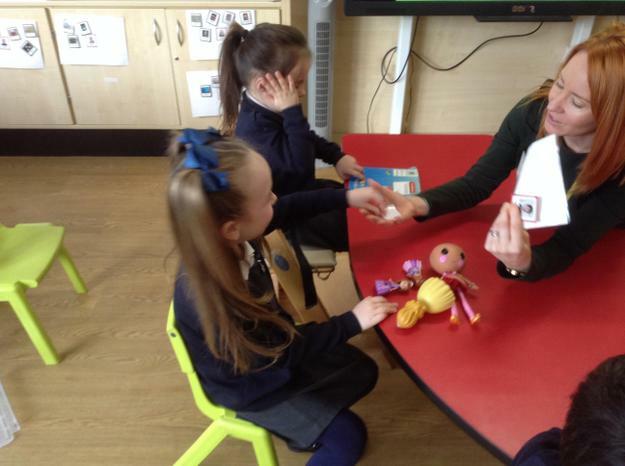 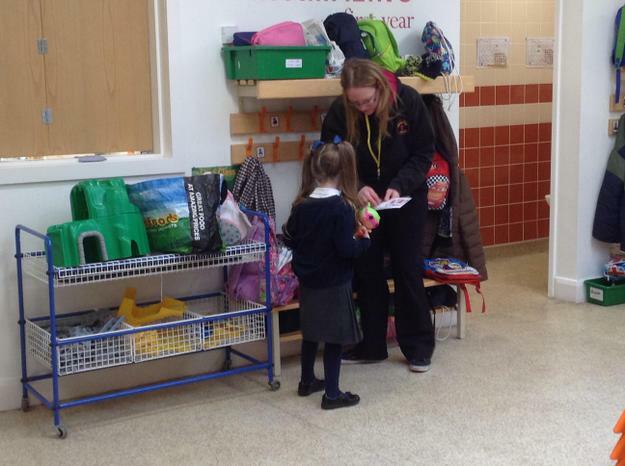 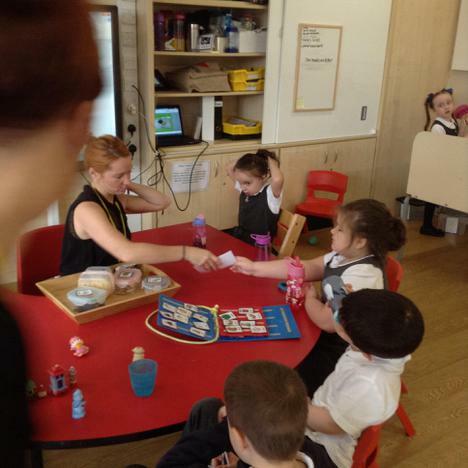 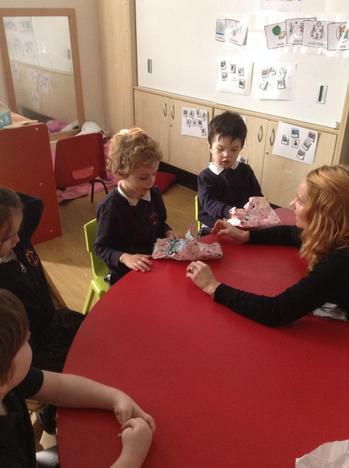 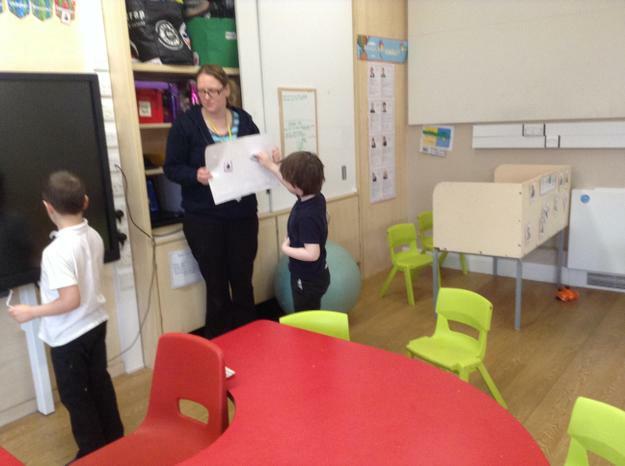 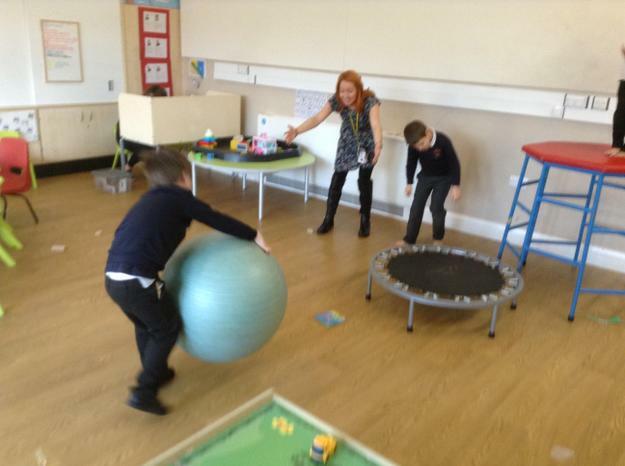 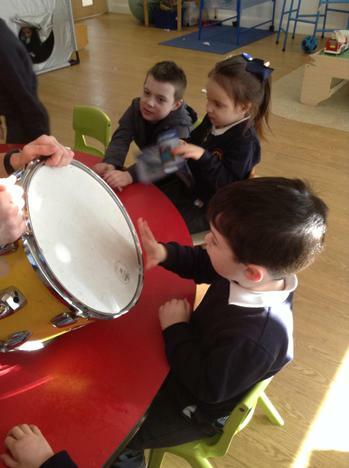 As well as using symbols at snack and dinner time, we have also been encouraging the children to request favoured games and toys. 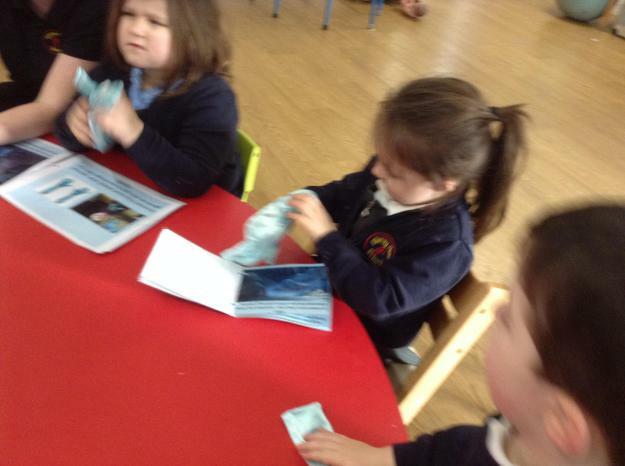 They have all been doing really well with this. 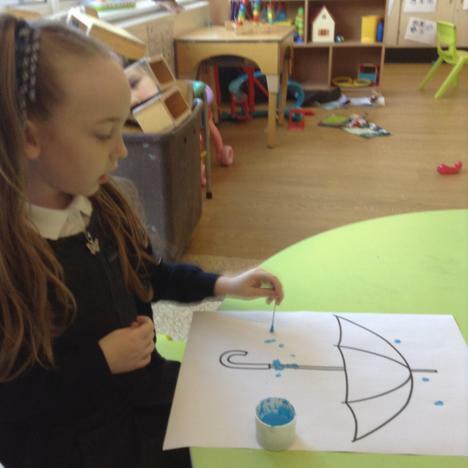 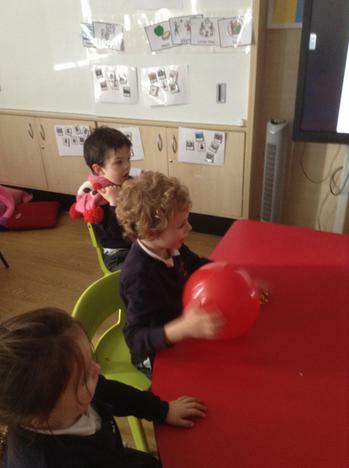 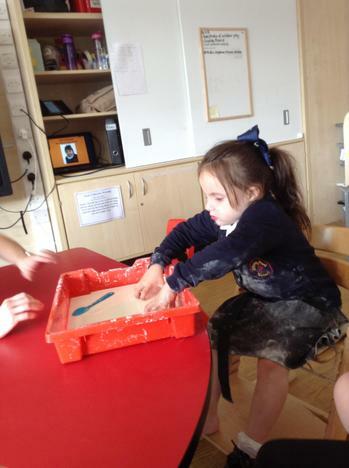 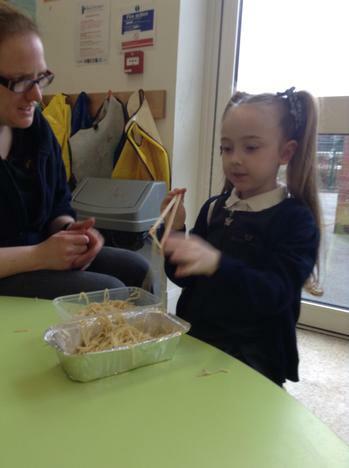 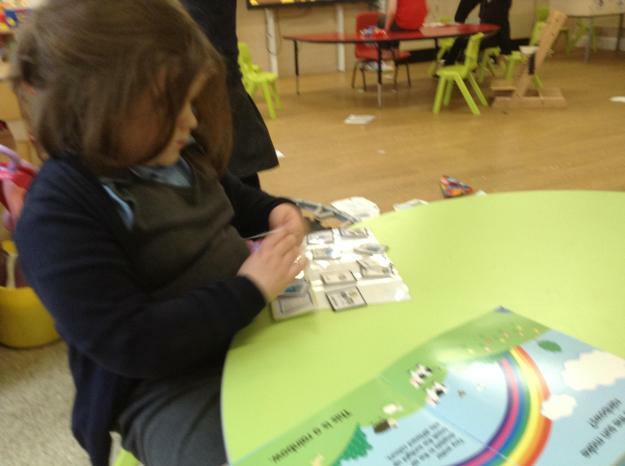 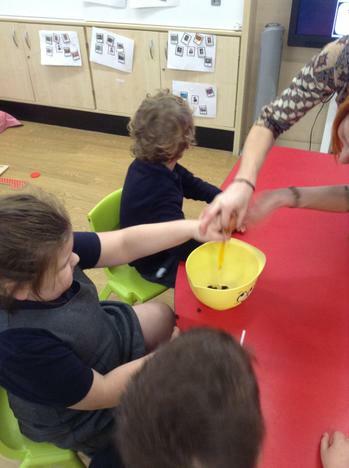 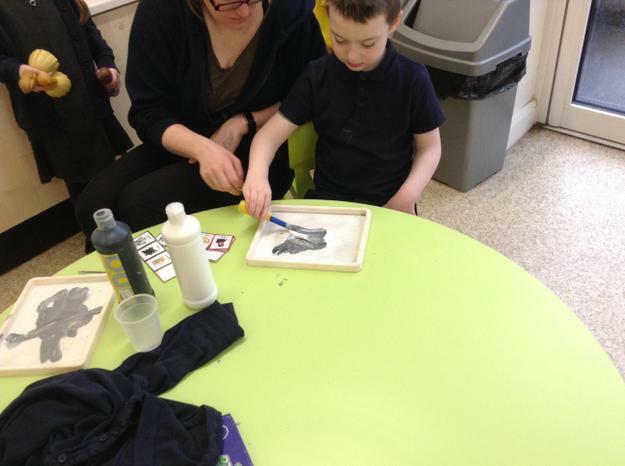 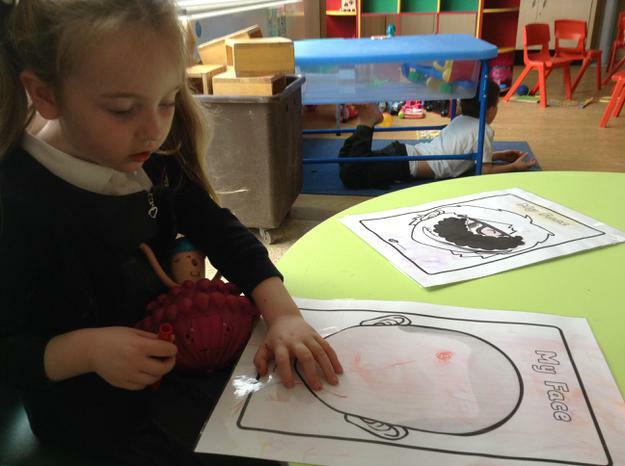 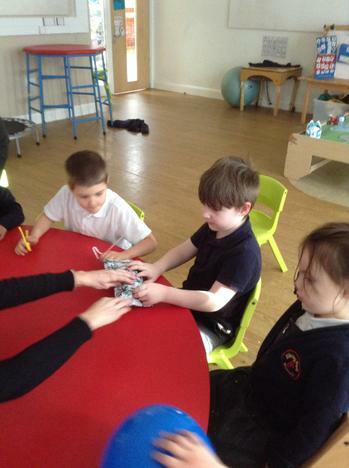 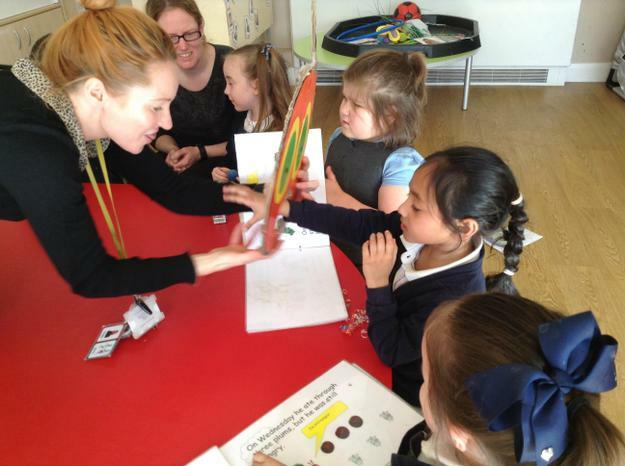 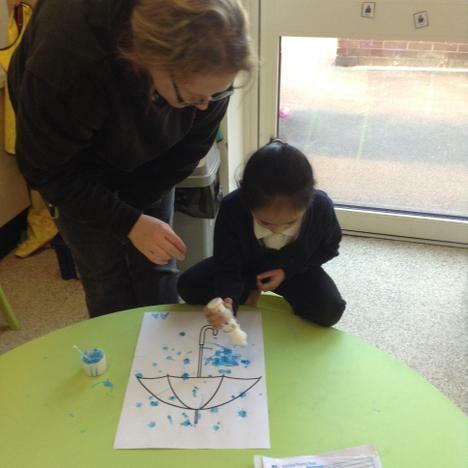 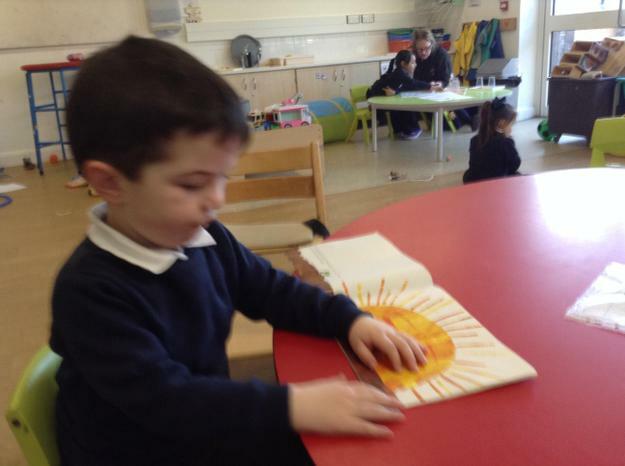 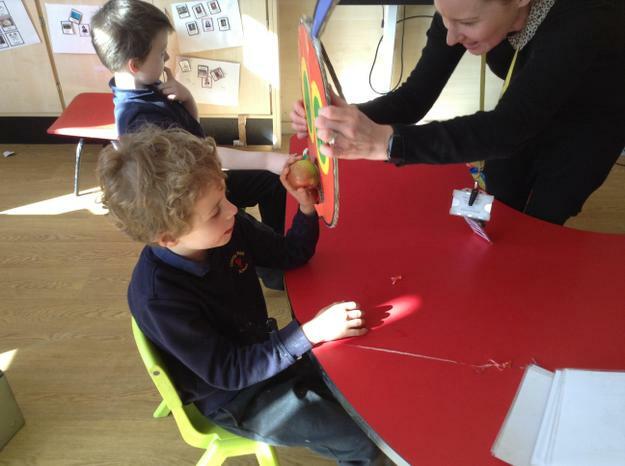 We have also enjoyed a variety of fine motor and early mark making activities linked to our topic of the weather. 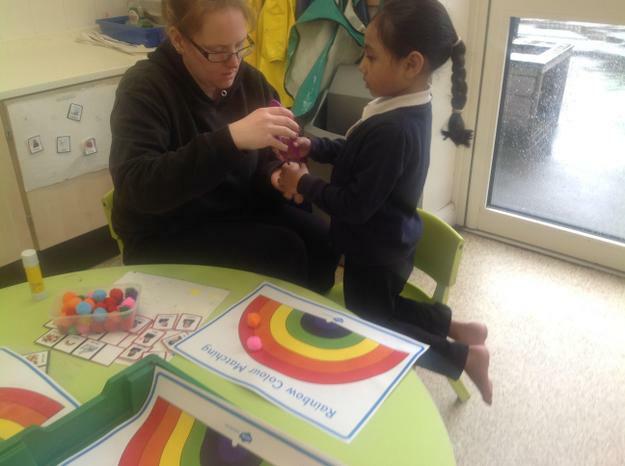 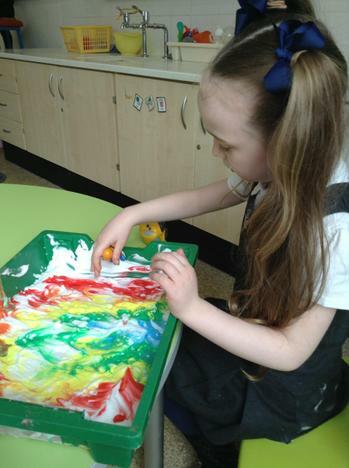 This term we have been looking at rain and rainbows. 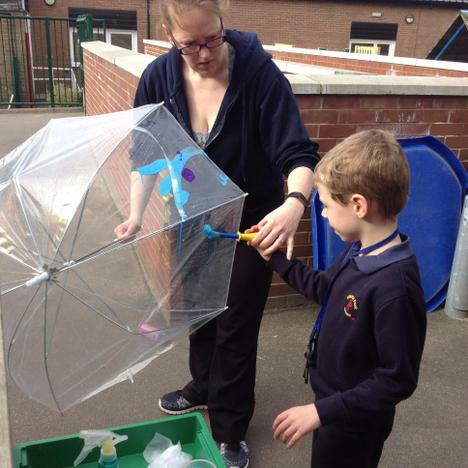 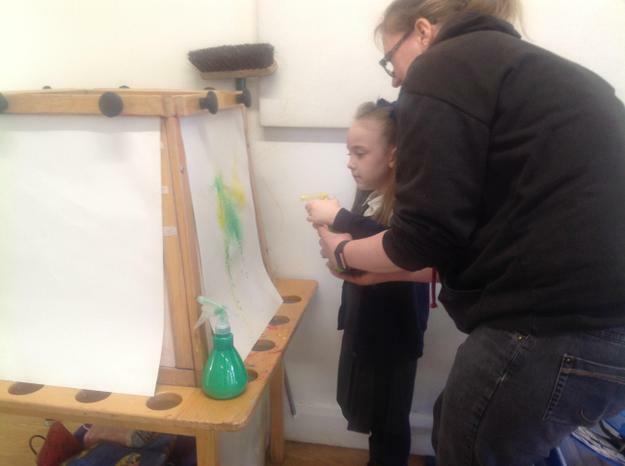 We made raindrop pictures using squeeze droppers, we squired paint from water bottles, we used sweets and pom poms to make coloured rainbows and we did some umbrella painting. 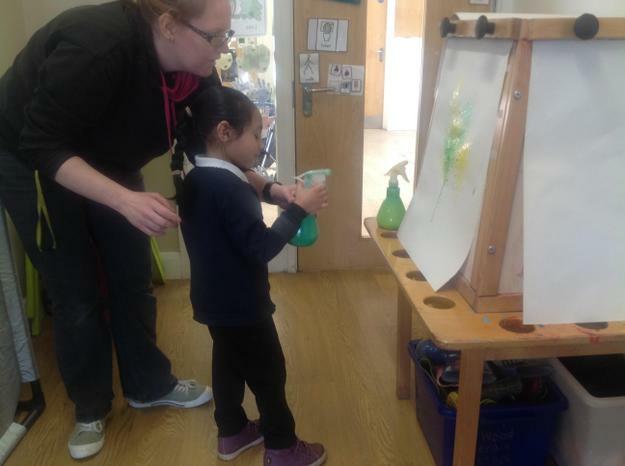 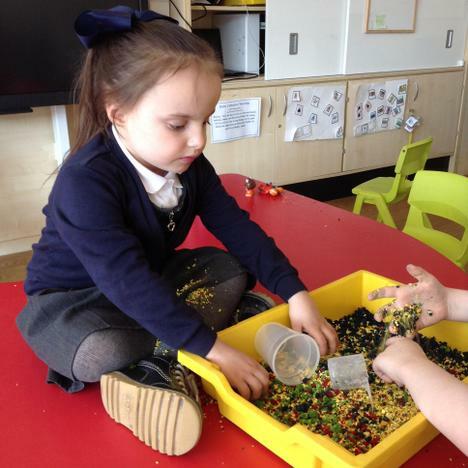 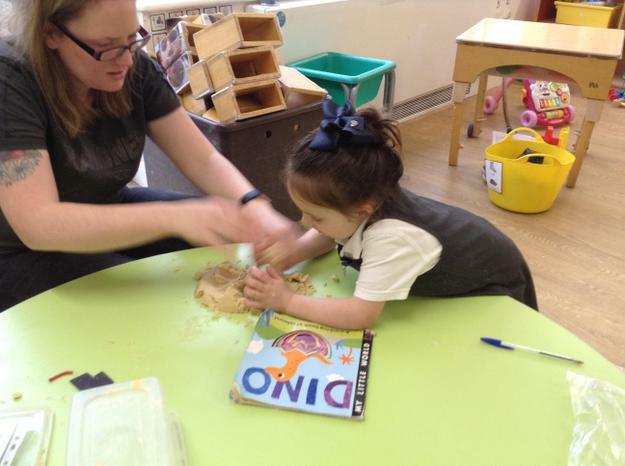 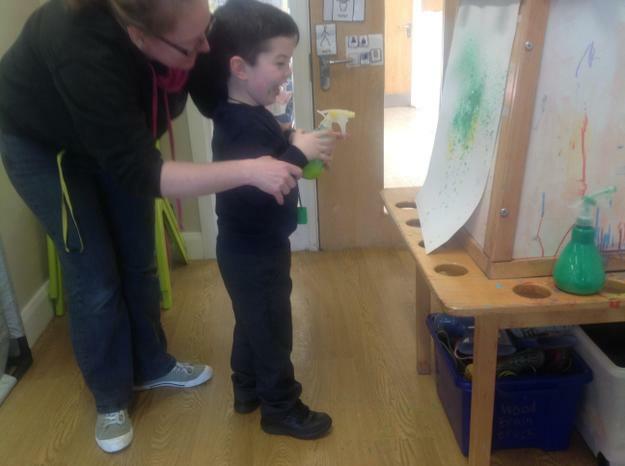 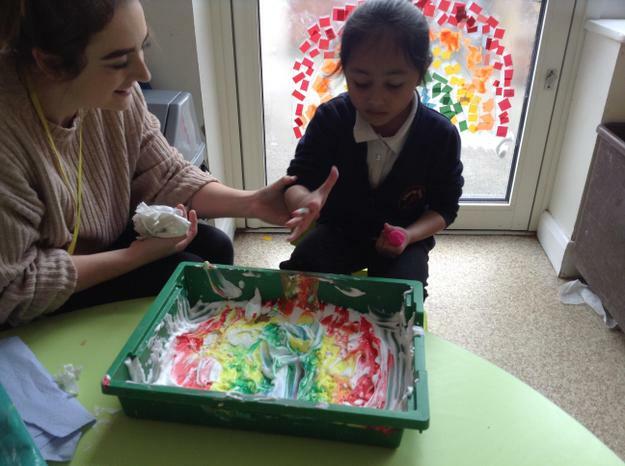 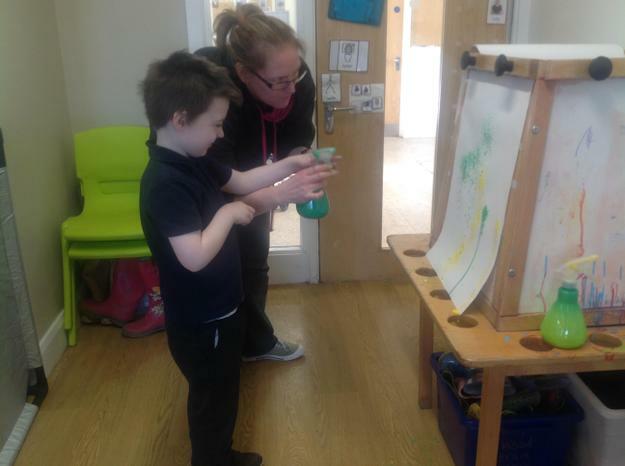 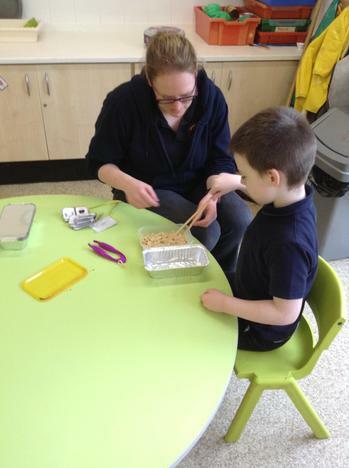 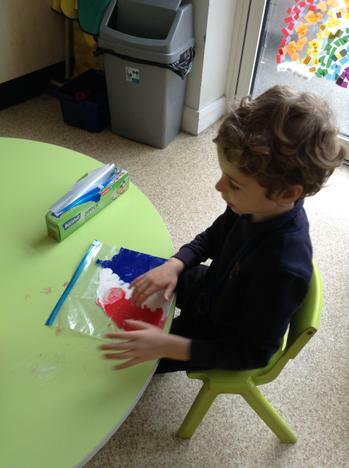 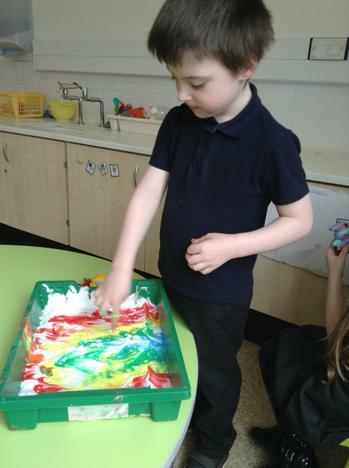 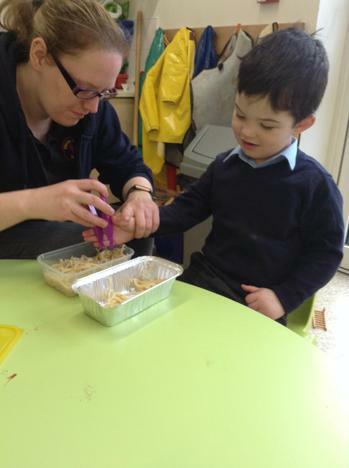 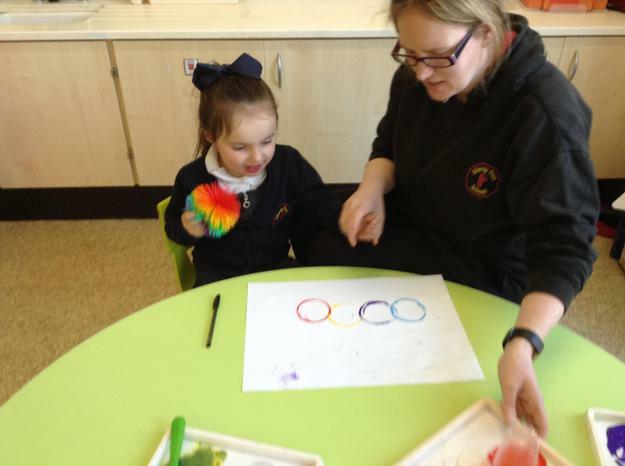 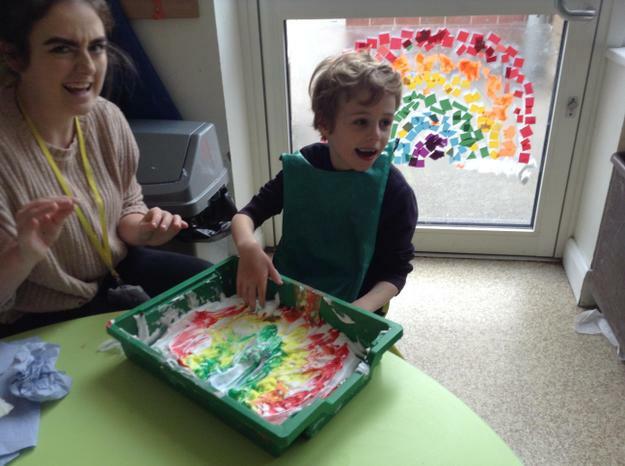 We have also explored some sensory mark making using rainbow oats and shaving foam rainbows. 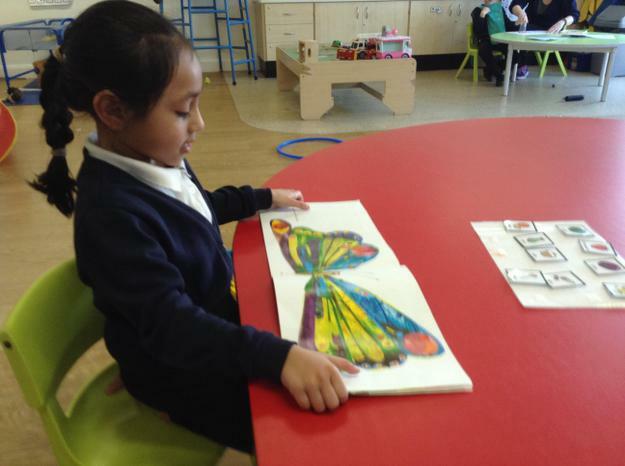 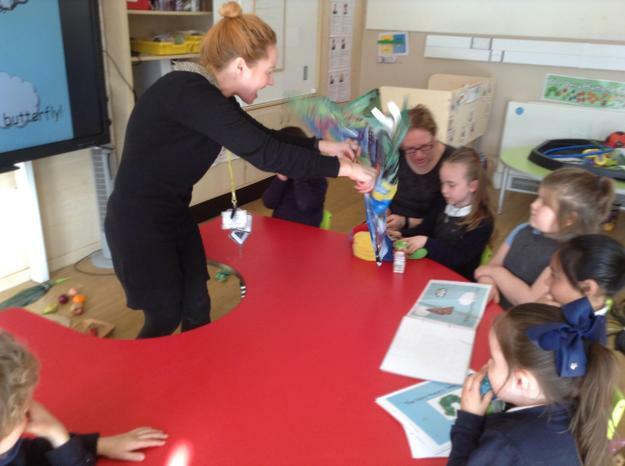 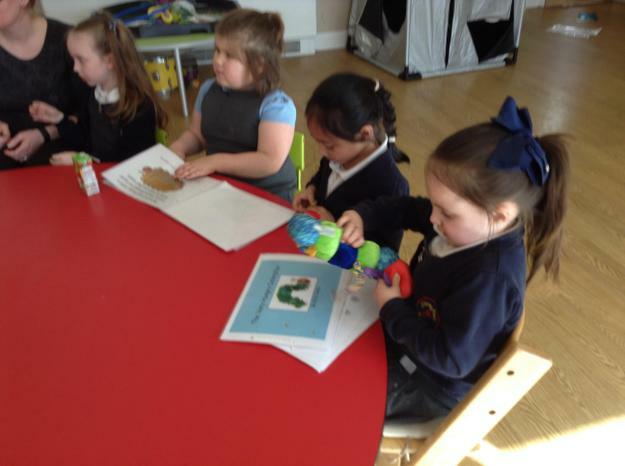 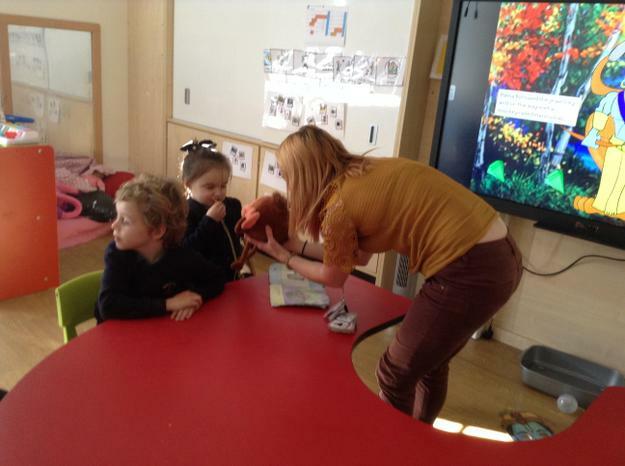 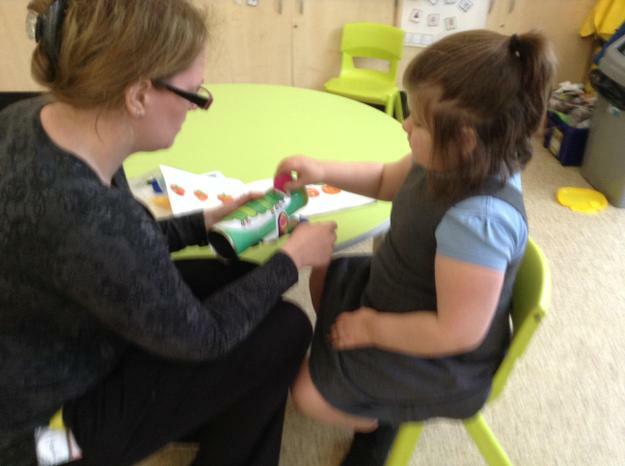 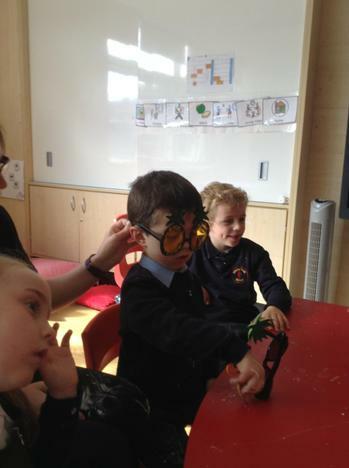 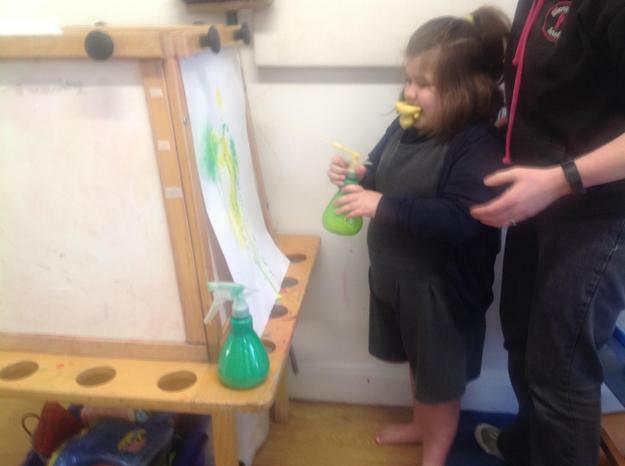 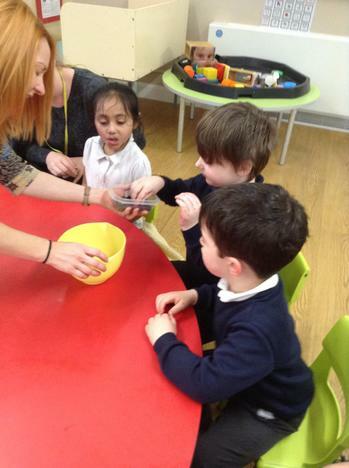 During world book week, we also learnt about the hungry caterpillar story and this involved us posting fruit bottles into the caterpillars mouth and using cup prints to make a caterpillar. 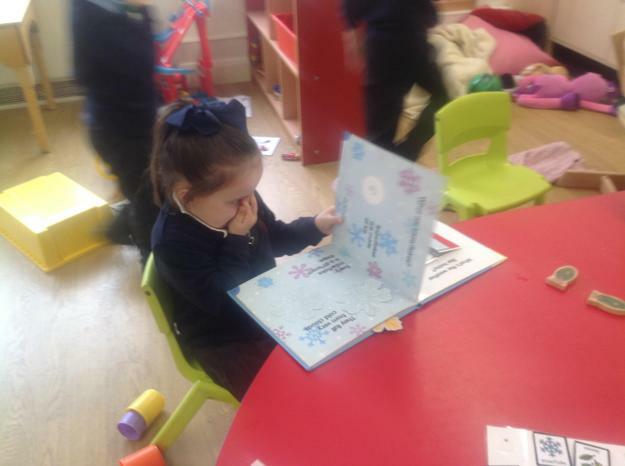 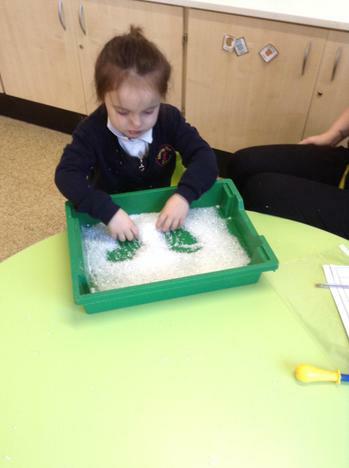 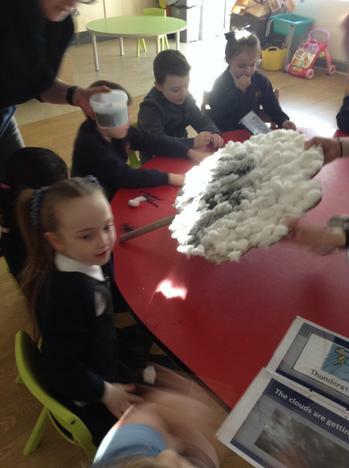 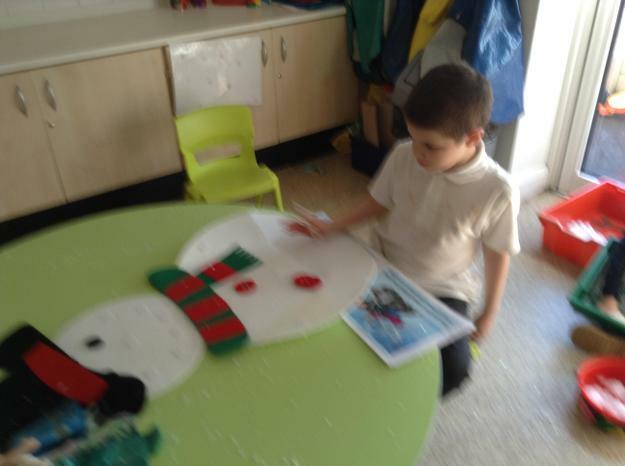 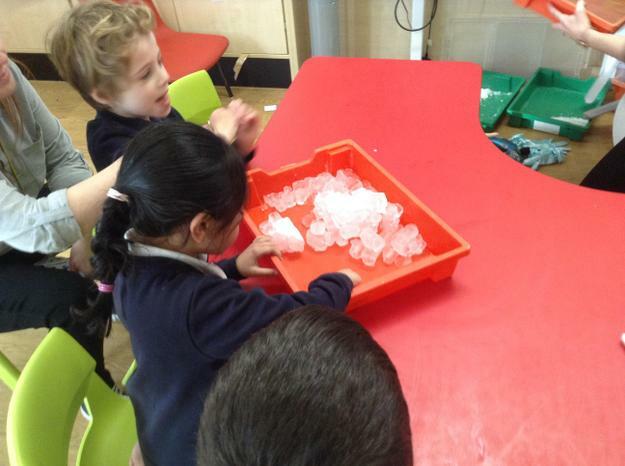 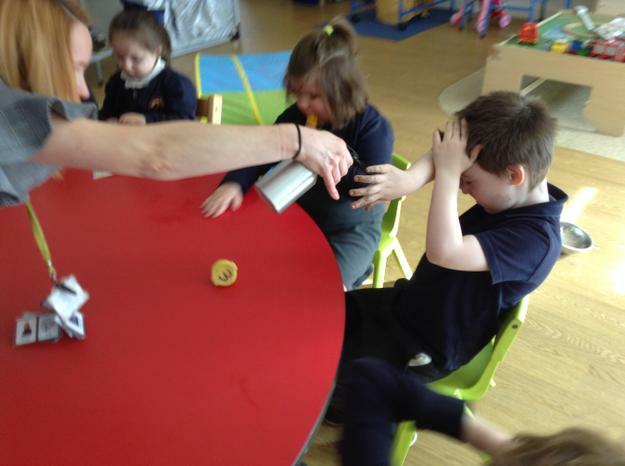 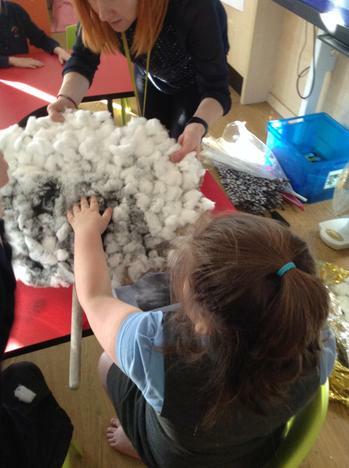 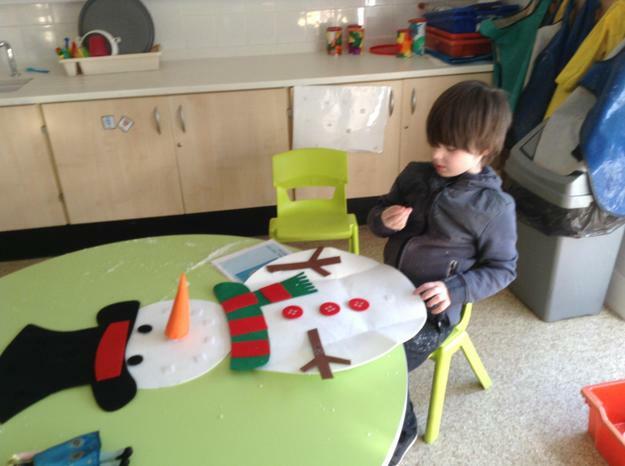 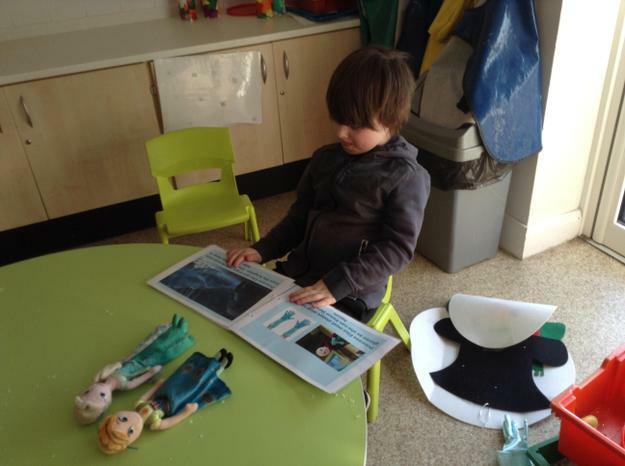 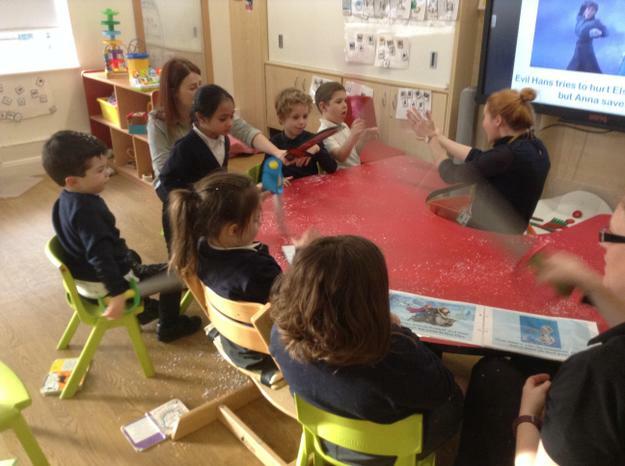 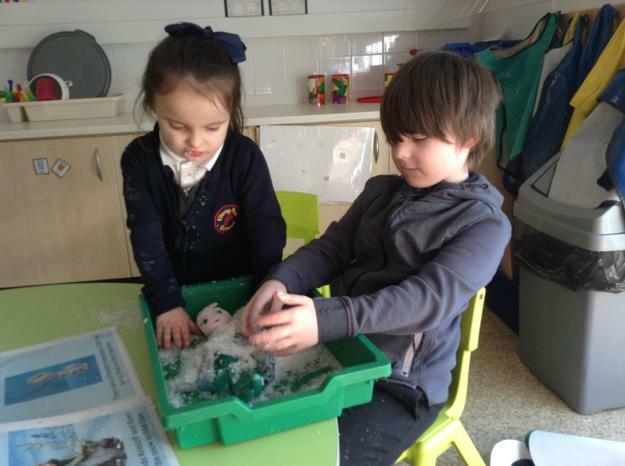 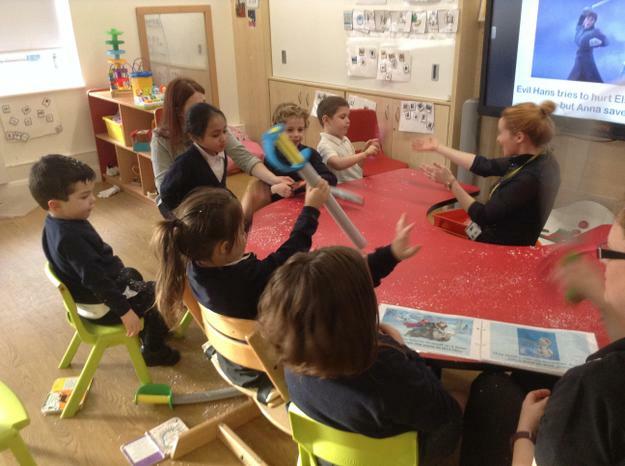 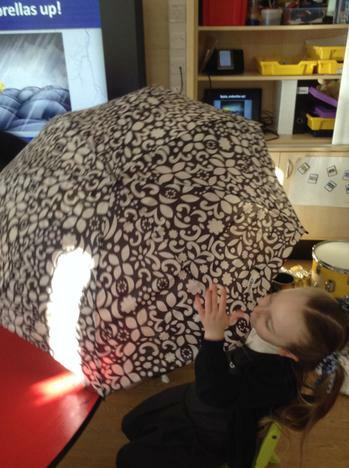 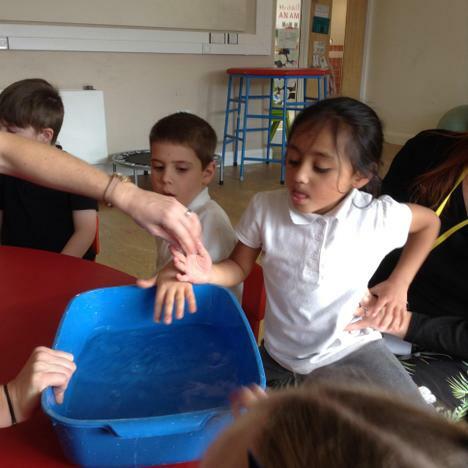 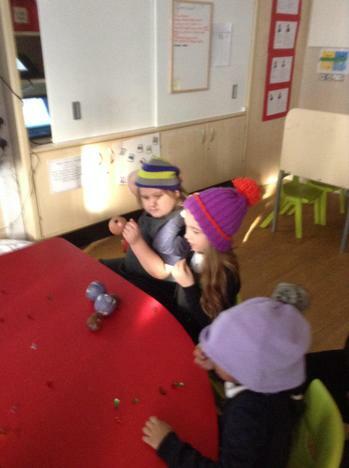 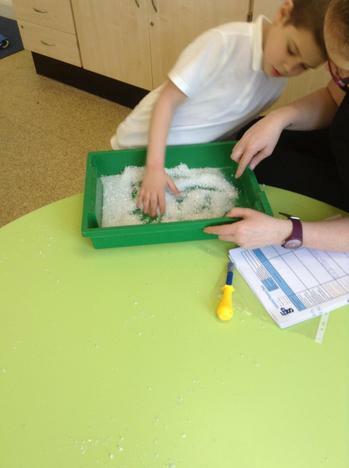 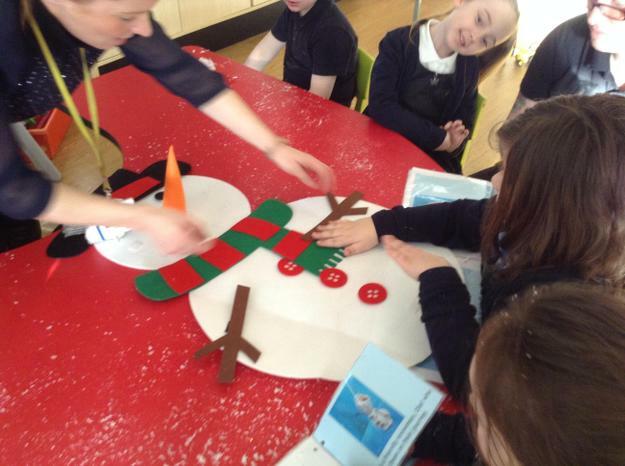 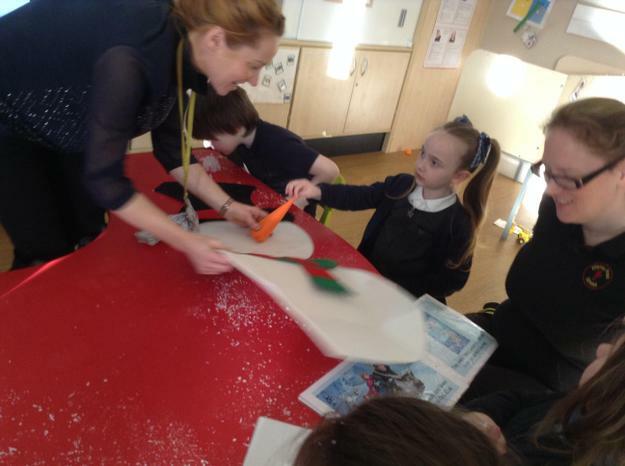 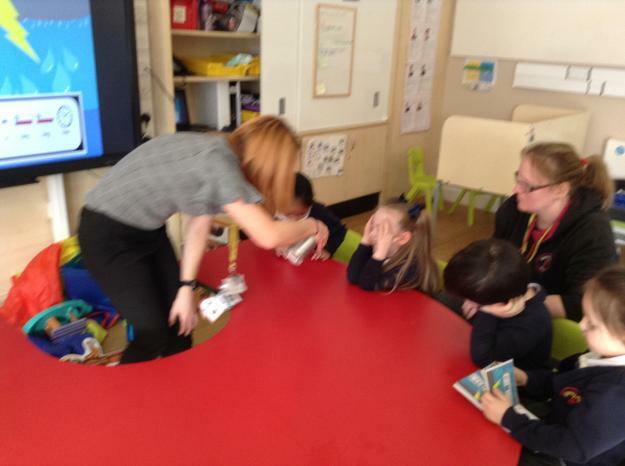 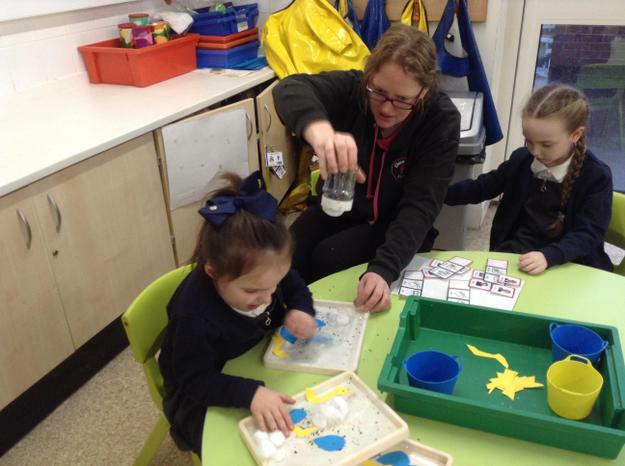 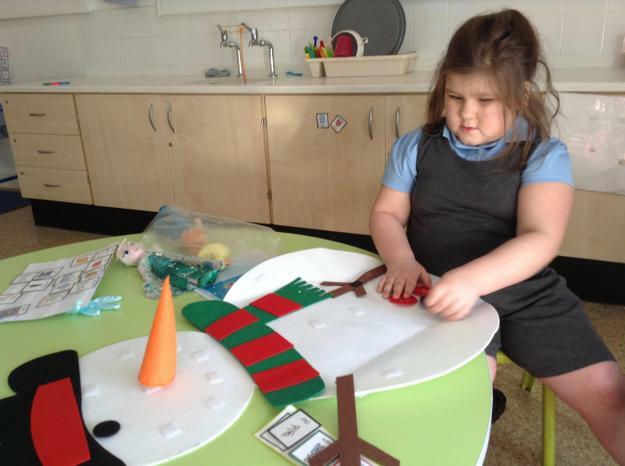 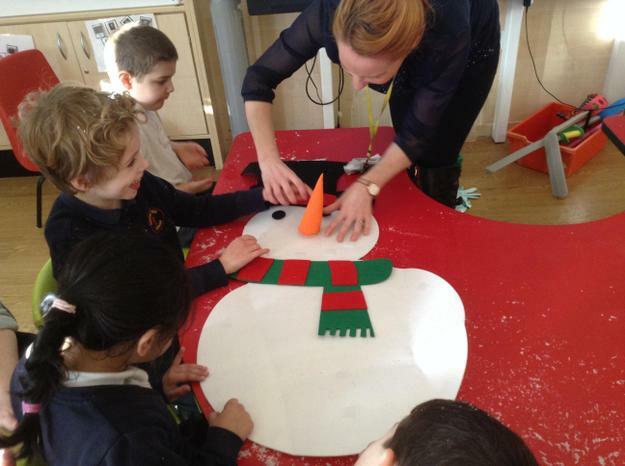 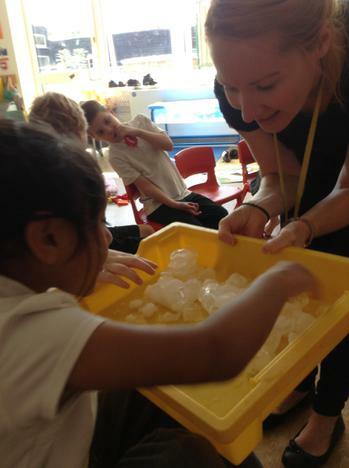 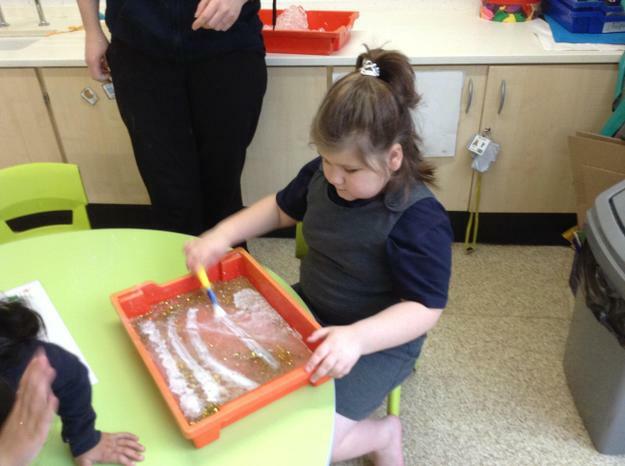 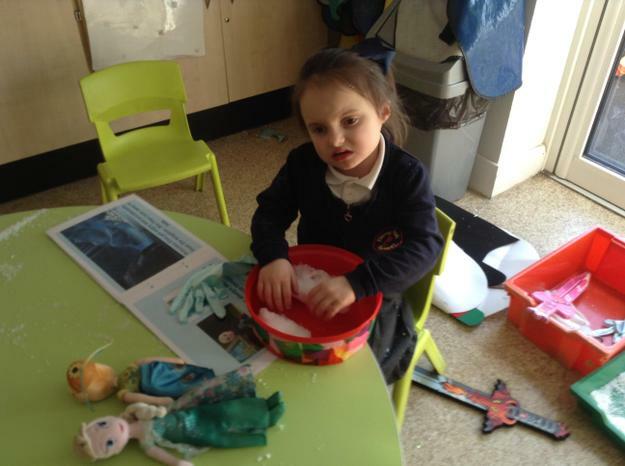 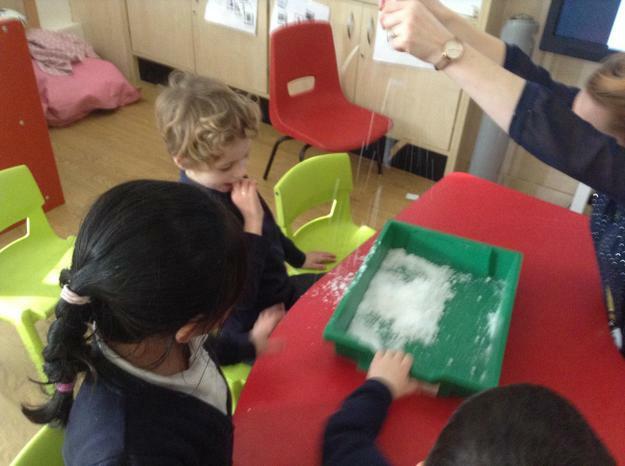 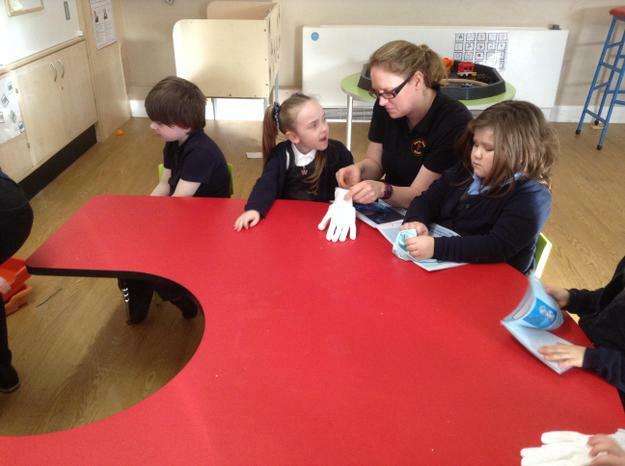 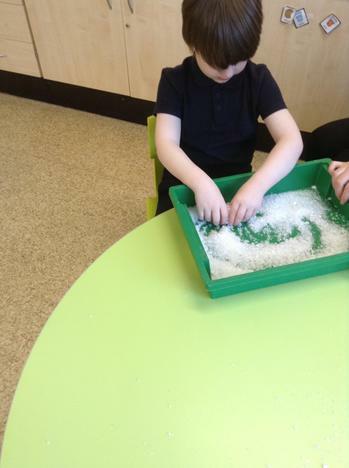 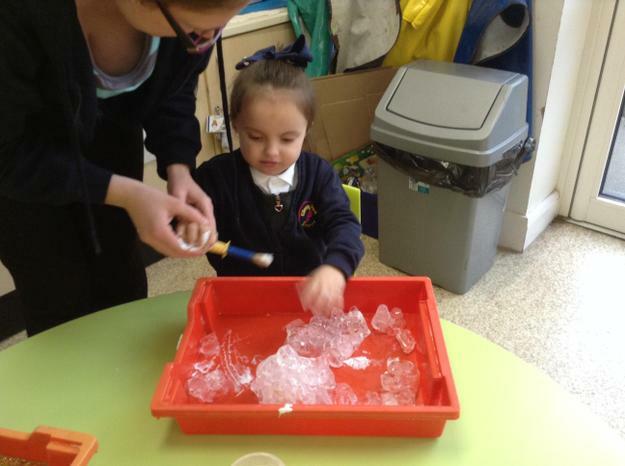 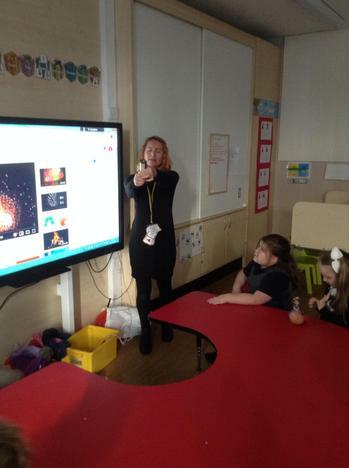 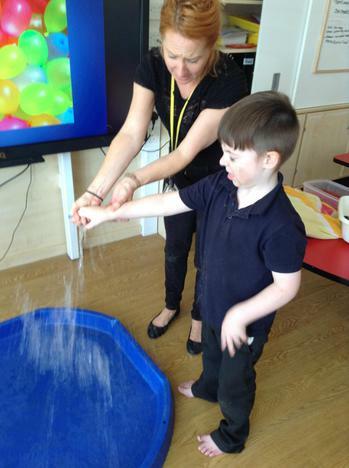 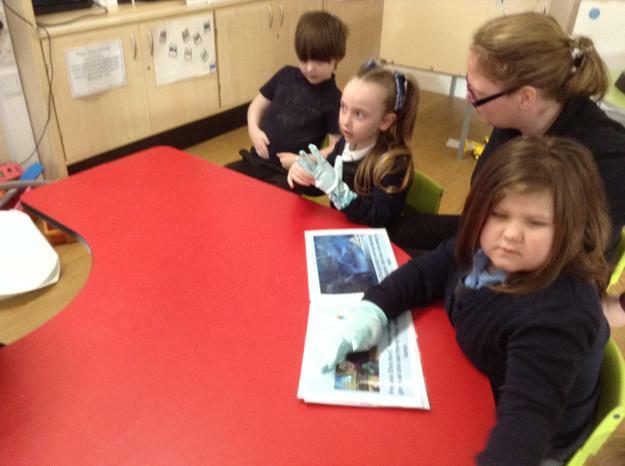 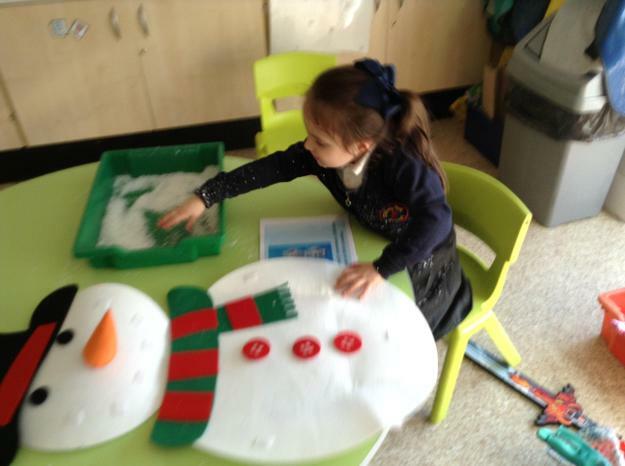 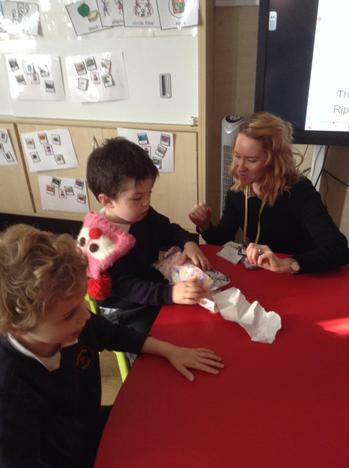 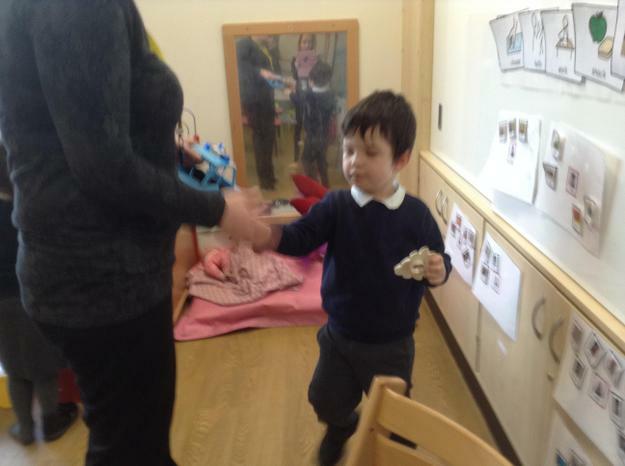 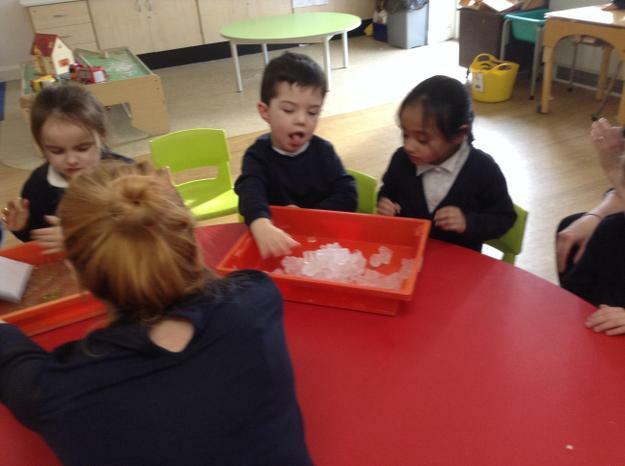 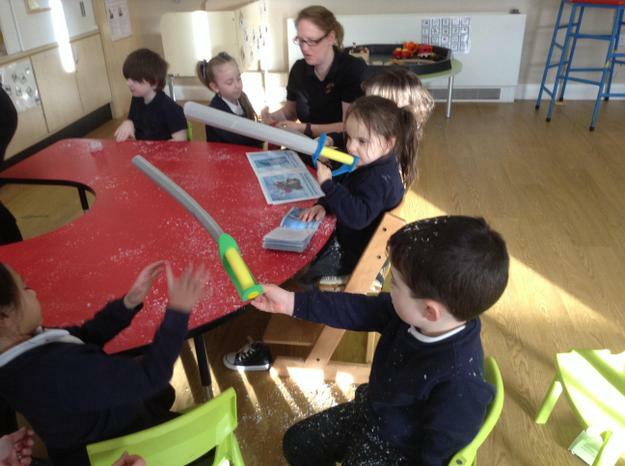 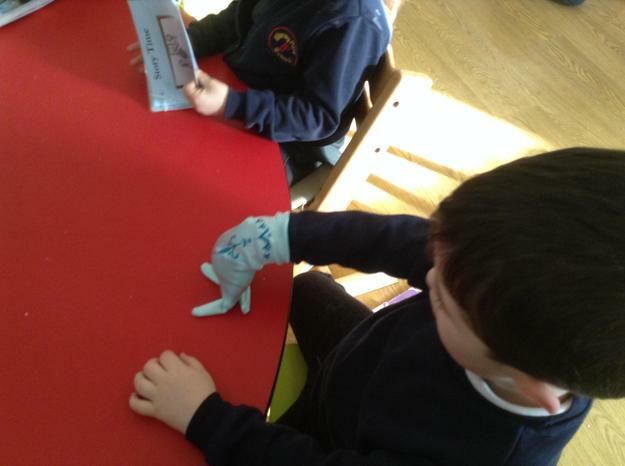 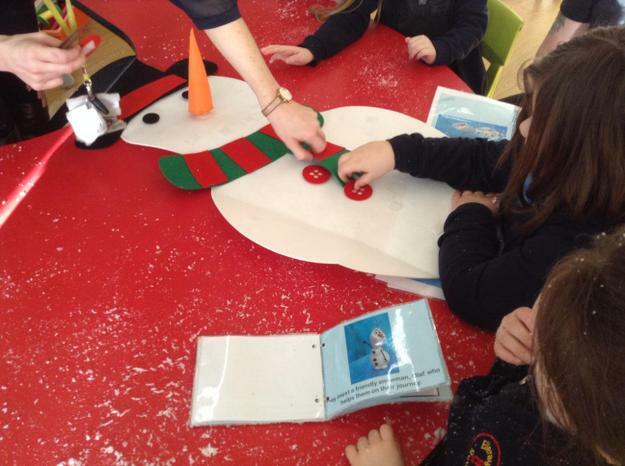 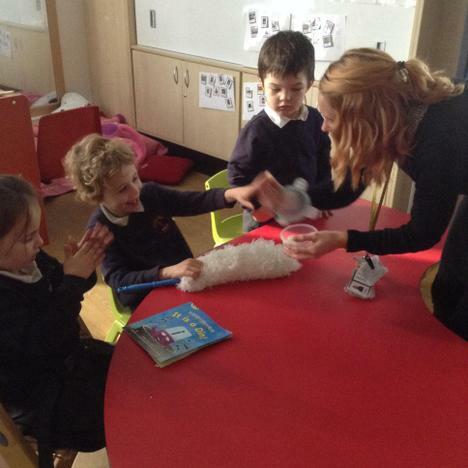 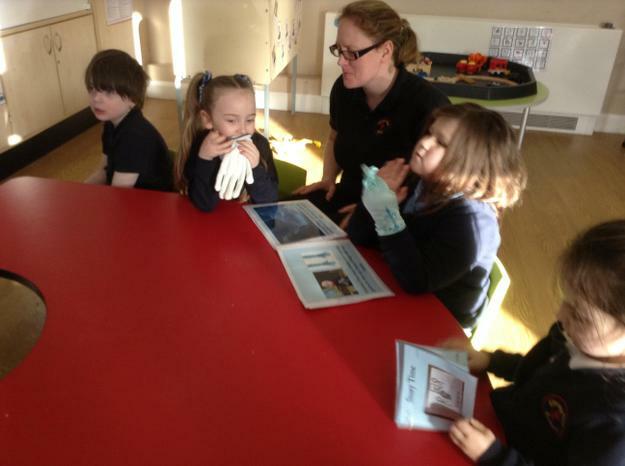 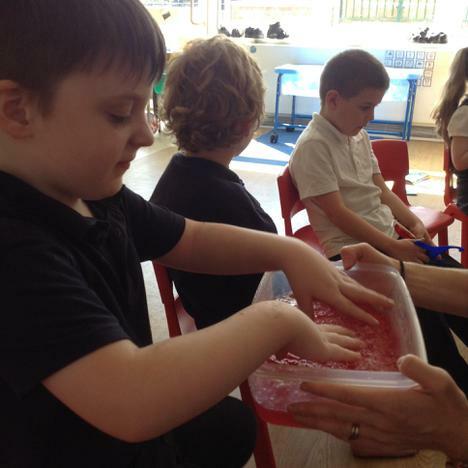 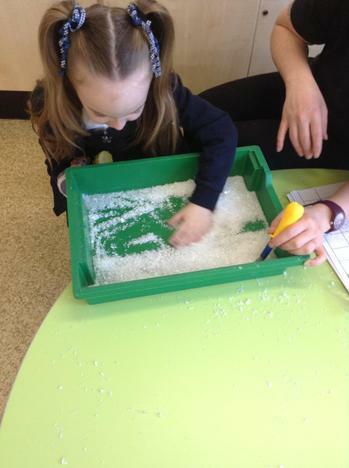 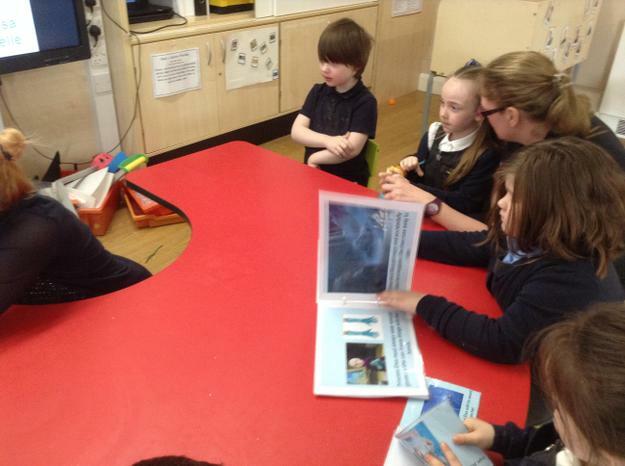 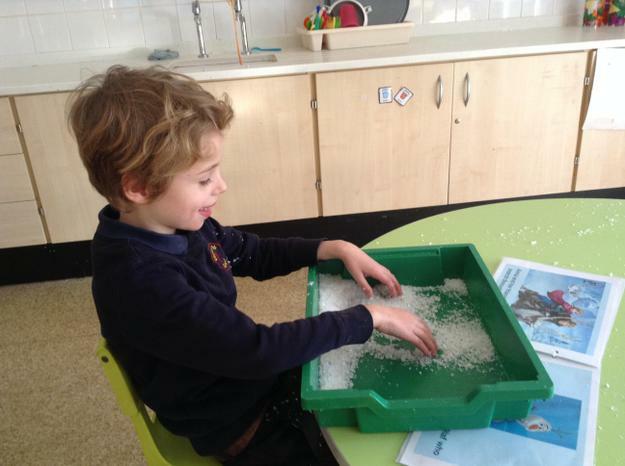 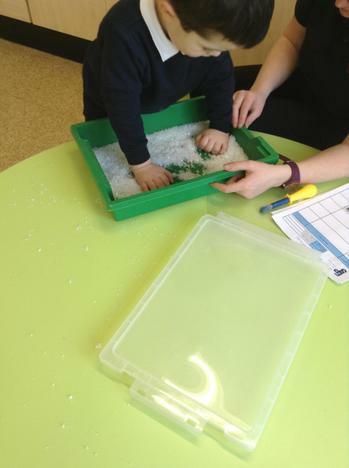 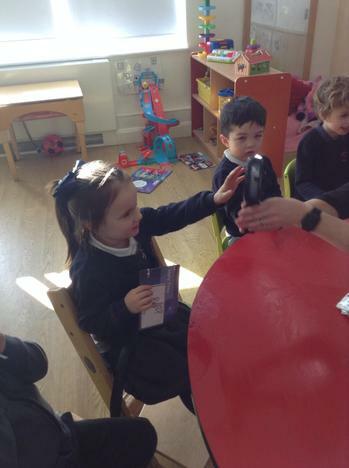 As we have been learning all about the weather this term our first sensory story was all about snow and ice. 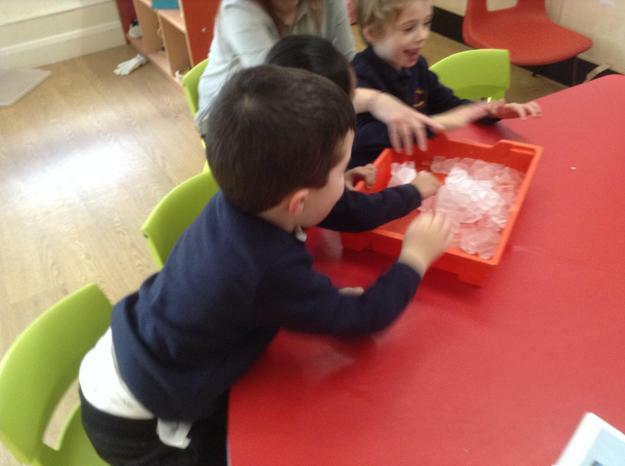 We used the movie 'Frozen' as our theme. 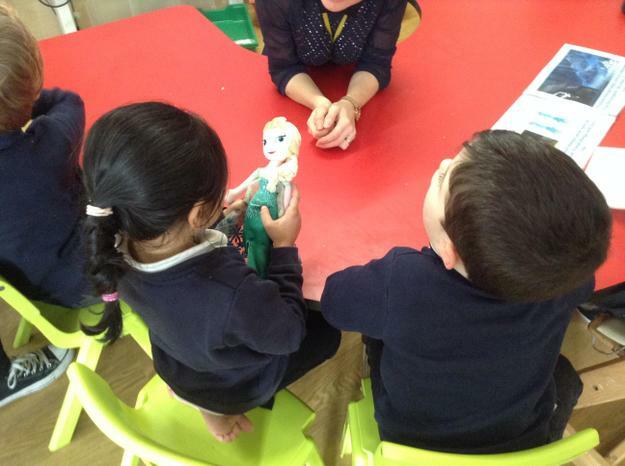 We met the Princesses Anna and Elsa, tried on Elsa's special gloves, battled through the ice and snow to find Elsa and even built a snowman along the way. 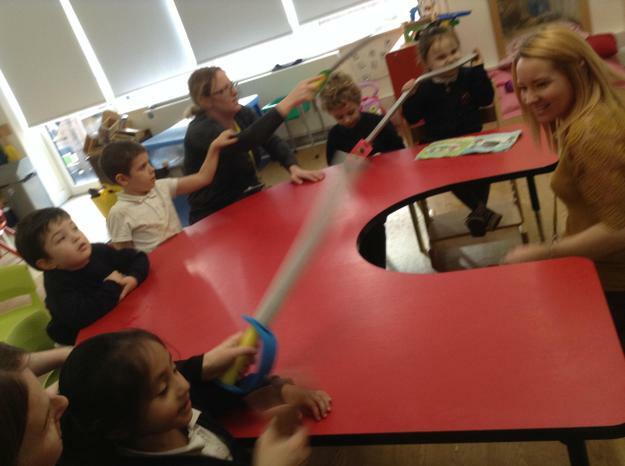 At the end we had a sword fight to save Elsa from the evil Prince. 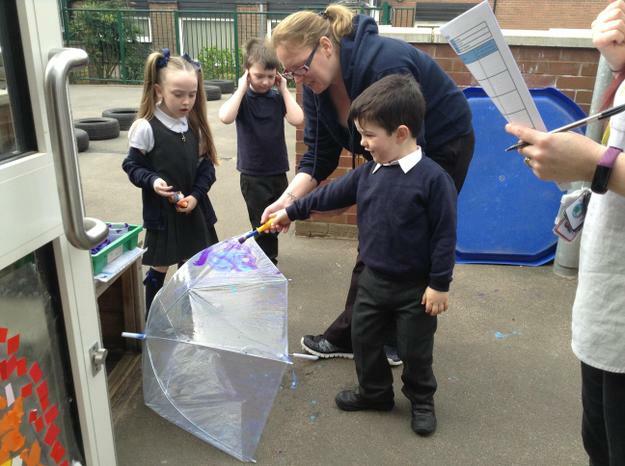 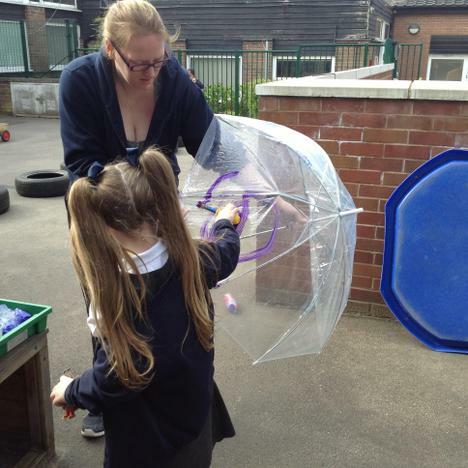 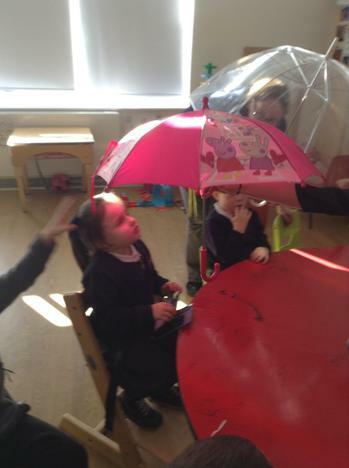 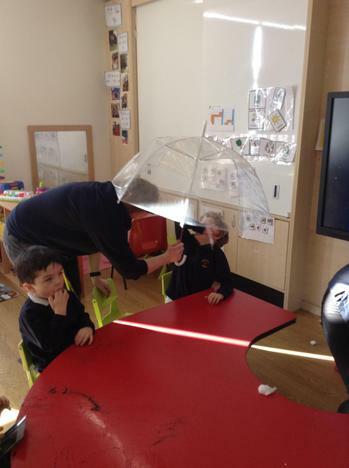 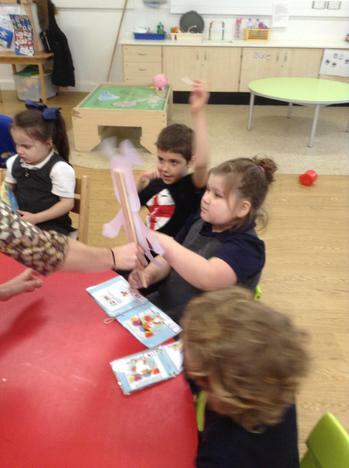 We then learnt about thunderstorms so our story featured dark clouds, lots of rain - we had to put our umbrellas up!. 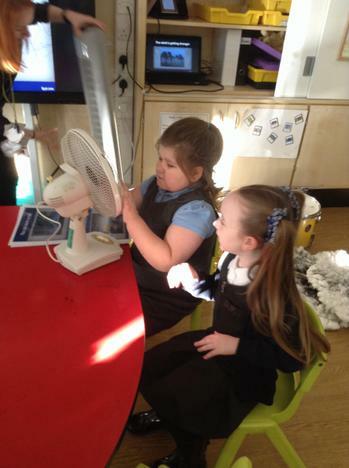 We felt the strong winds by exploring fans. 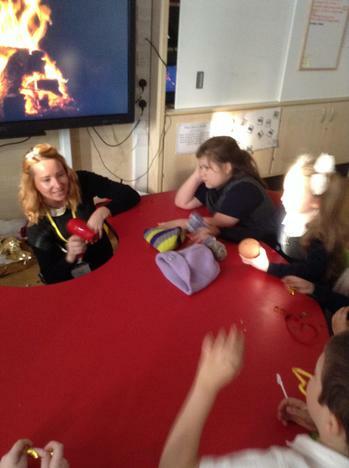 Then there was flashes of lightning (using torches) and rumbles of loud thunder using drums. 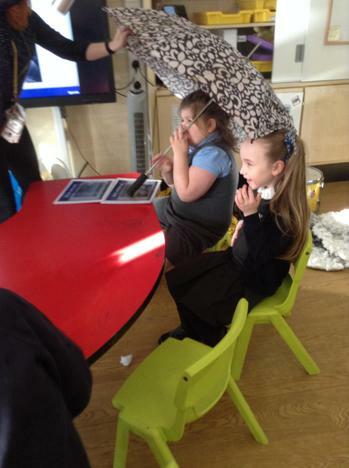 It was so scary we had to run and take cover in our tent! 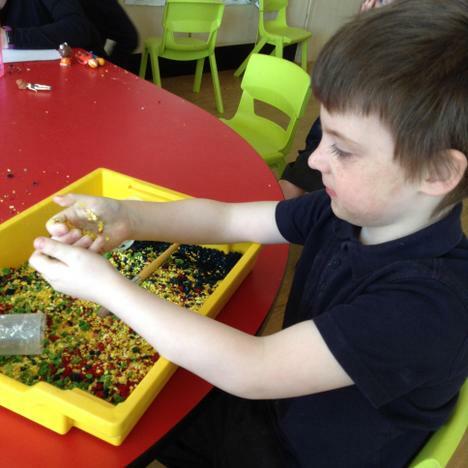 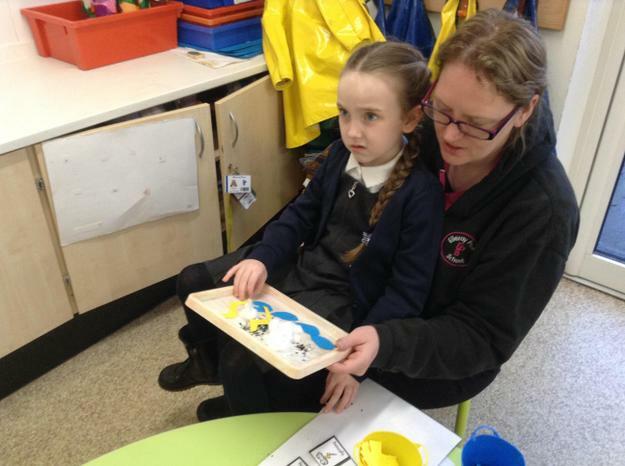 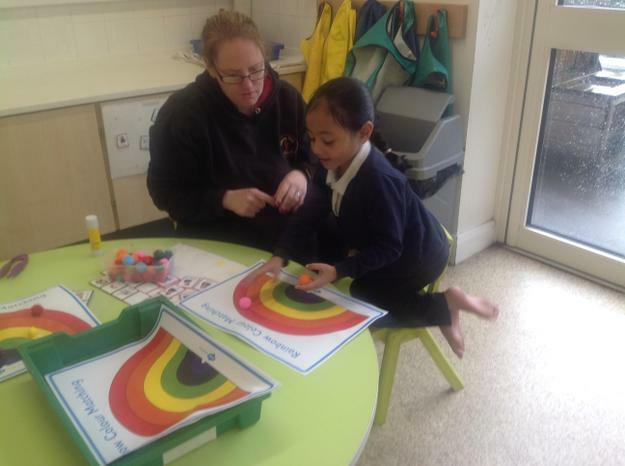 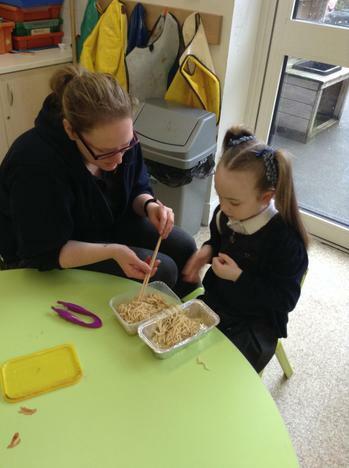 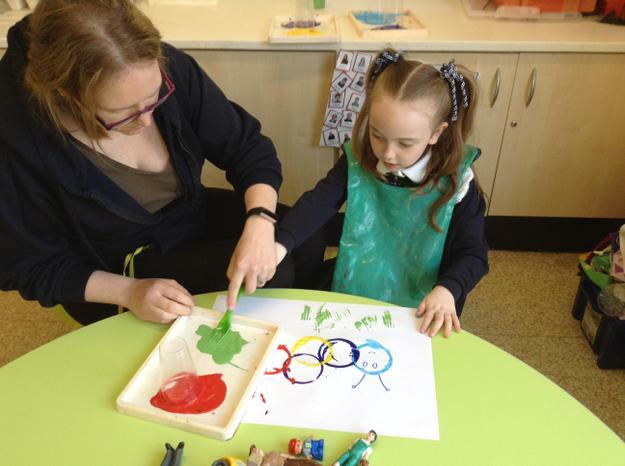 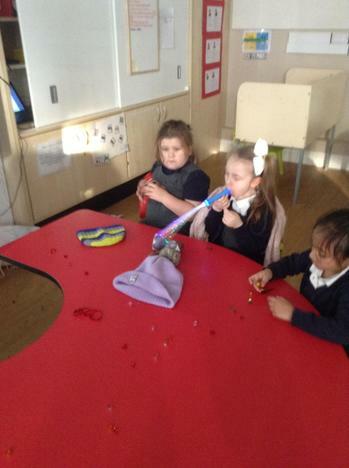 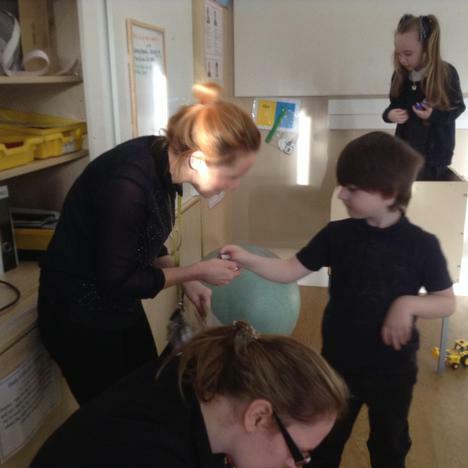 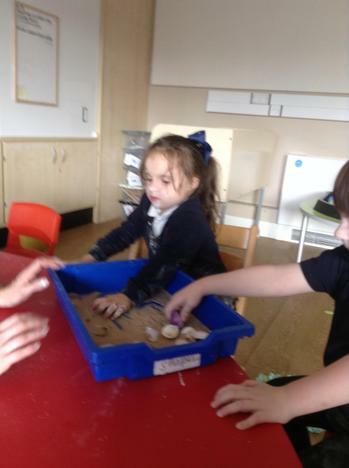 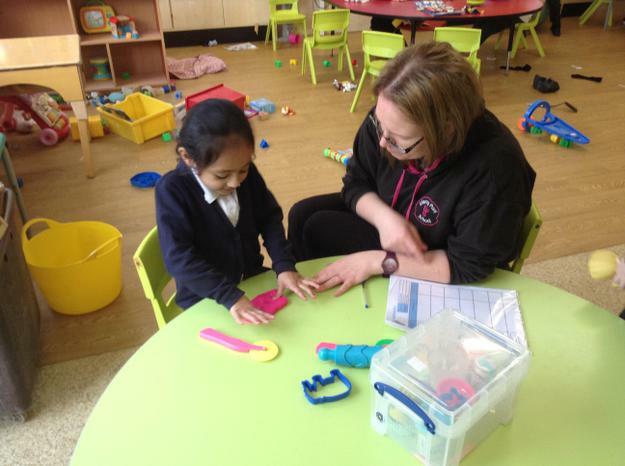 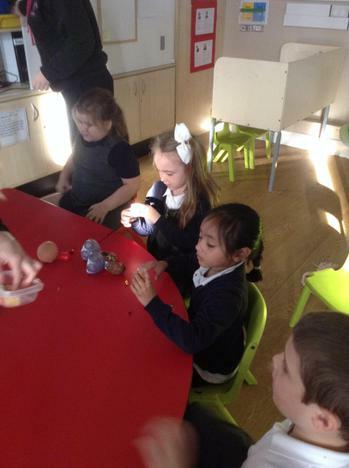 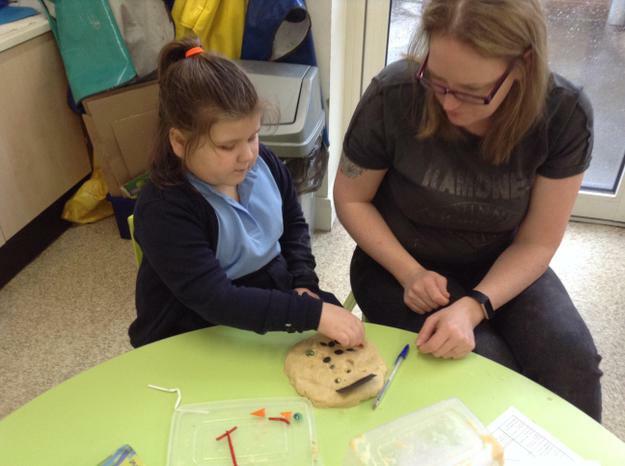 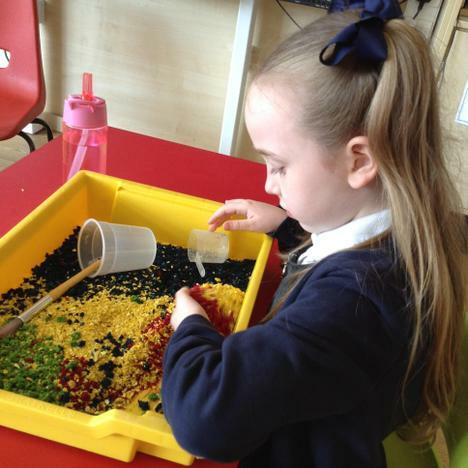 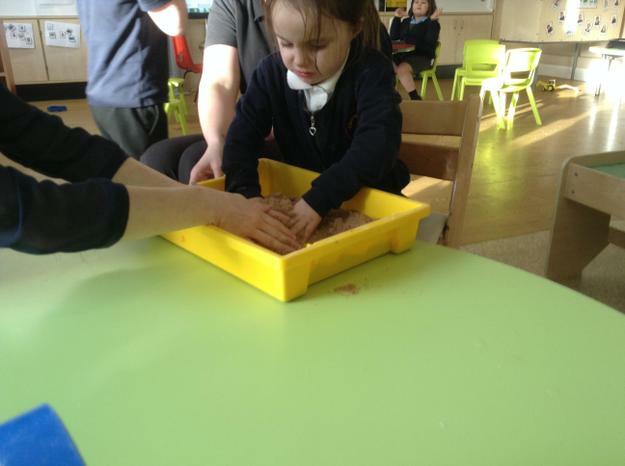 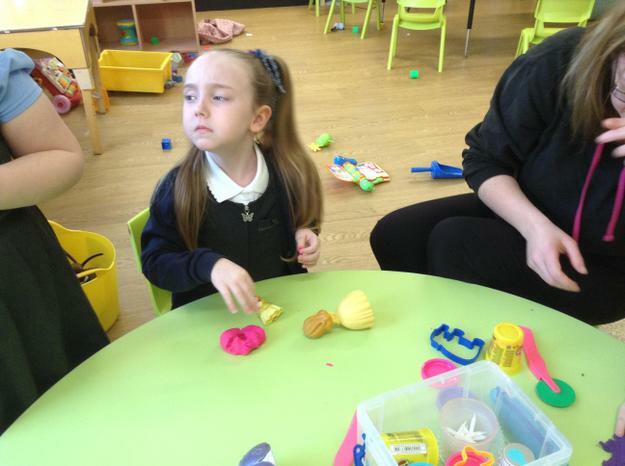 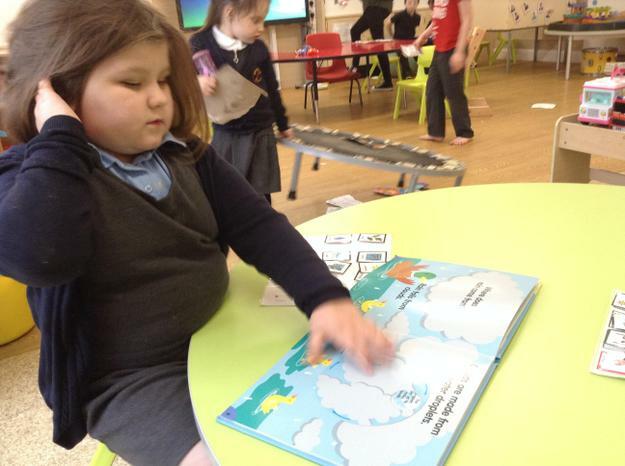 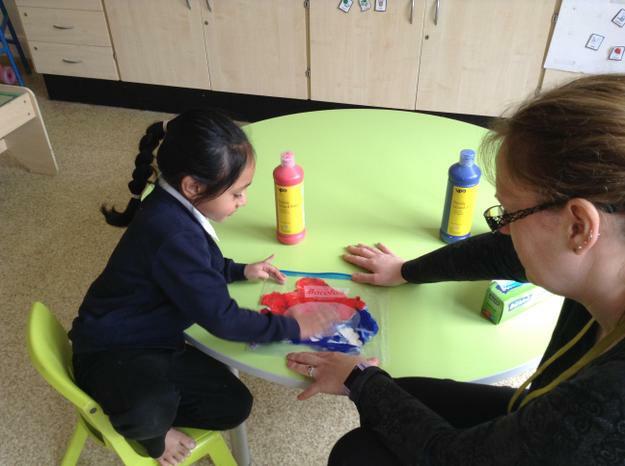 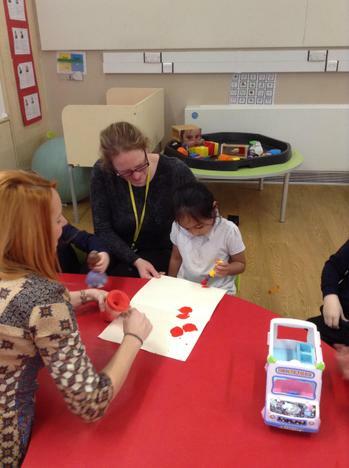 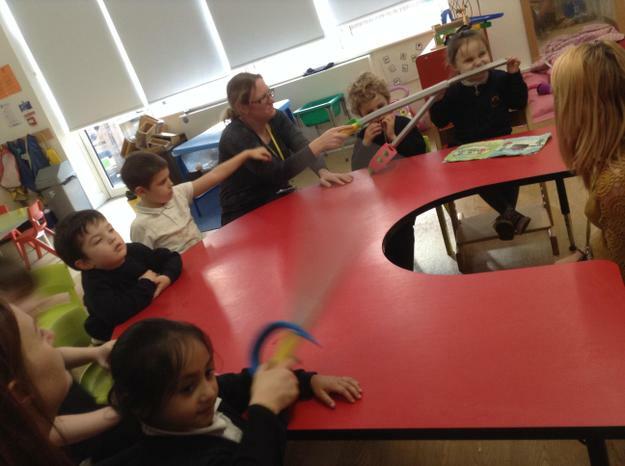 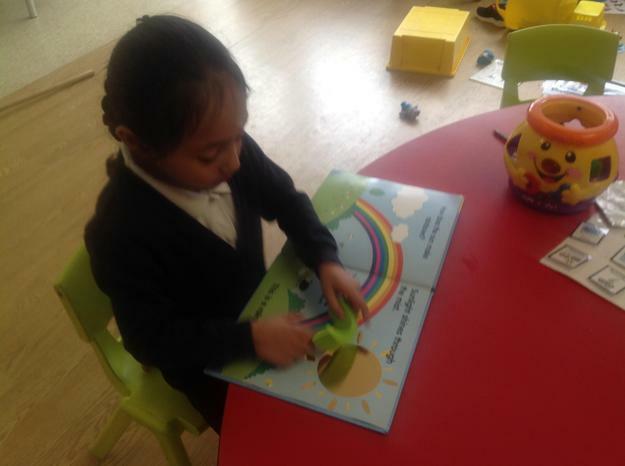 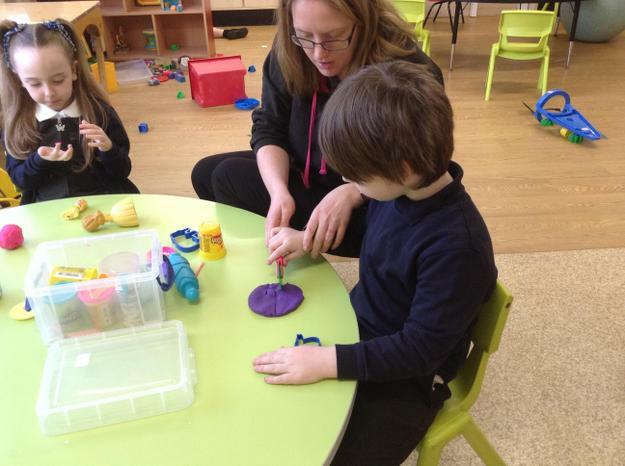 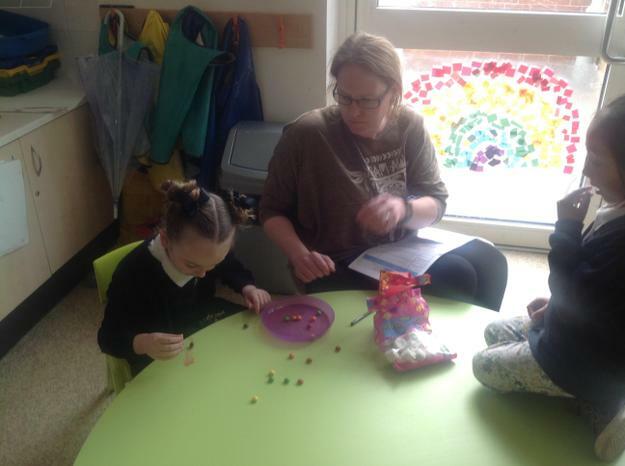 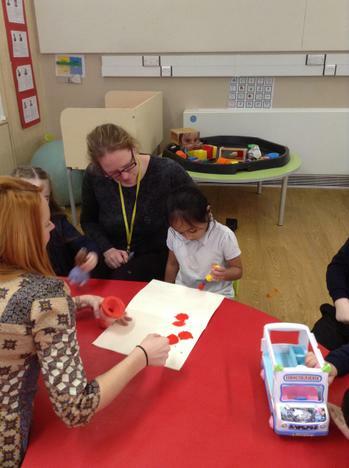 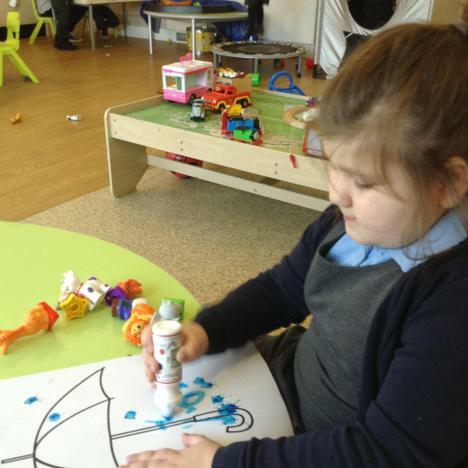 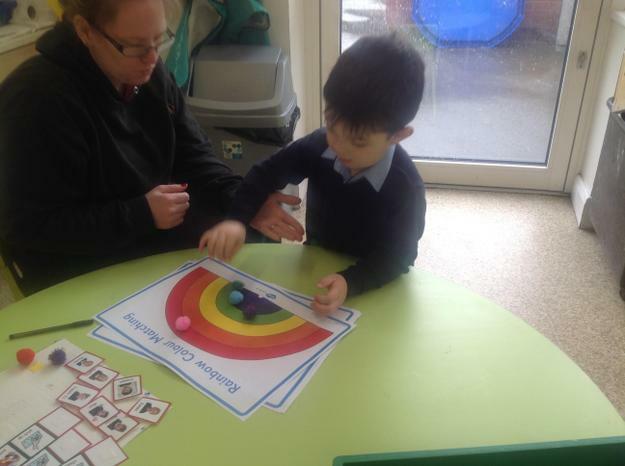 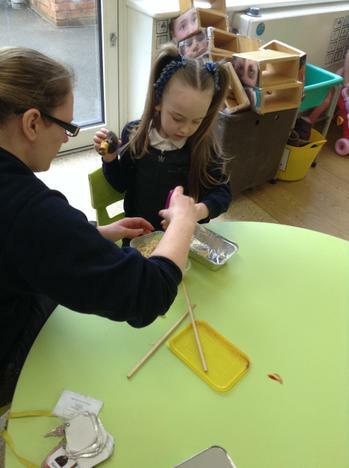 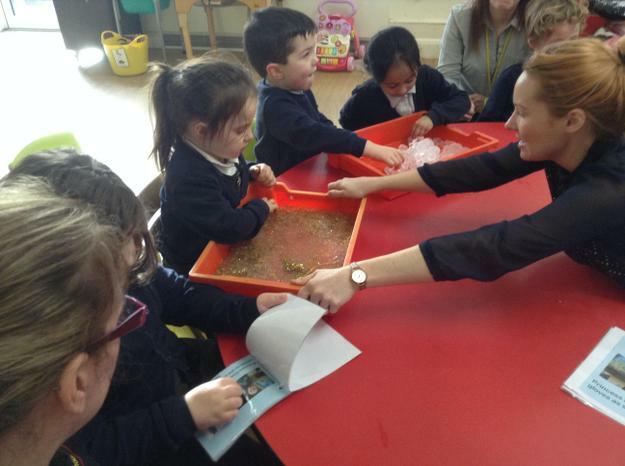 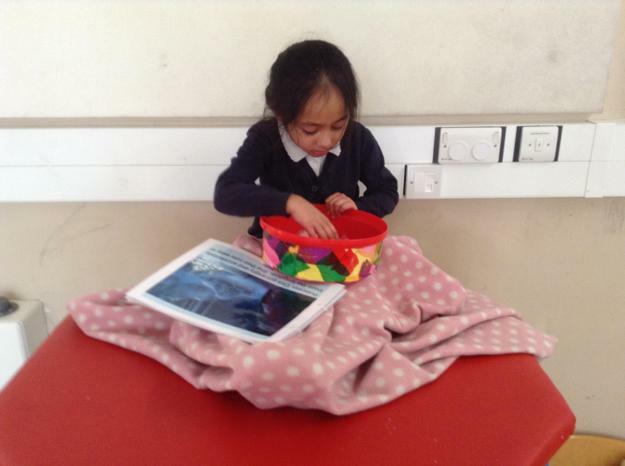 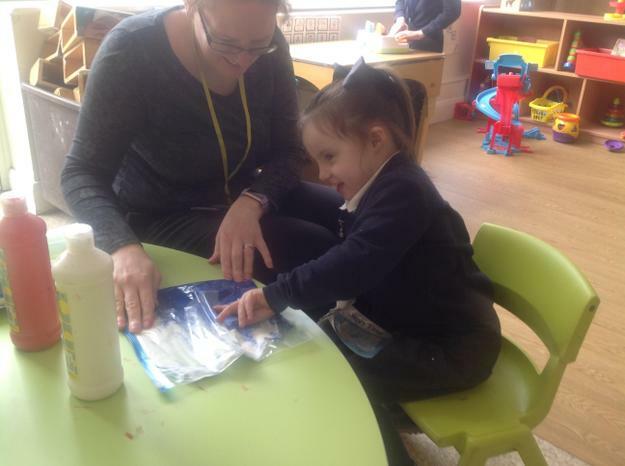 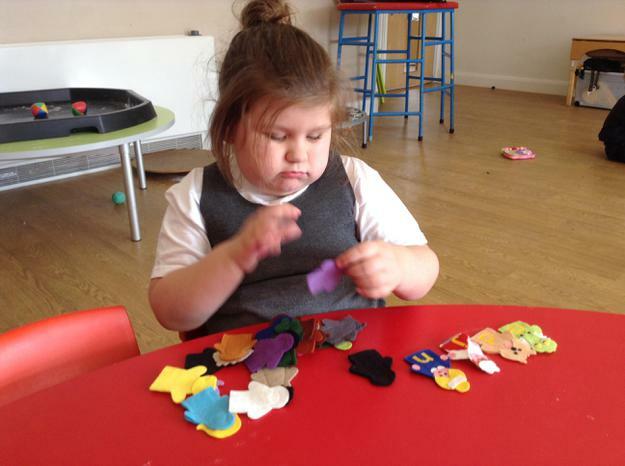 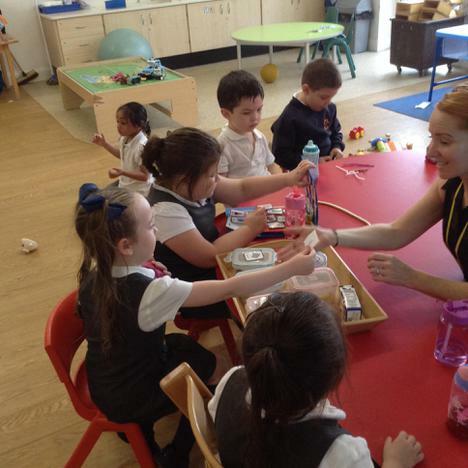 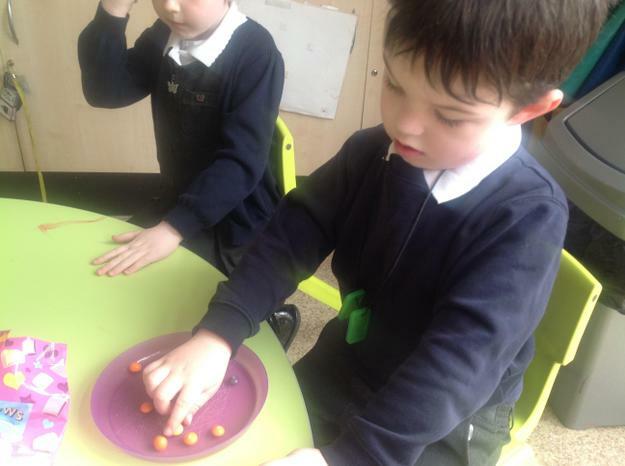 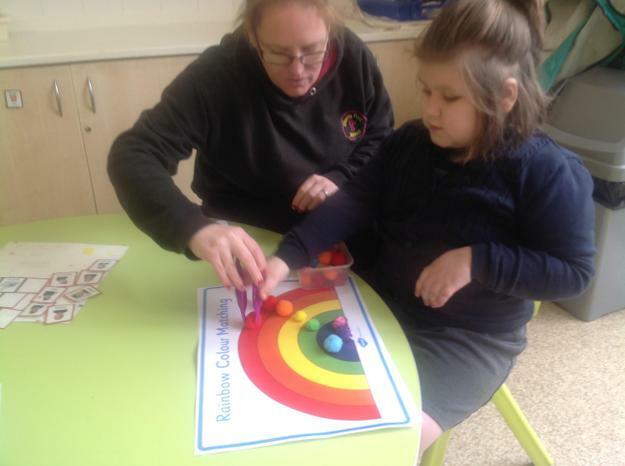 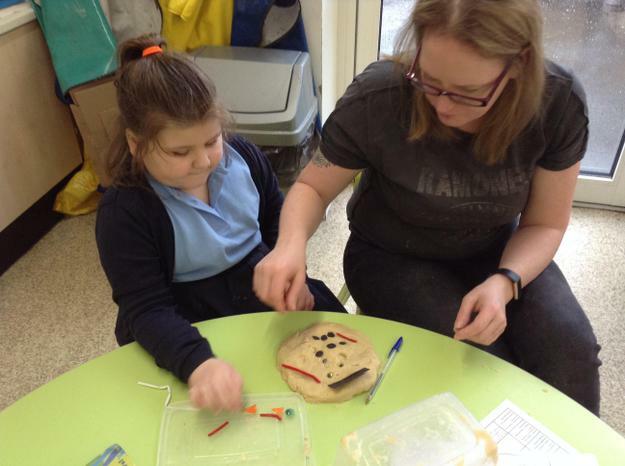 During our literacy sessions this term we have been developing our fine motor skills using a range of activities such as using playdough, tweezers, scissors and picking up and sticking small objects to make weather pictures. 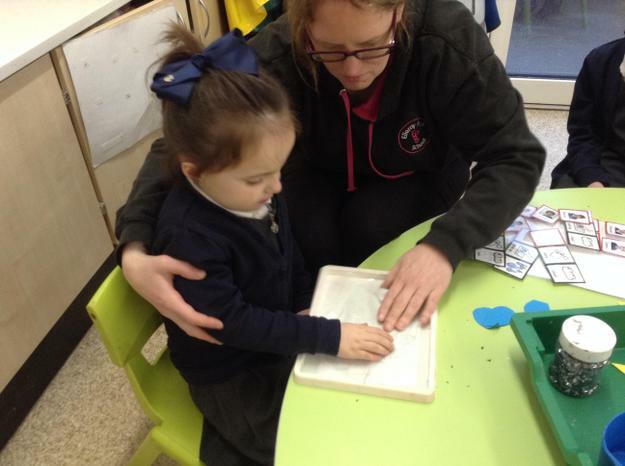 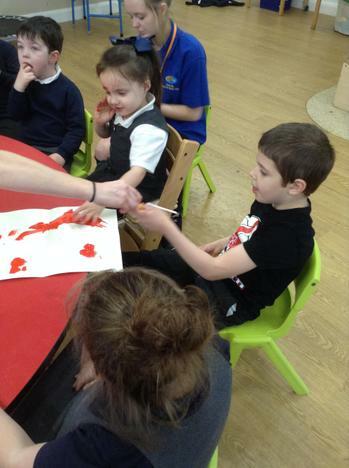 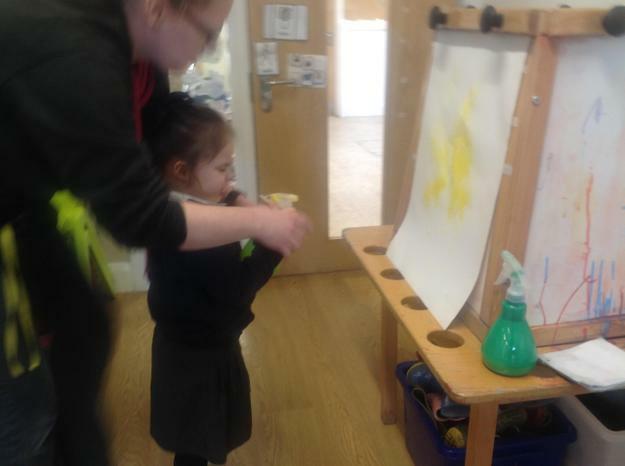 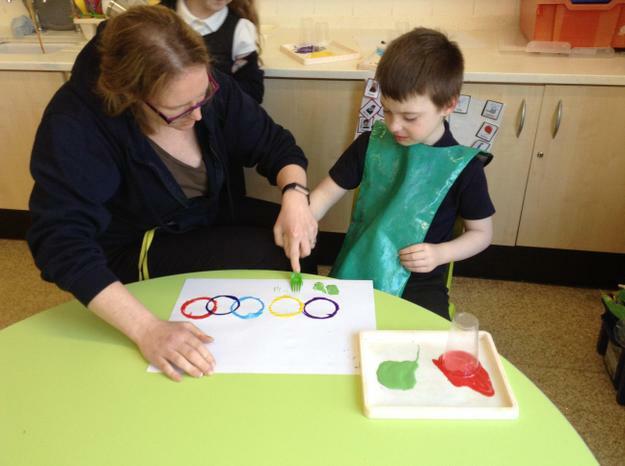 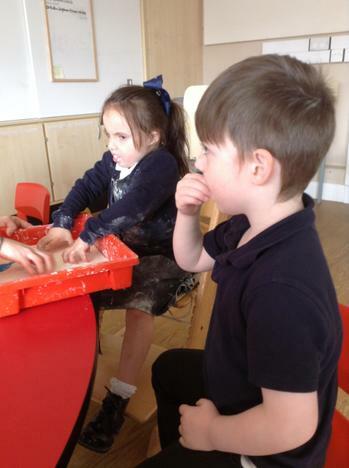 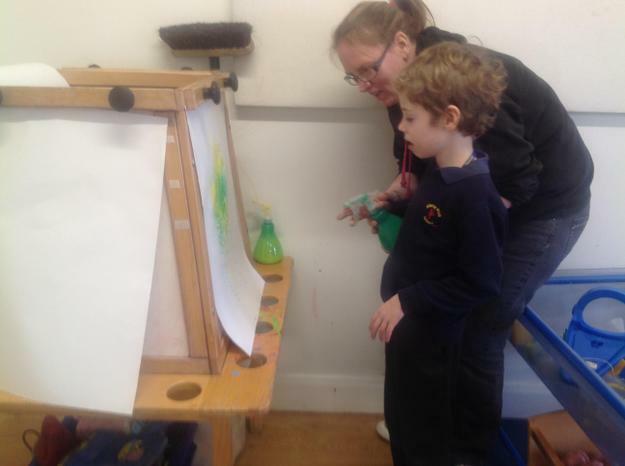 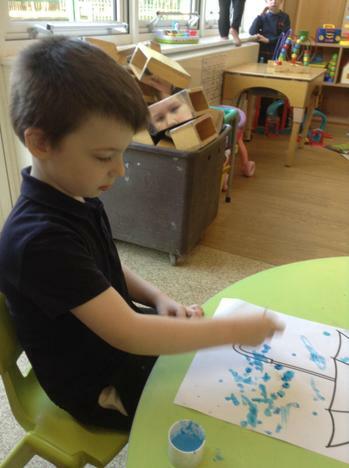 We have also been exploring making marks using a range of media such as paint, pens, brushes and of course our fingers! 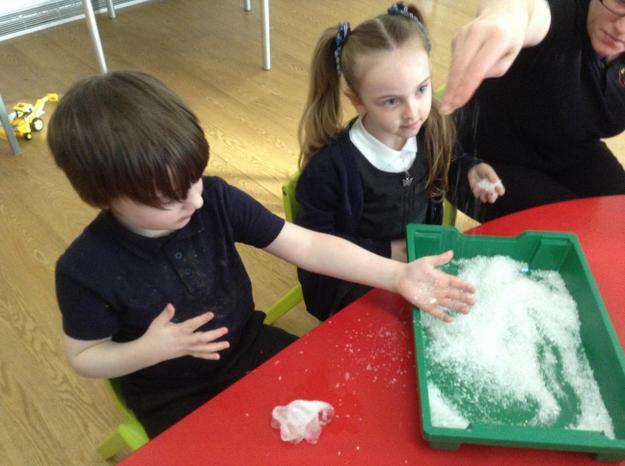 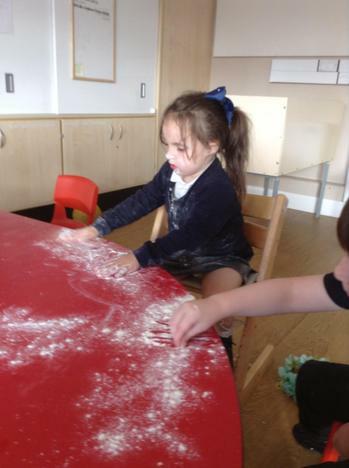 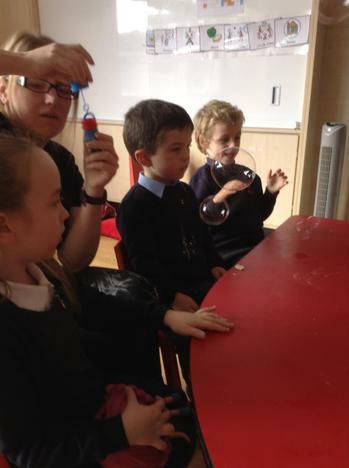 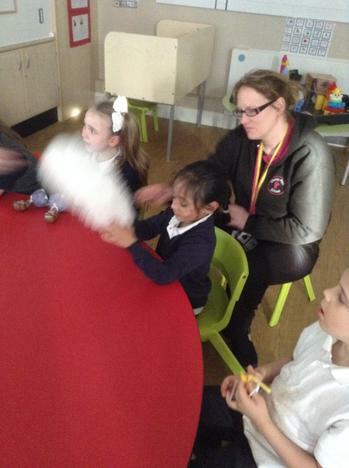 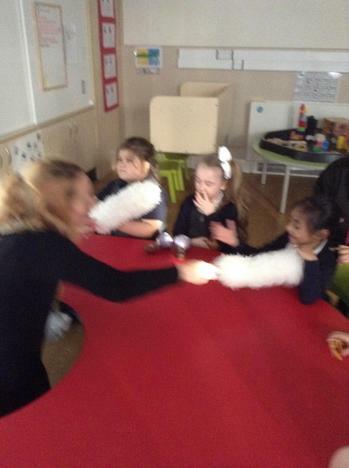 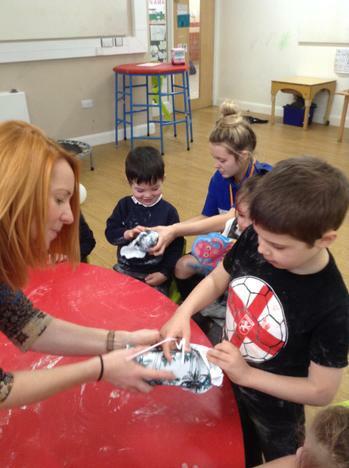 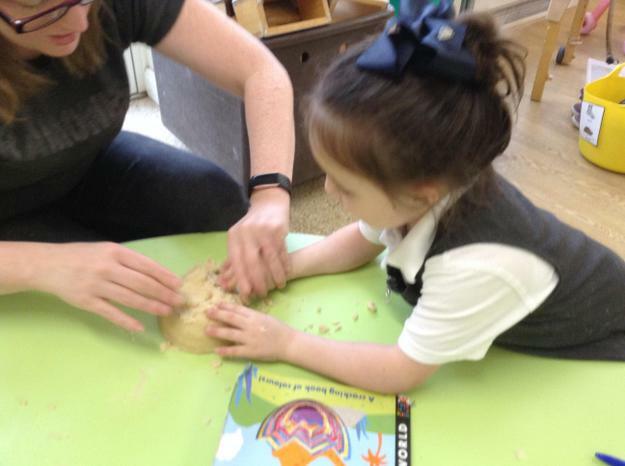 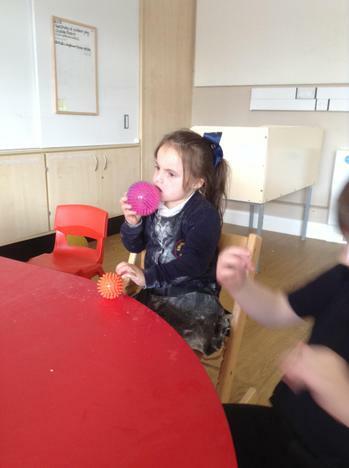 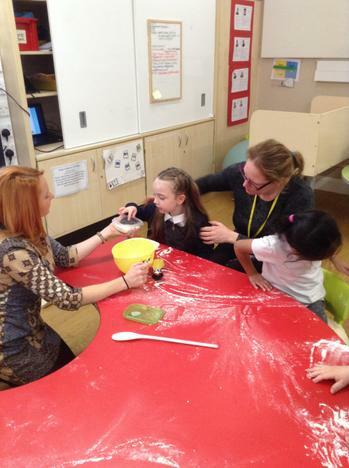 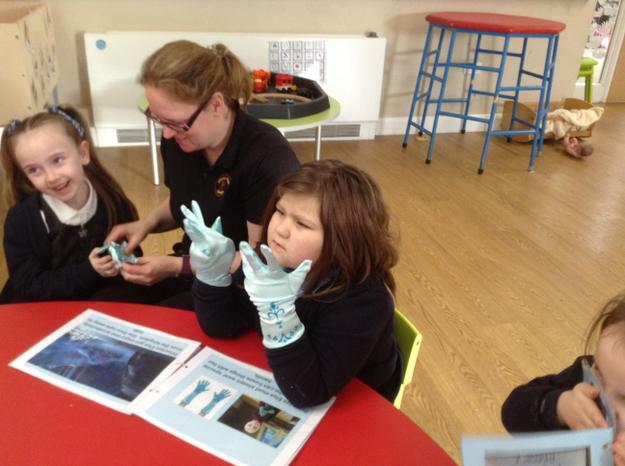 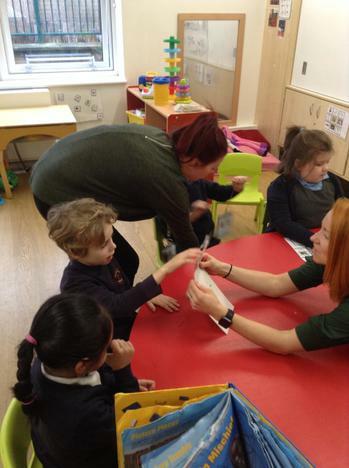 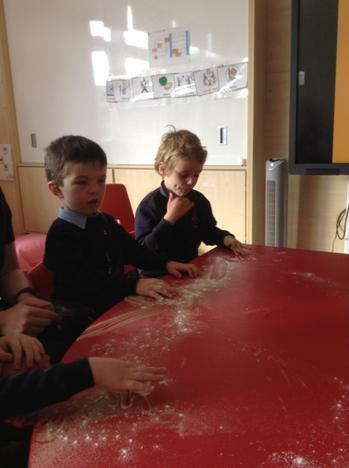 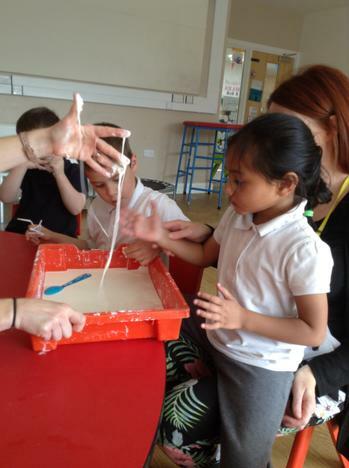 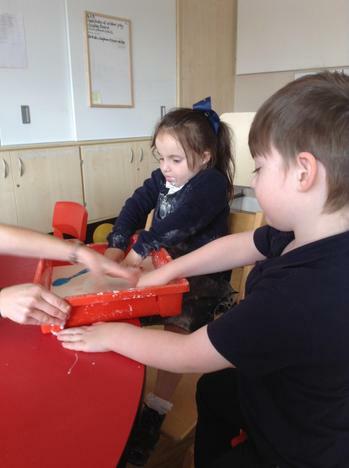 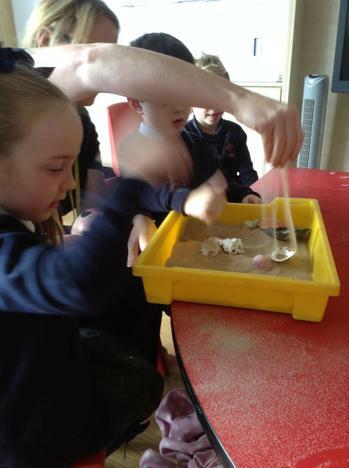 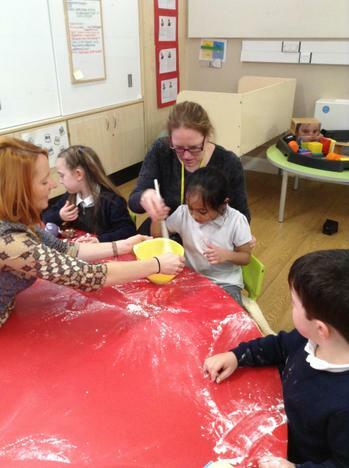 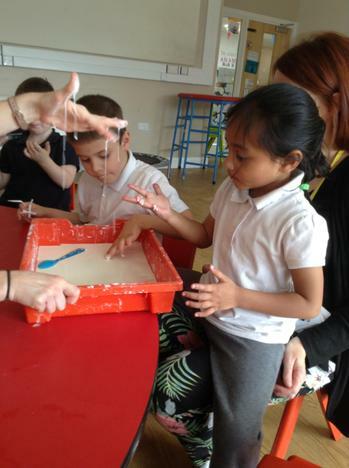 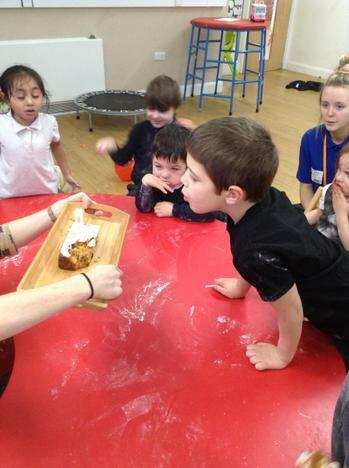 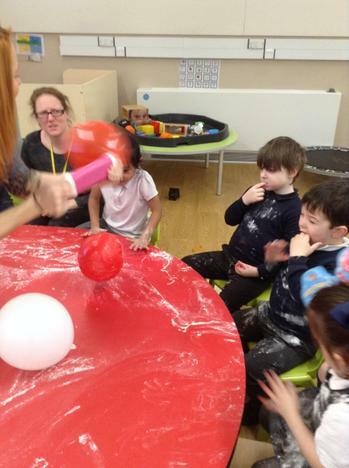 We have also explored the sensory elements of fake snow, ice and cloud dough. 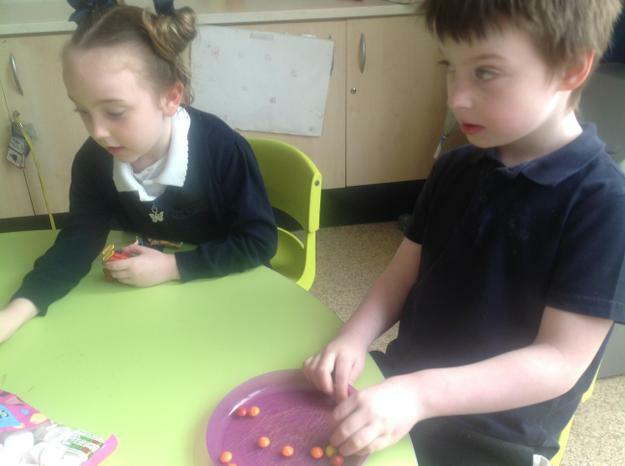 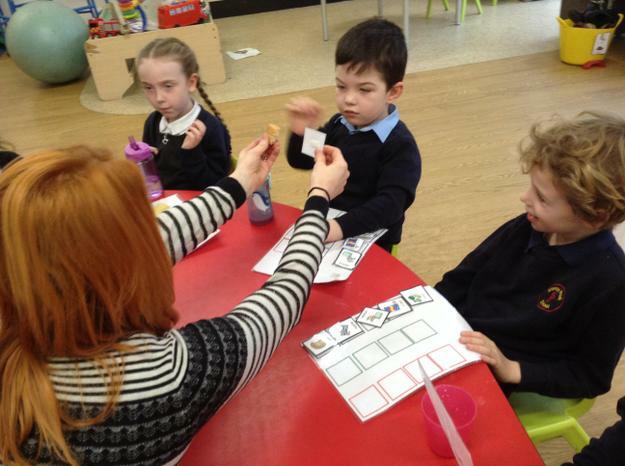 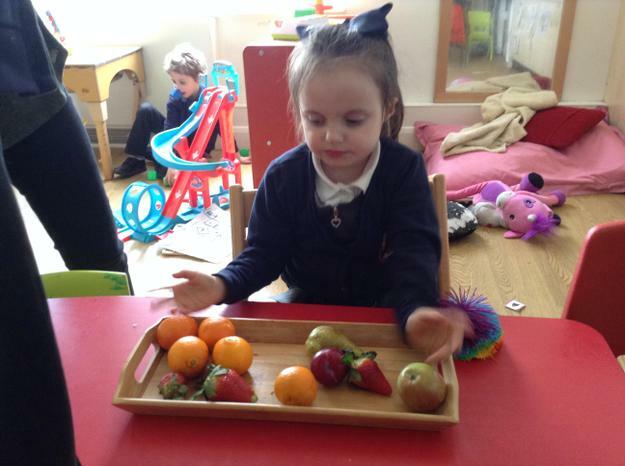 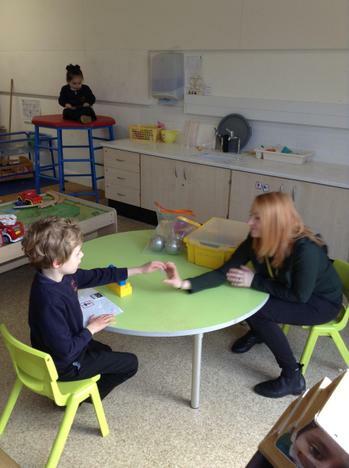 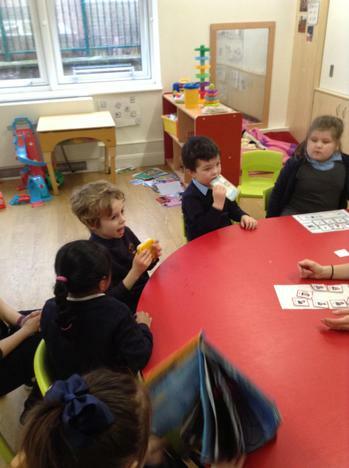 All of the children have continued to develop their communication skills and all are using PECS symbols to communicate during snack time. 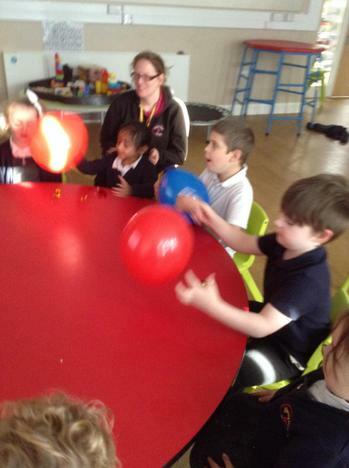 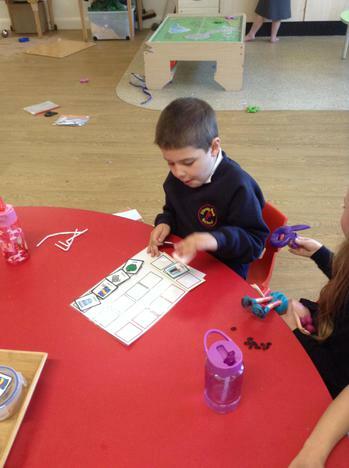 Some of the children are also using symbols at dinnertime and to request favoured activities. 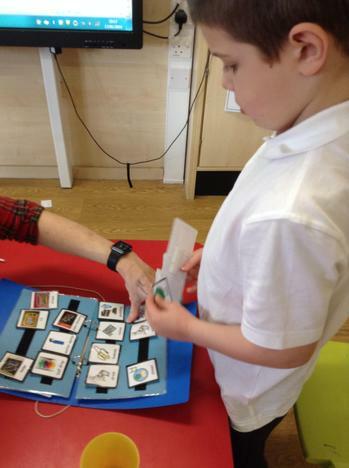 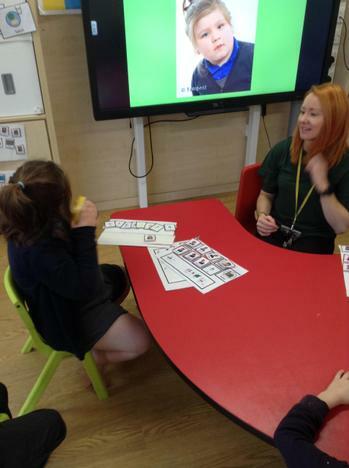 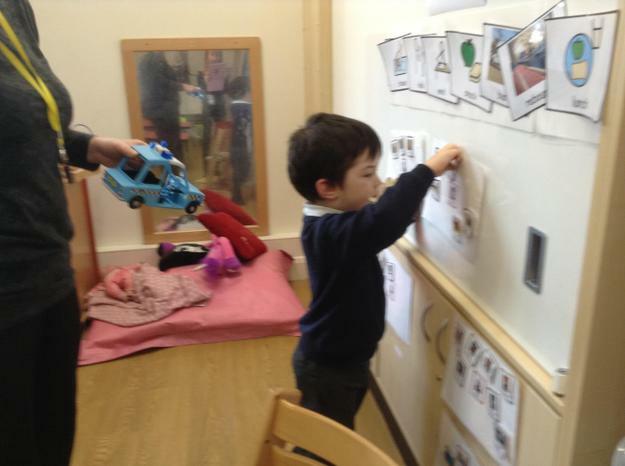 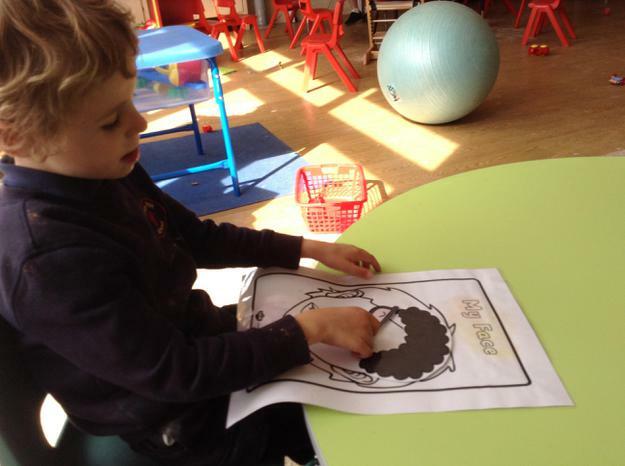 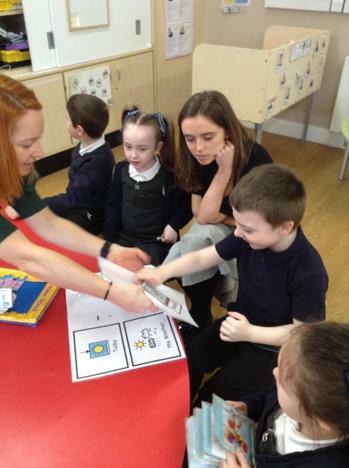 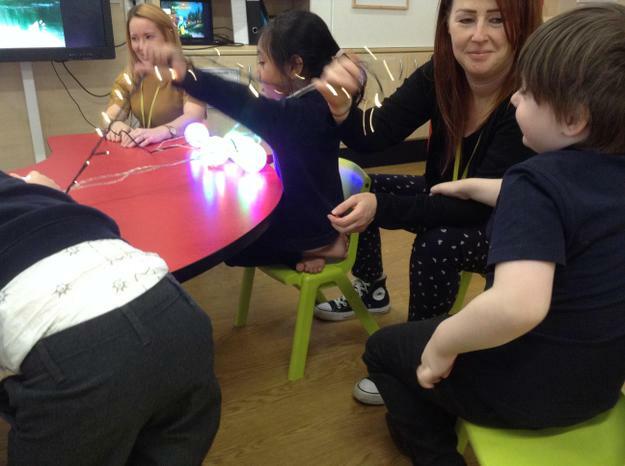 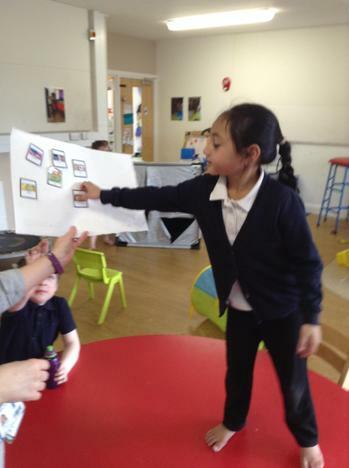 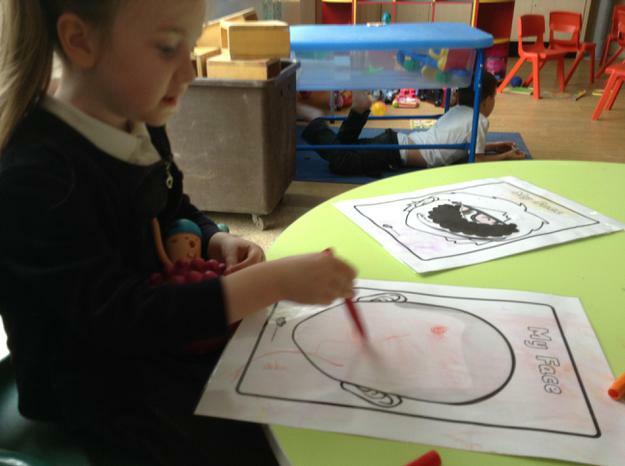 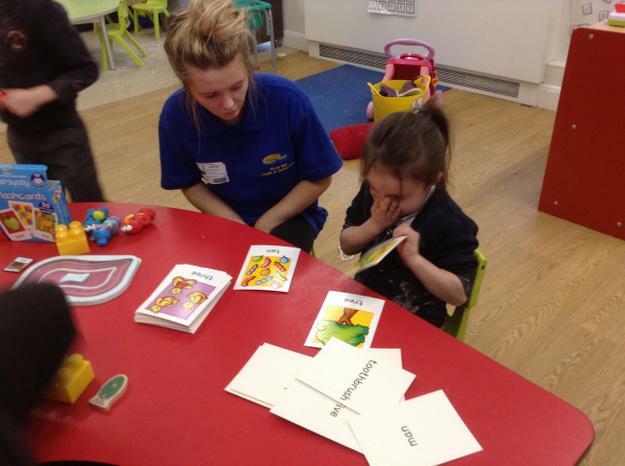 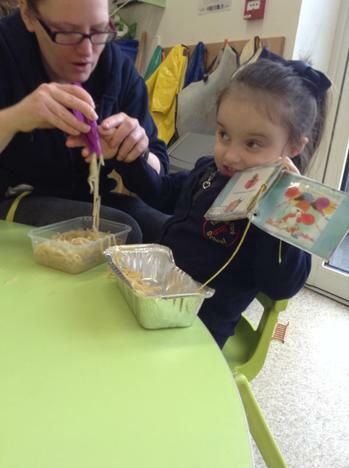 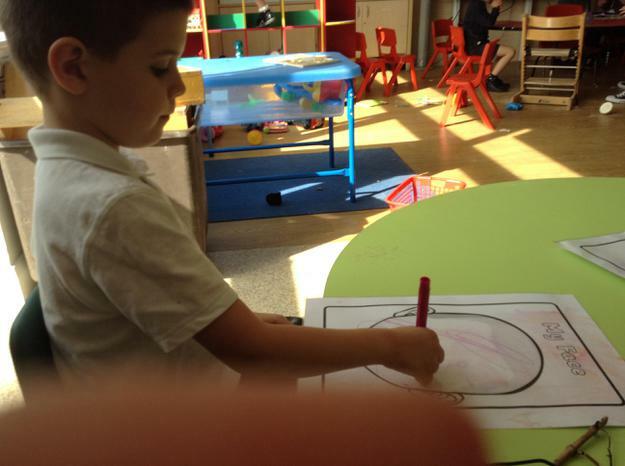 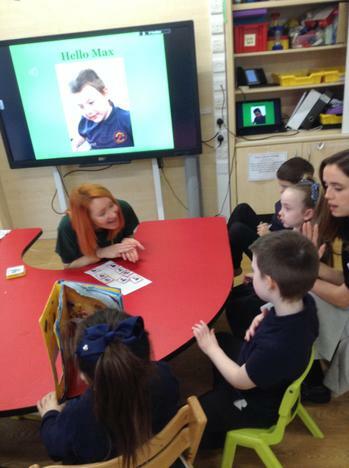 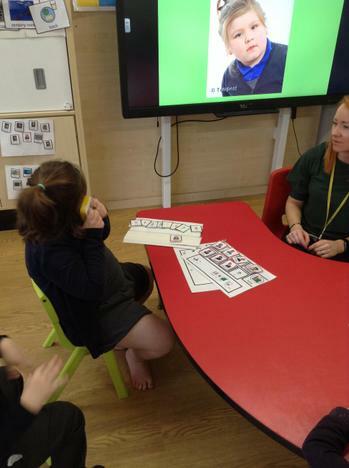 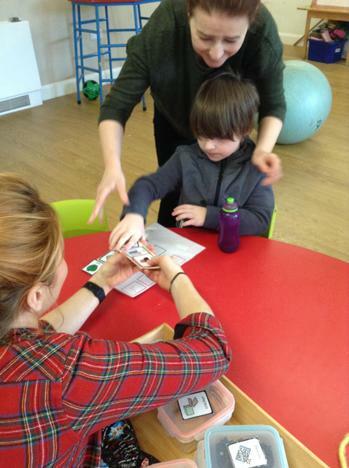 PODD communication boards are also used with some children to encourage them to touch the picture of what they want. 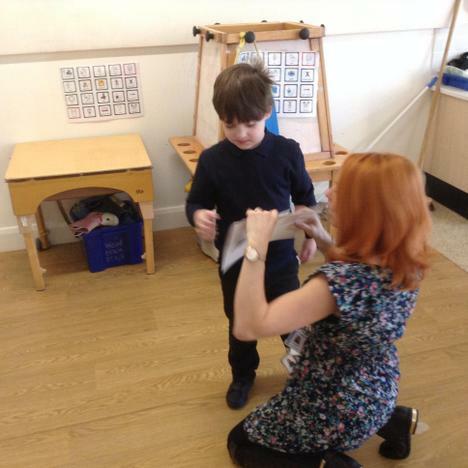 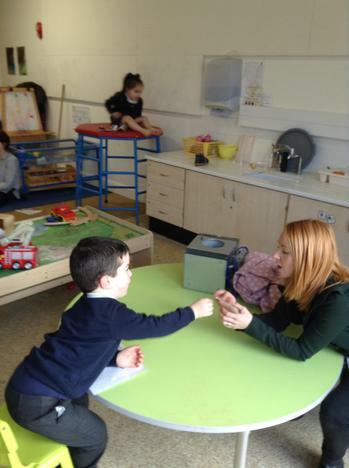 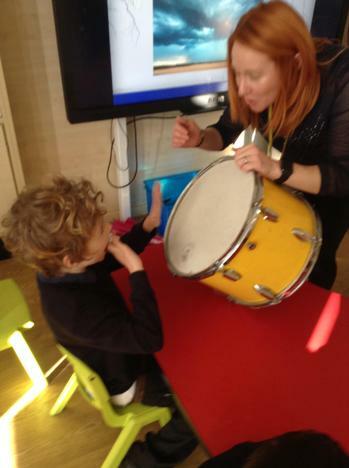 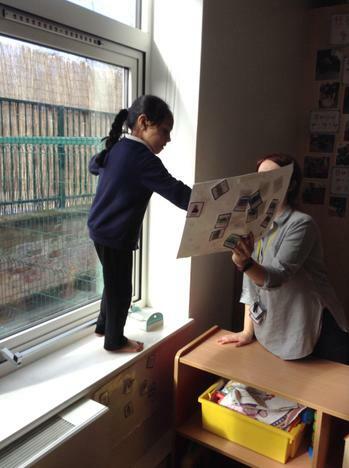 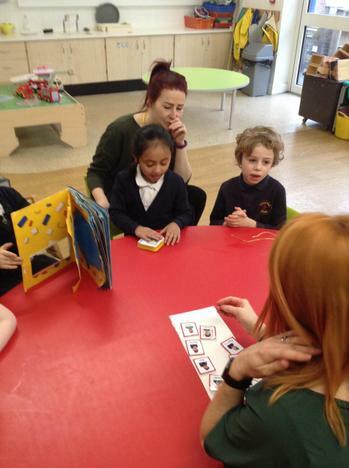 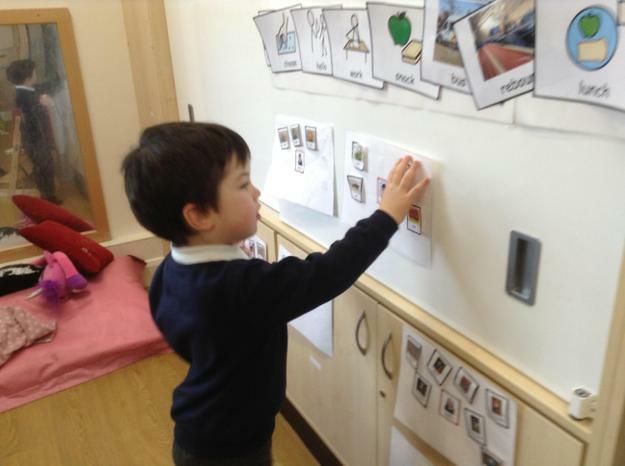 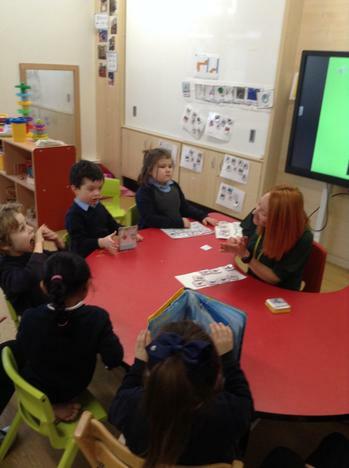 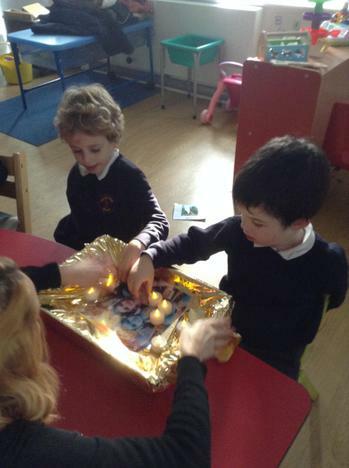 The children have become really familiar with our consistent daily hello routine and all are now becoming more independent during the routine of recognising their song, choosing their own picture and using the talking tin to say good morning. 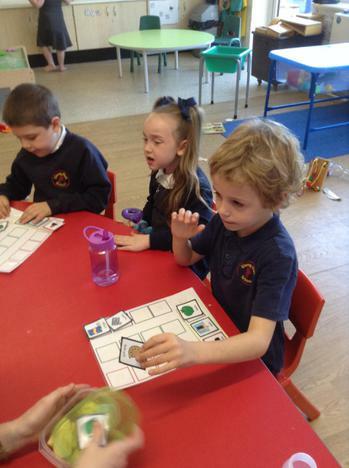 The children in Lime class have continued to work really hard on their communication and are all now independently initiating communication at snack time using symbols. 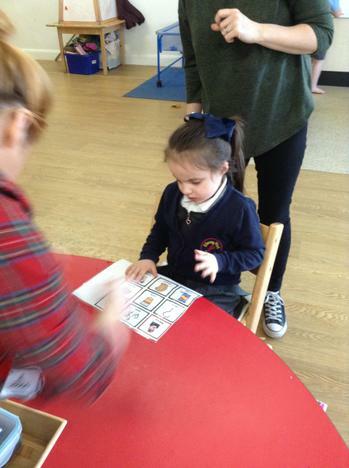 It has been lovely to see the progress made throughout the term. 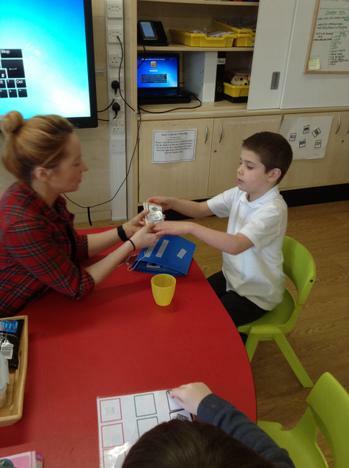 Many of the children are also now beginning to generalise the new skill they have learnt and using PECS in other contexts, e.g. 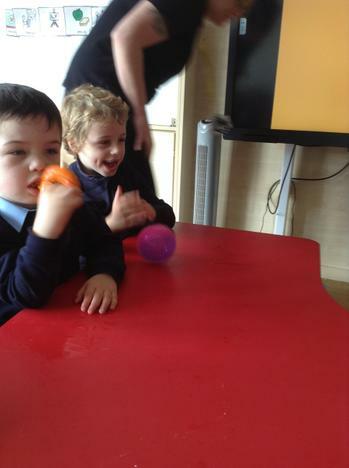 to request a drink or their dinner at dinner time or to request their favourite toy from out of the cupboard. 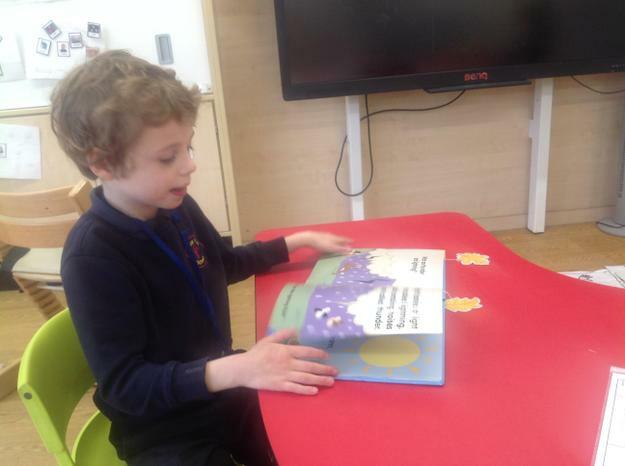 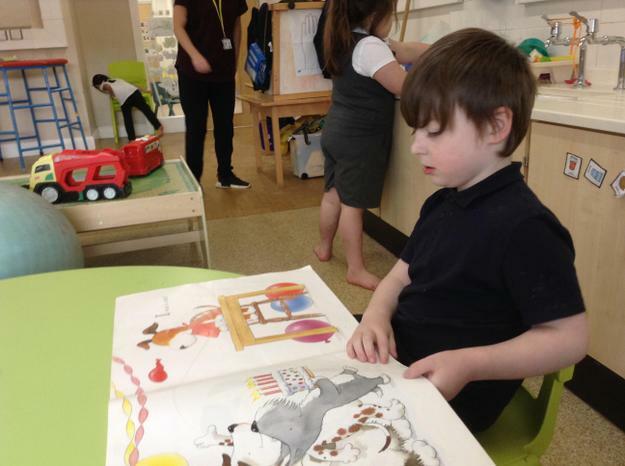 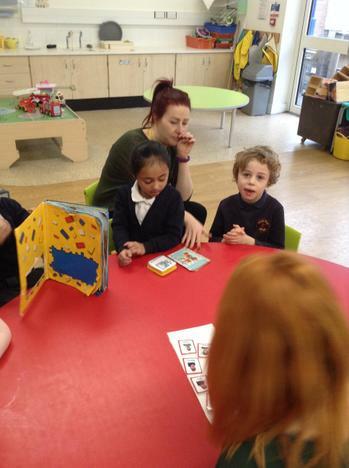 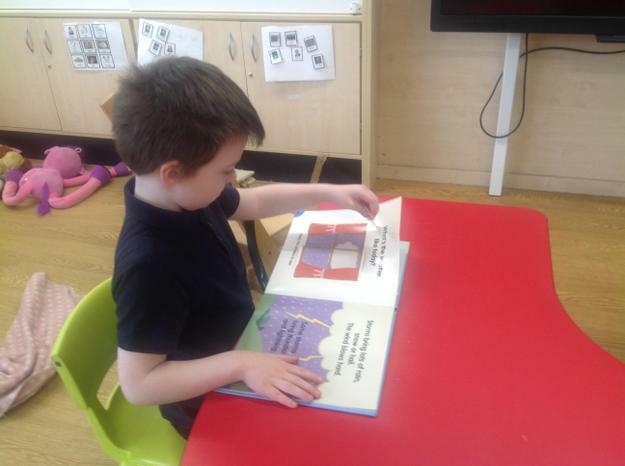 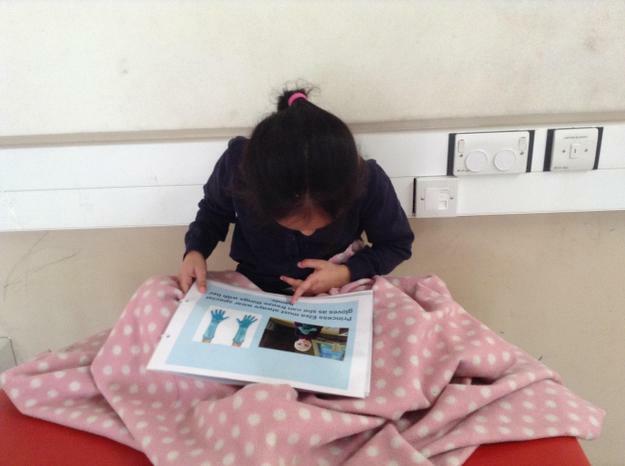 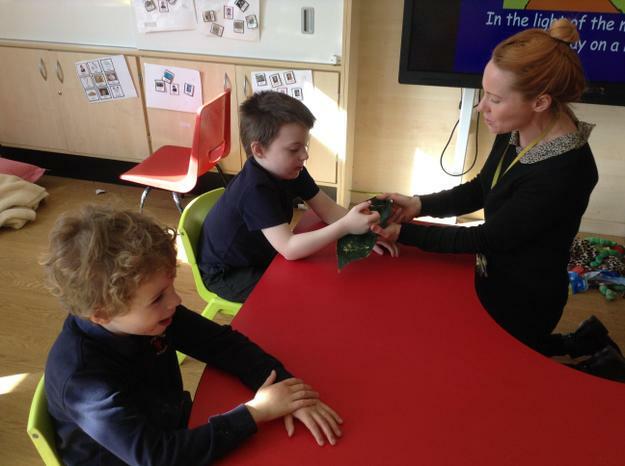 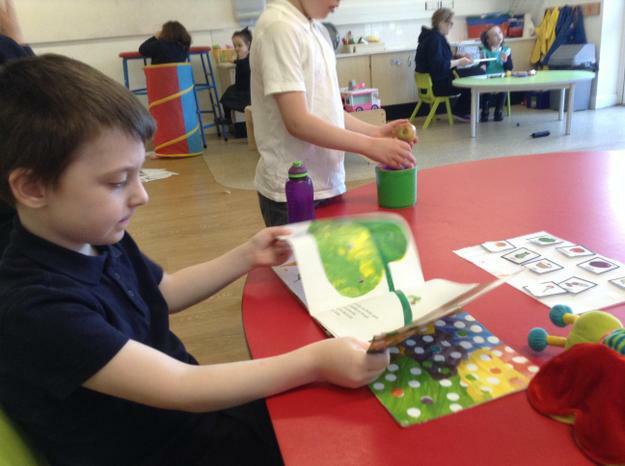 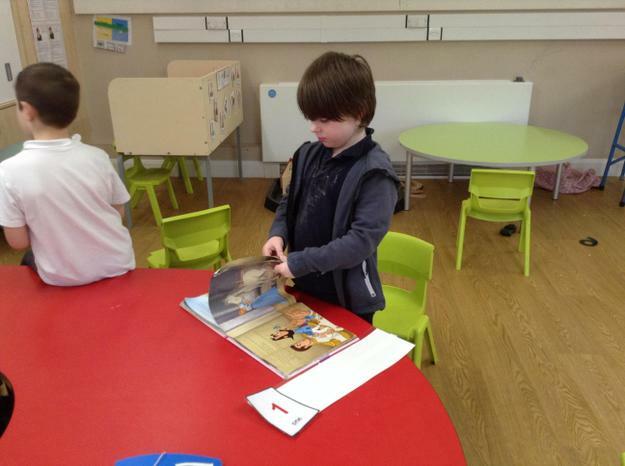 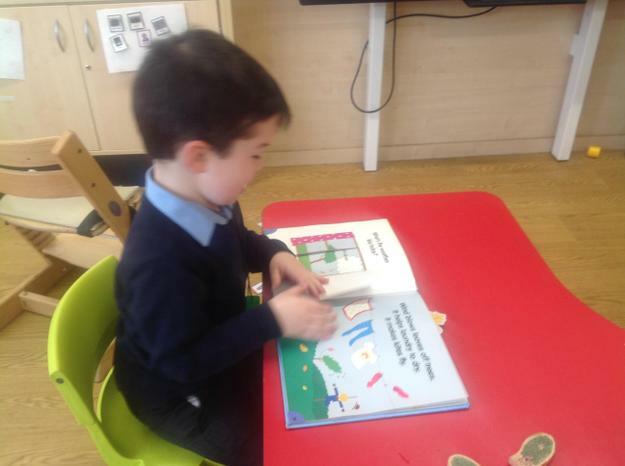 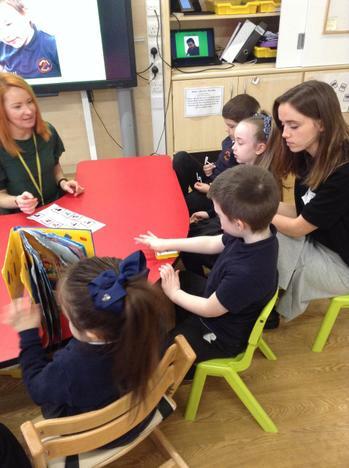 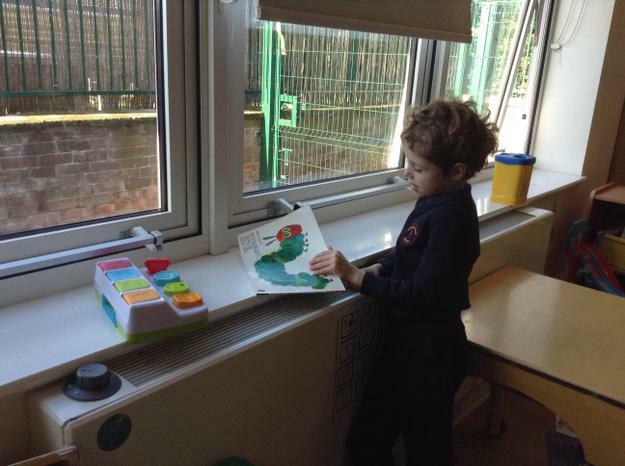 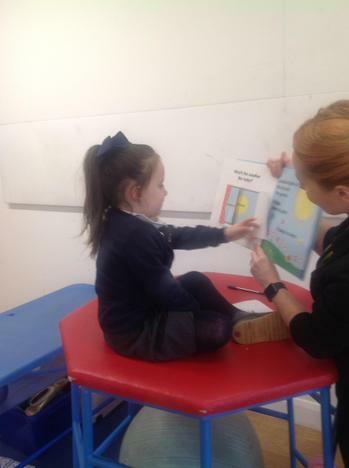 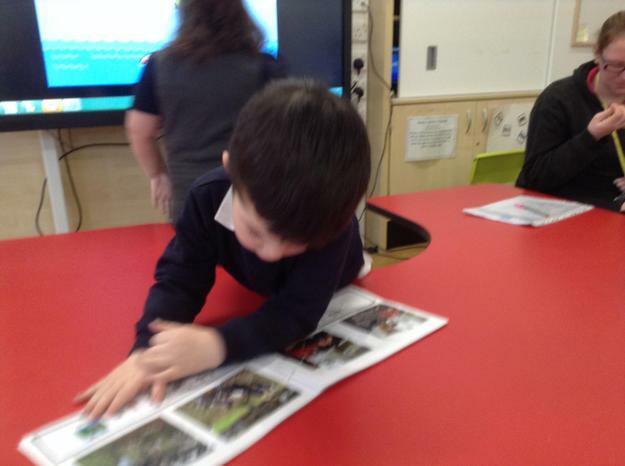 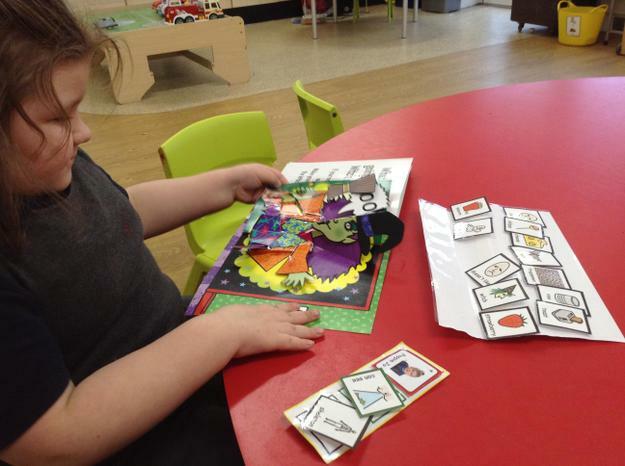 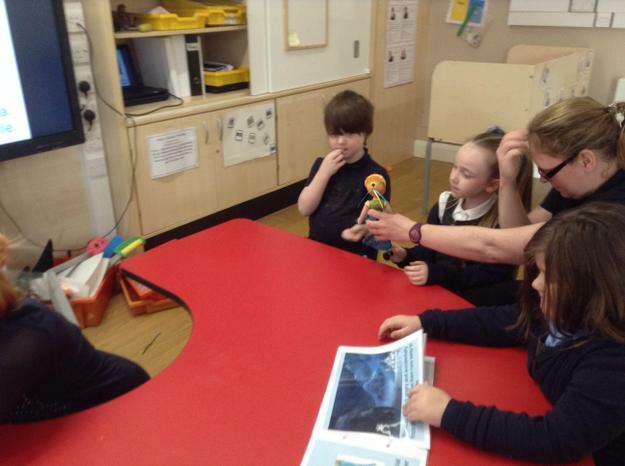 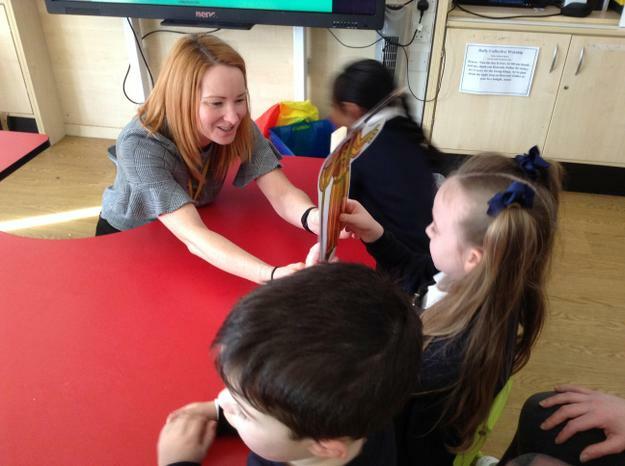 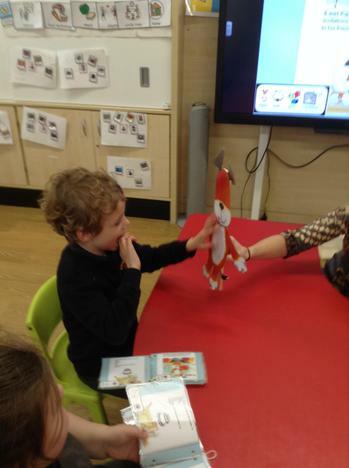 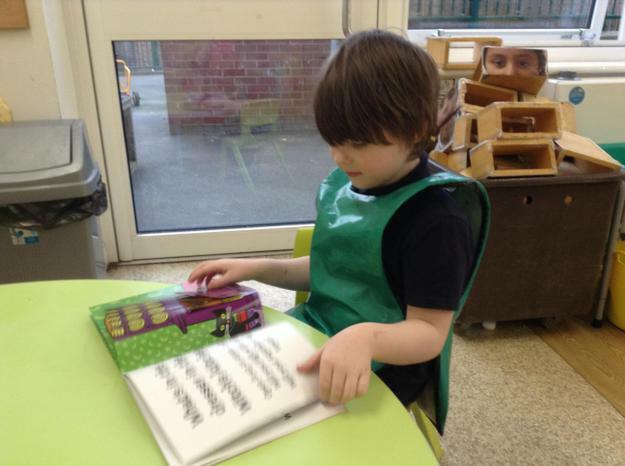 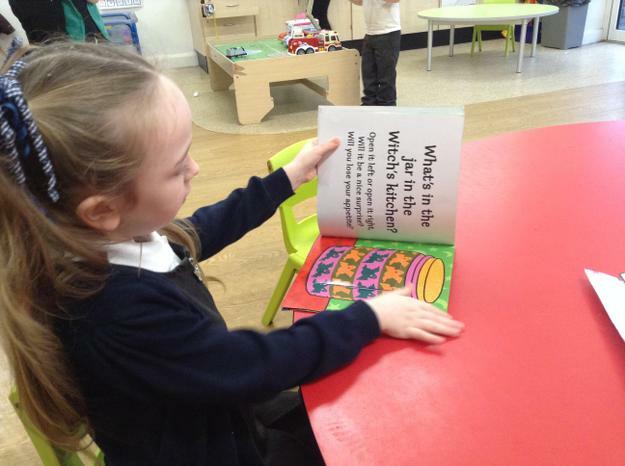 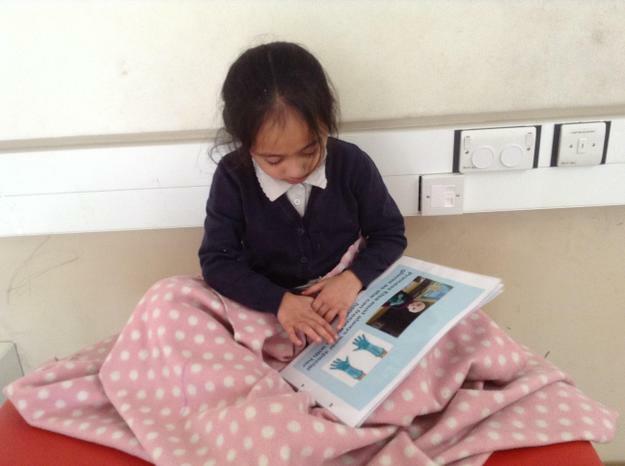 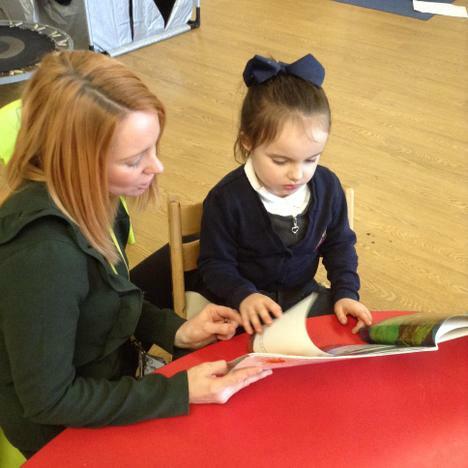 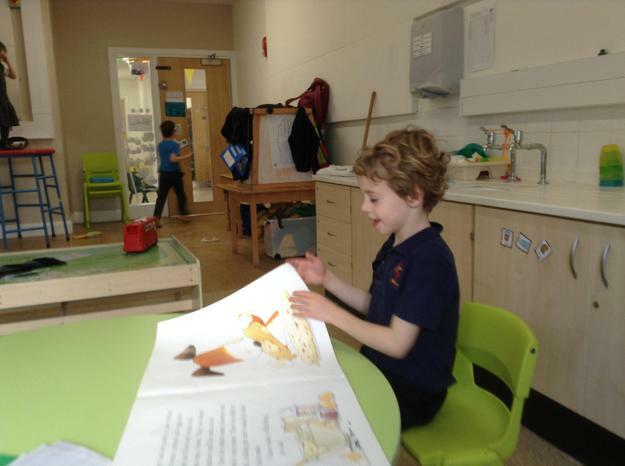 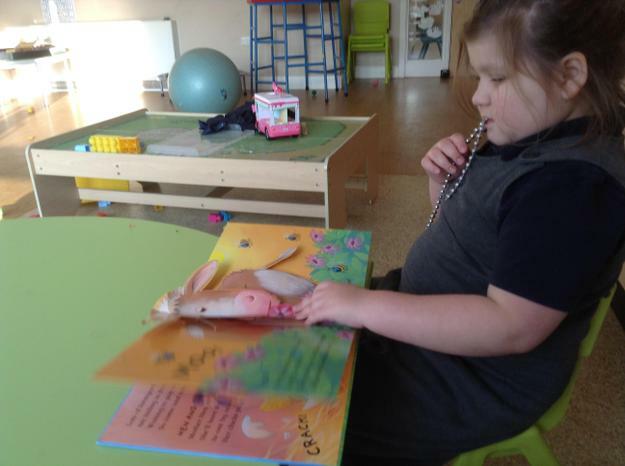 We have also been working on our early reading skills this term in Lime class and have enjoyed sharing books with adults and becoming more independent when handling books. 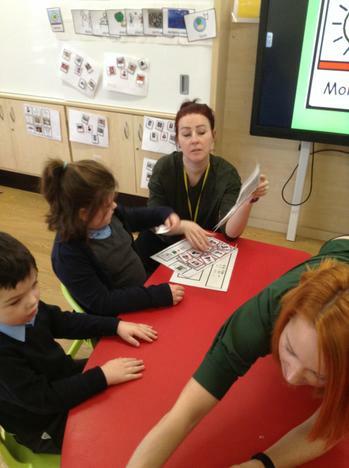 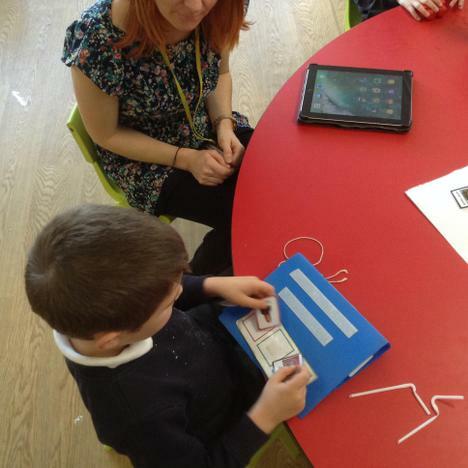 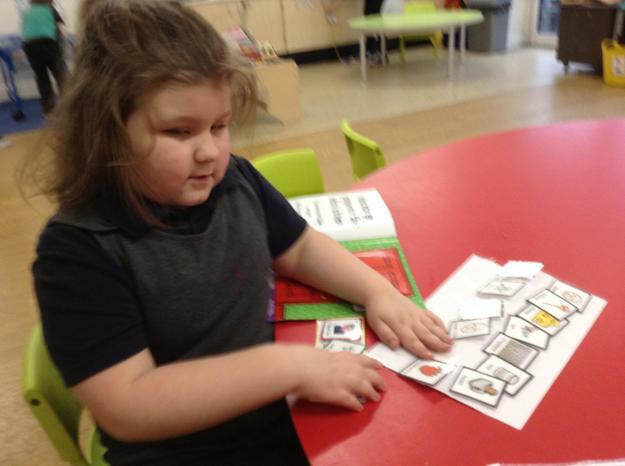 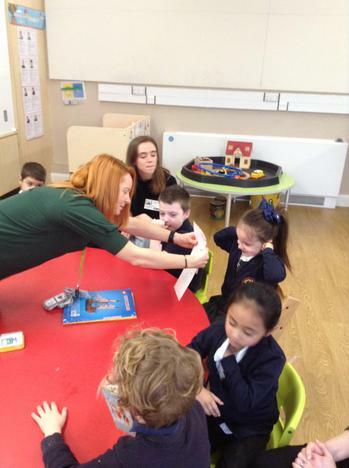 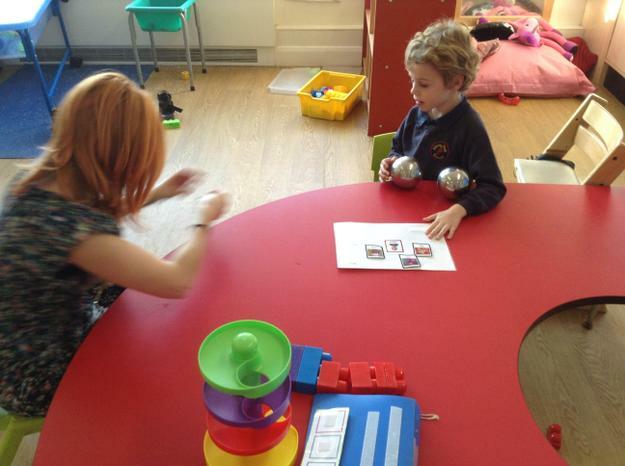 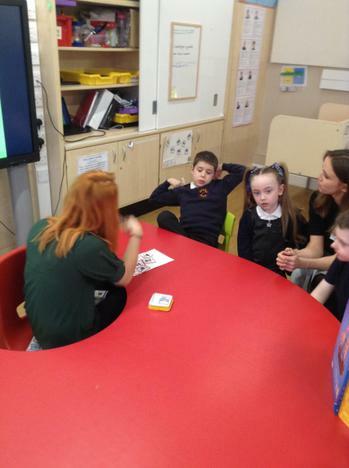 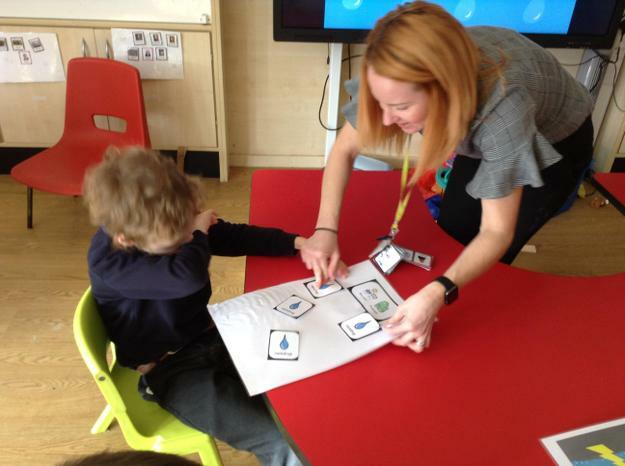 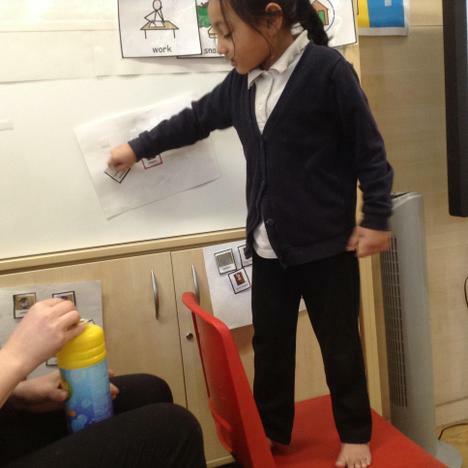 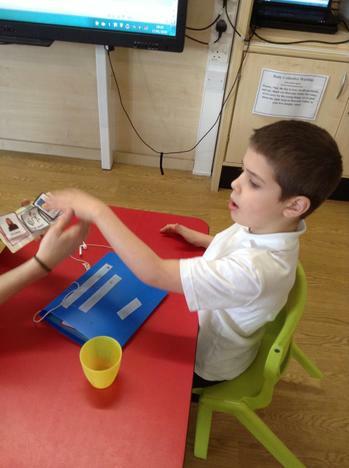 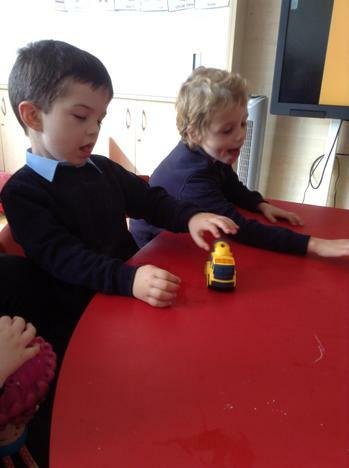 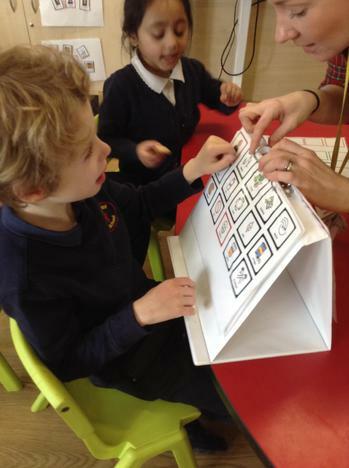 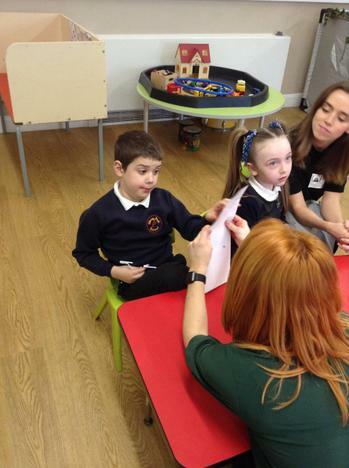 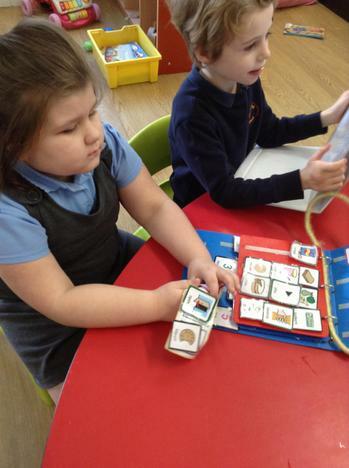 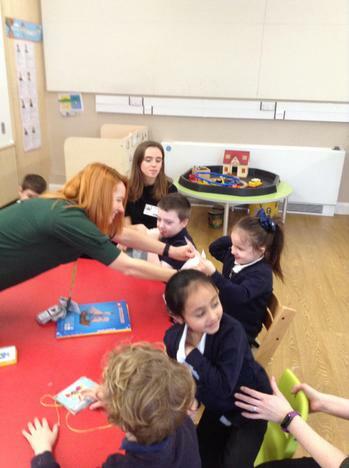 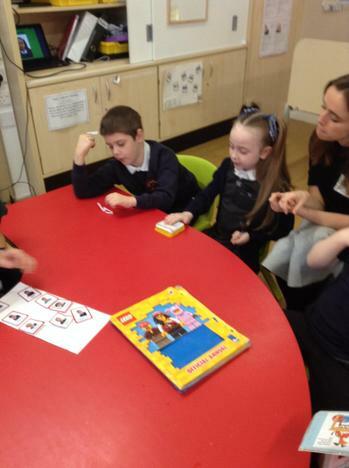 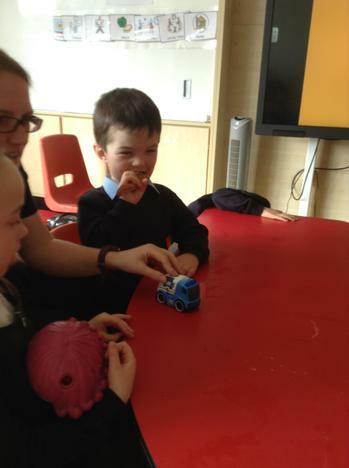 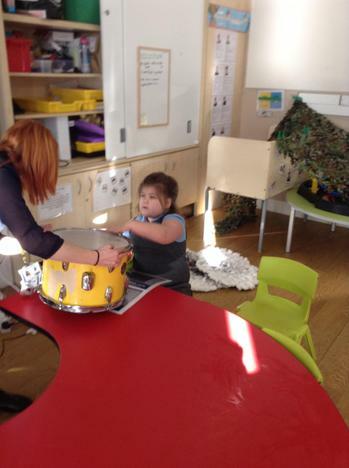 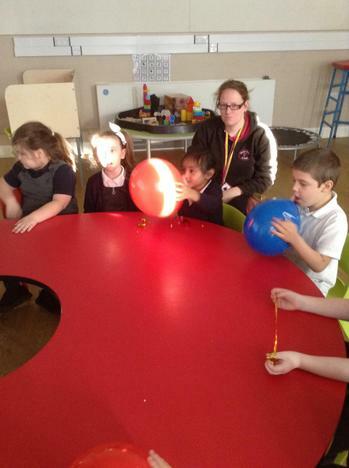 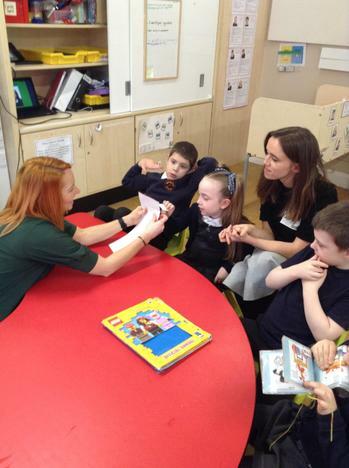 In Lime class the children are all encouraged to use PECS symbols to communicate what they want. 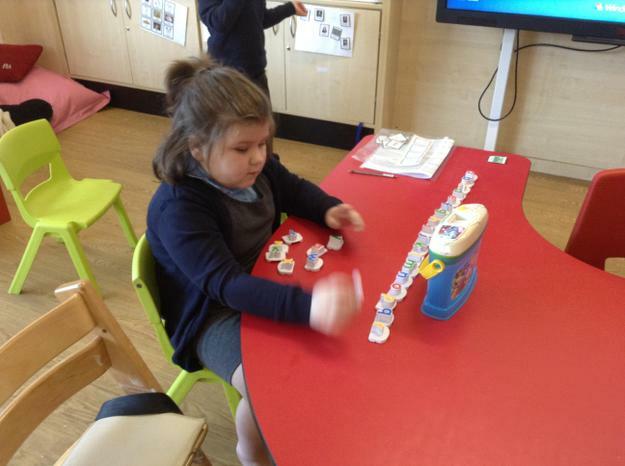 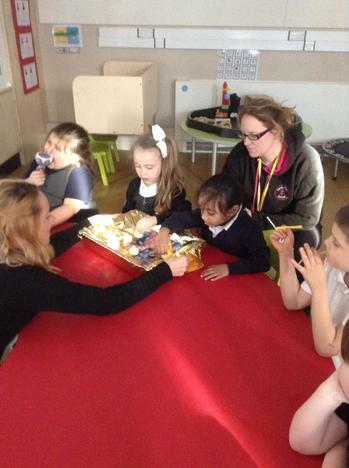 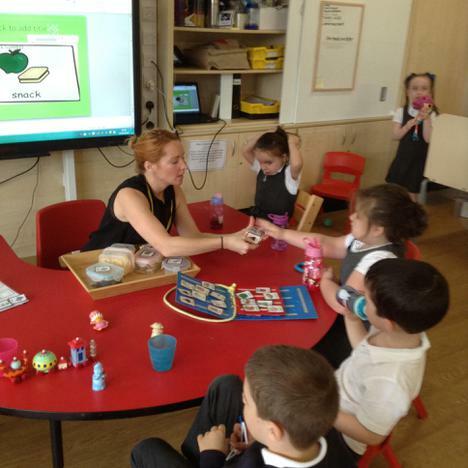 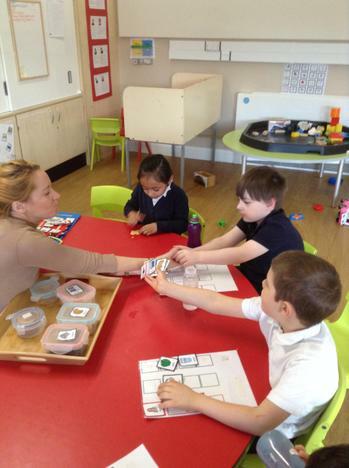 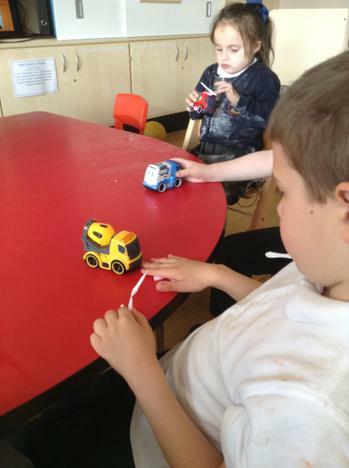 This is working really well during snack time and all of the children are using symbols to make their choices. 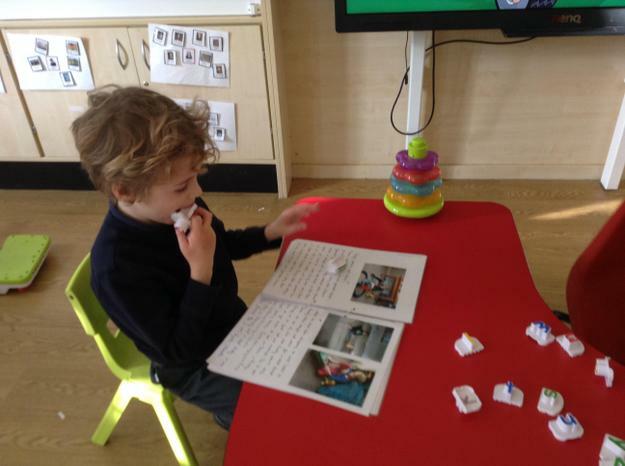 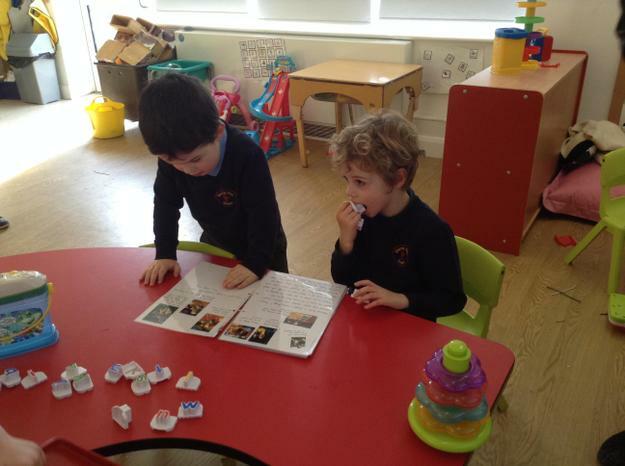 Some of the children are also forming sentences such as 'Vickey open biscuits'. 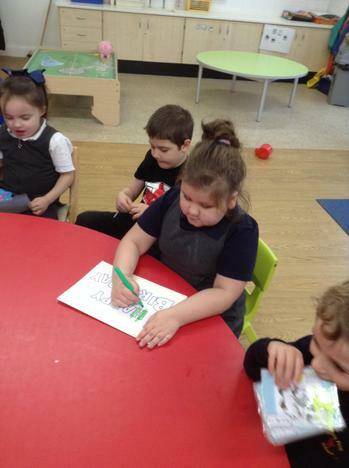 They have all made so much progress already! 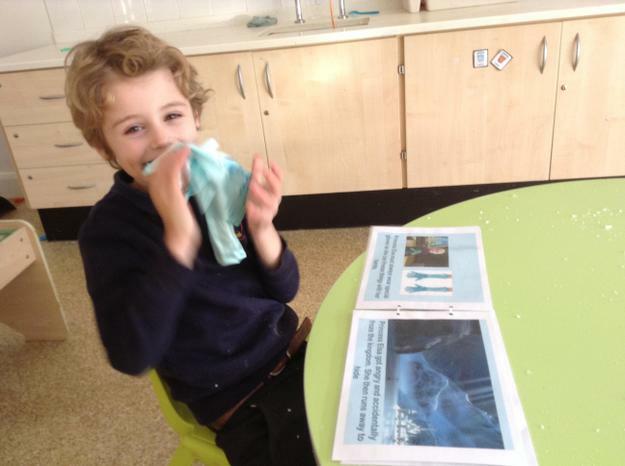 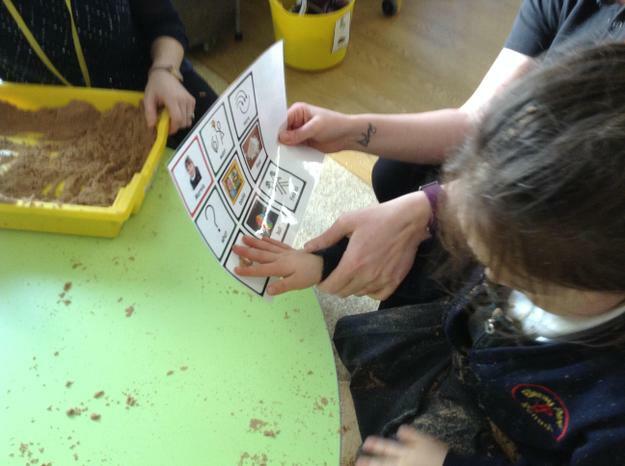 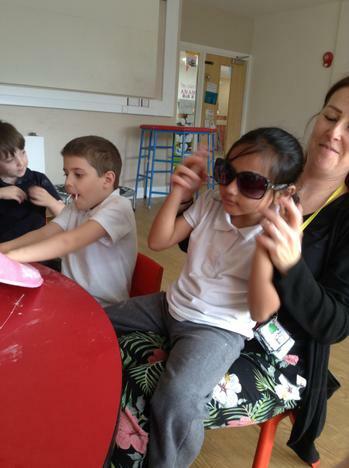 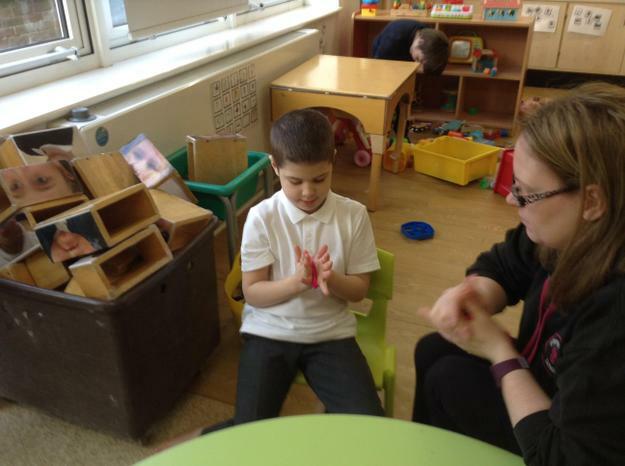 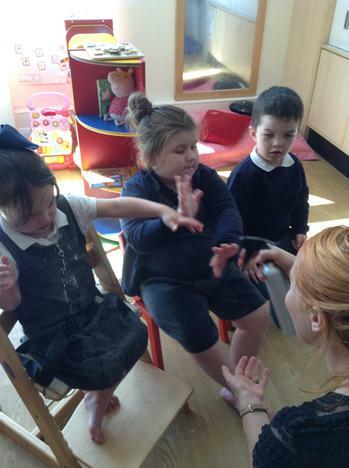 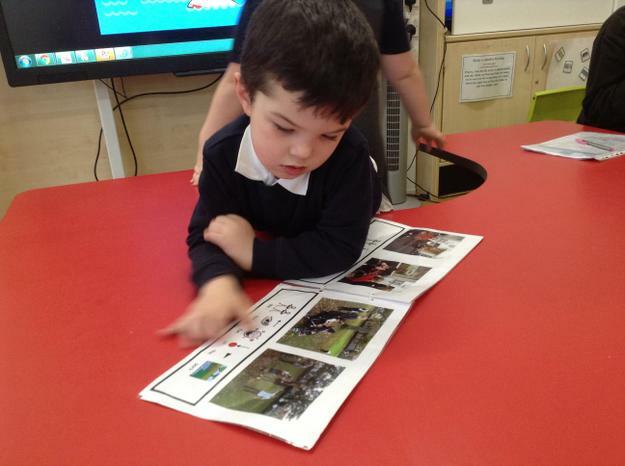 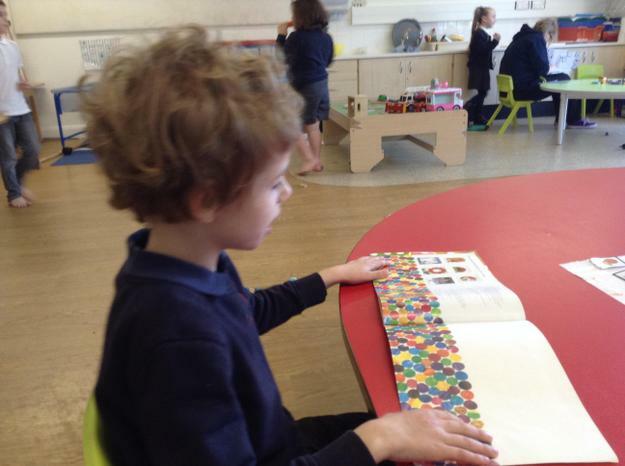 We also enjoy a daily group sensory story. 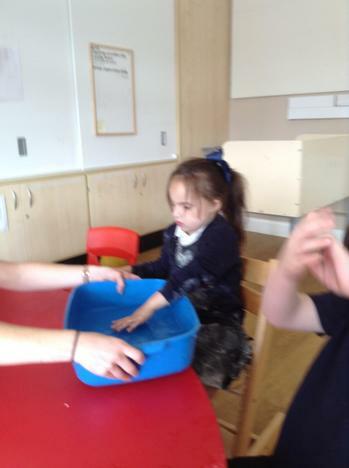 Our first story was about going on a water hunt. 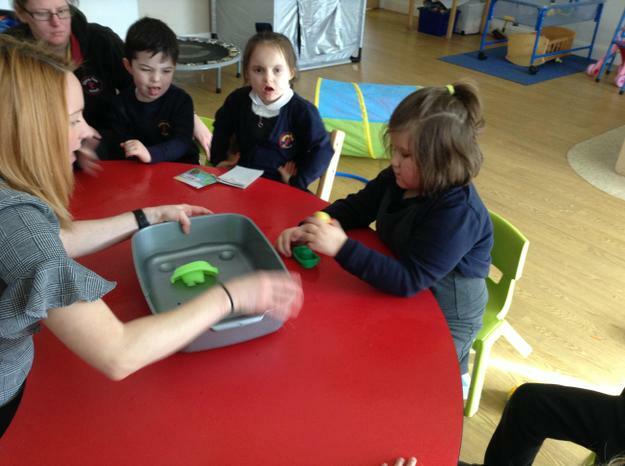 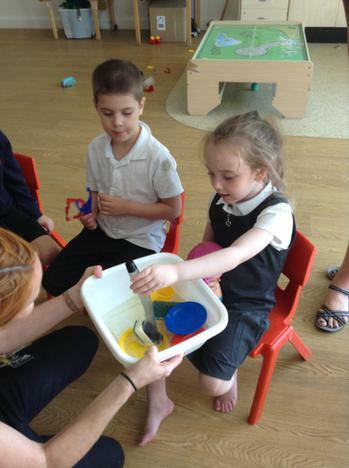 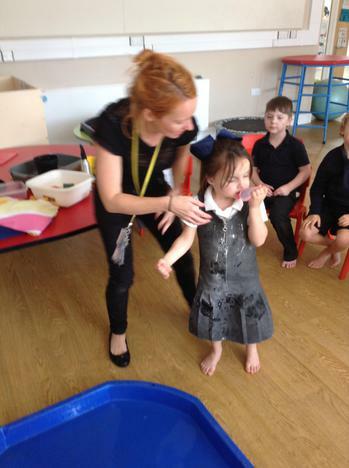 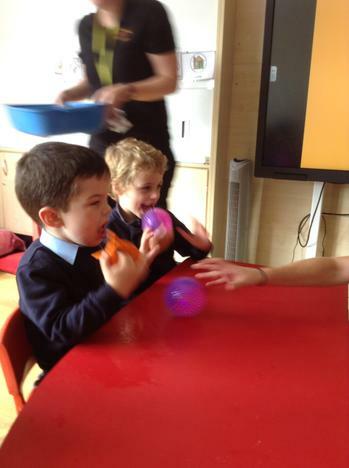 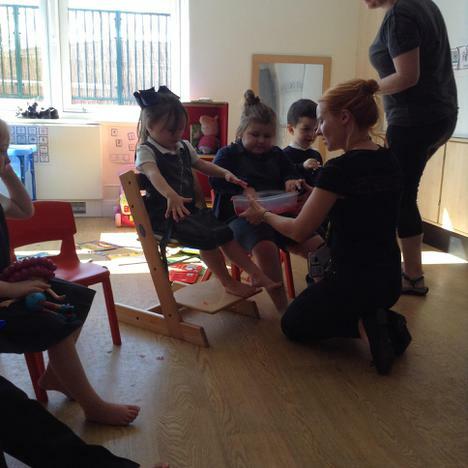 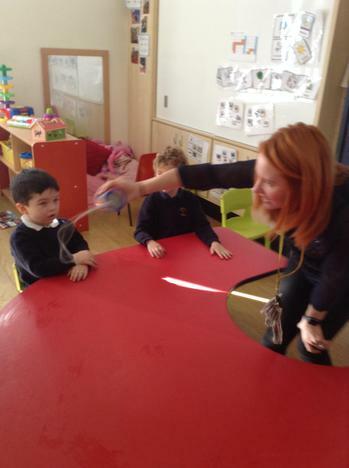 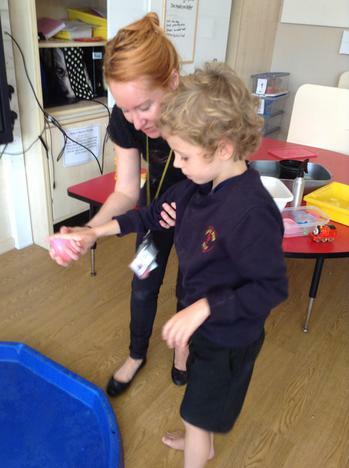 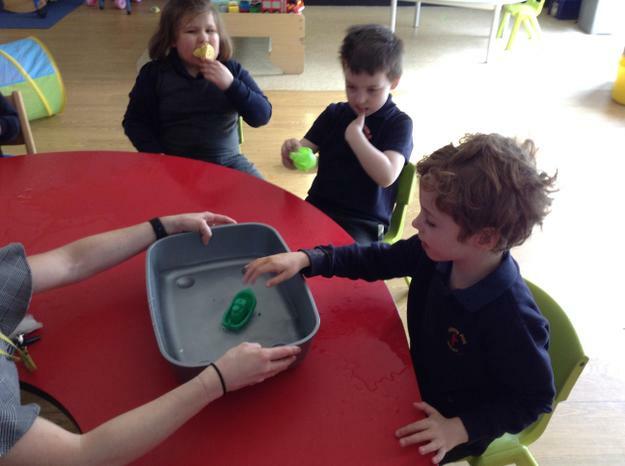 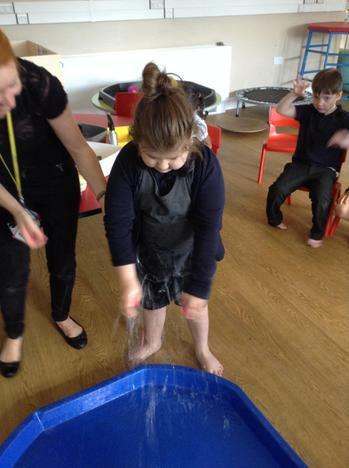 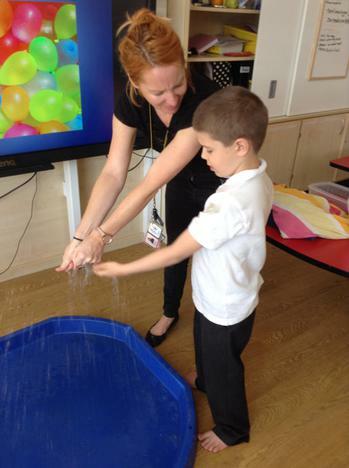 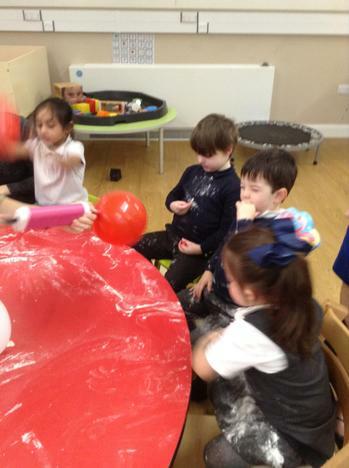 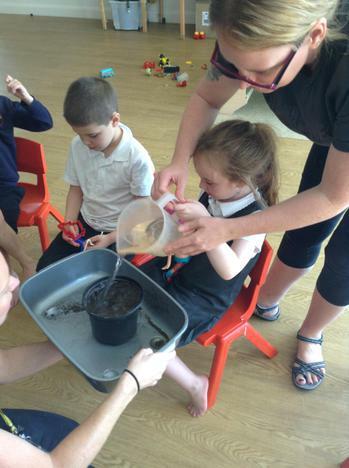 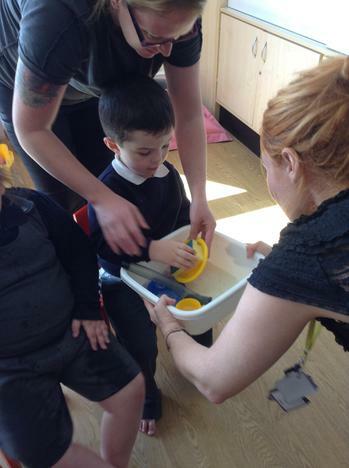 This involved lots of sensory stimuli to explore such as bubbles, jelly, ice cubes, watering can, dirty dishes and water balloons. 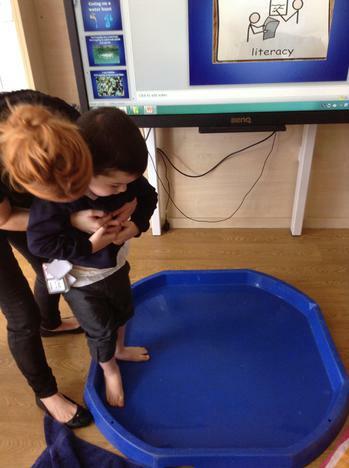 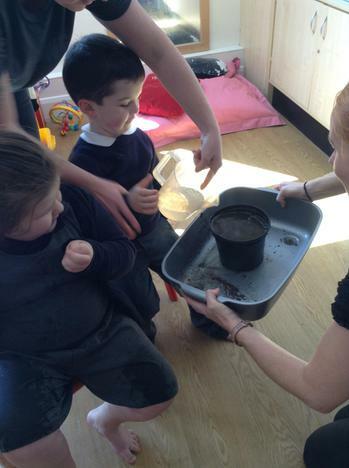 The children all enjoyed splashing in the puddles at the end of they story. 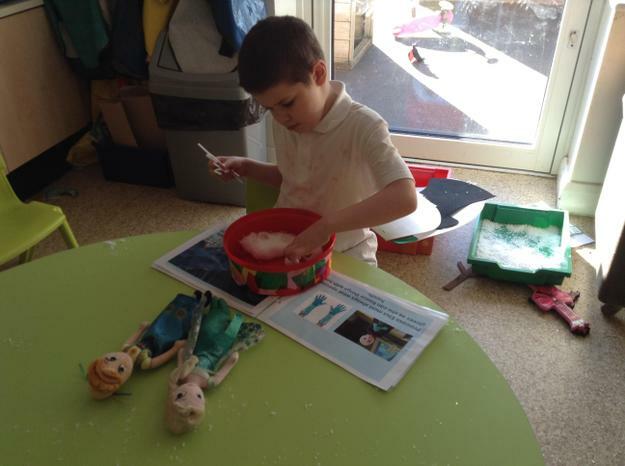 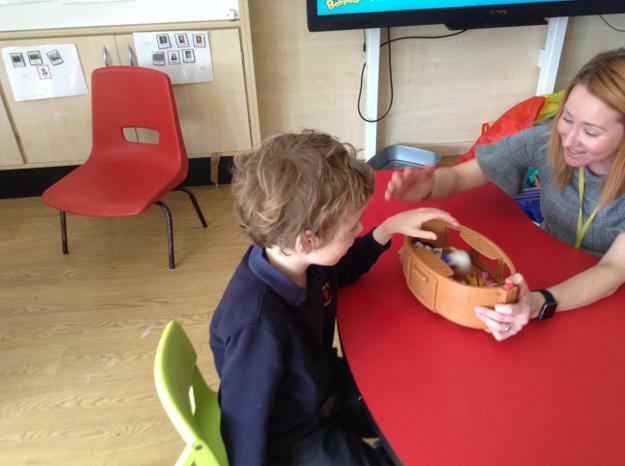 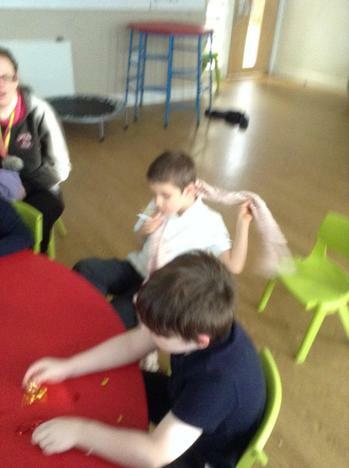 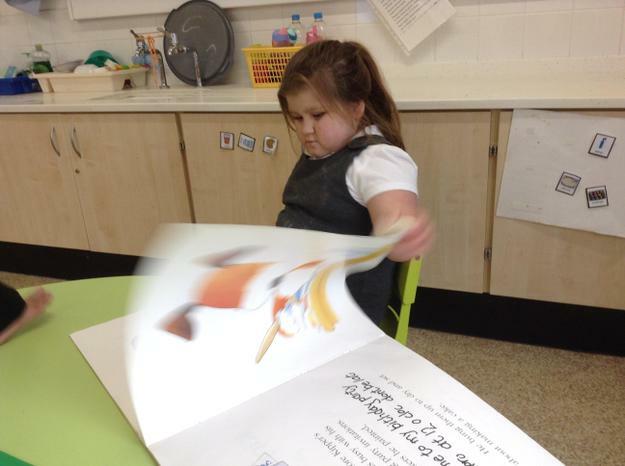 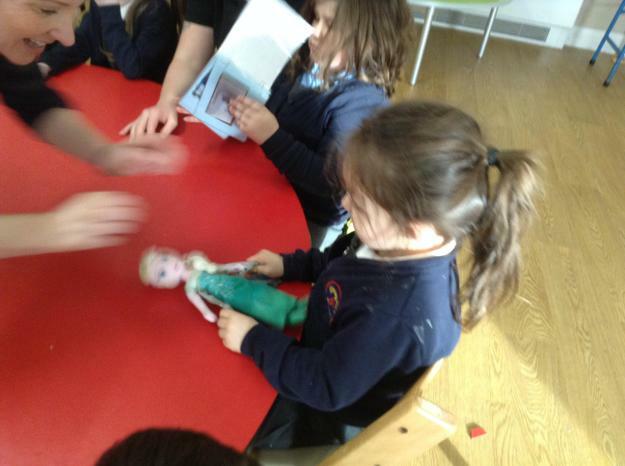 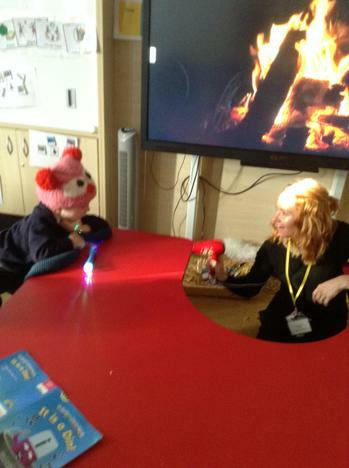 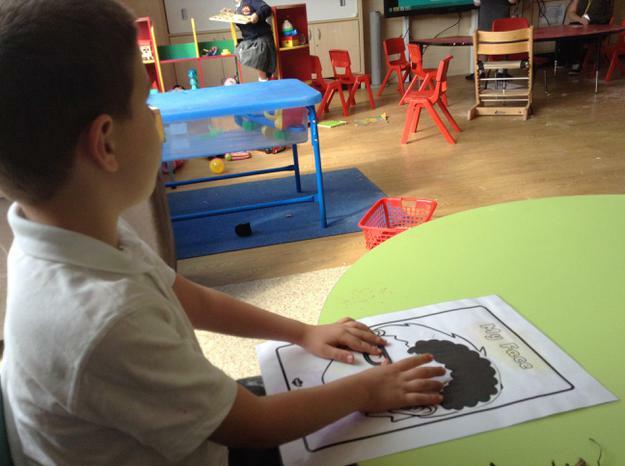 Our next sensory story was 'Good to be me'. 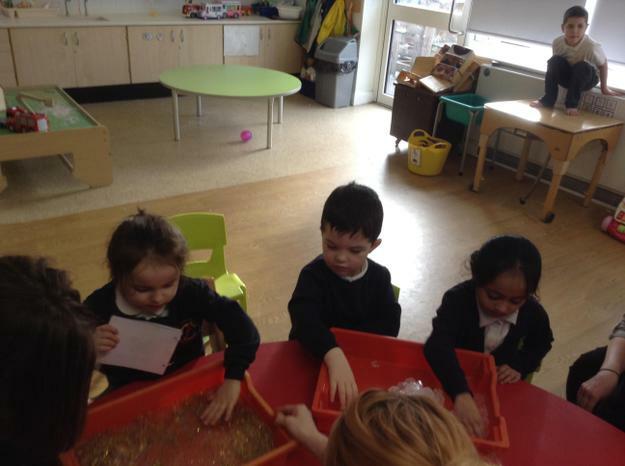 All of the children in the class had their own part of the story where we learnt what they liked e.g Aleena likes water, David likes tasting nice food, James like to roll balls, Joe likes toy cars, Marnie likes to get messy, Sophia likes bubbles, Poppie likes to listen to counting songs, Max likes to dance. 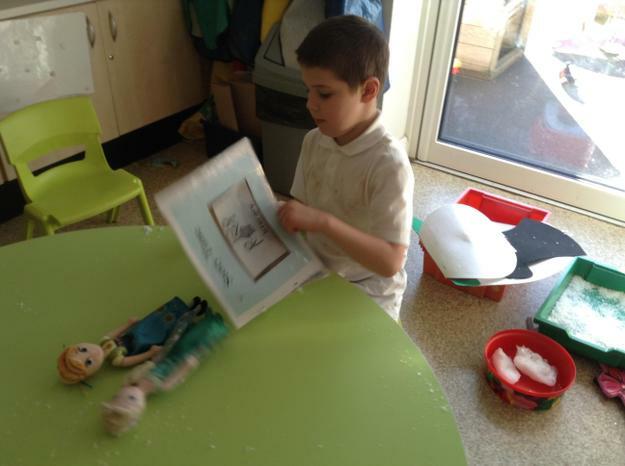 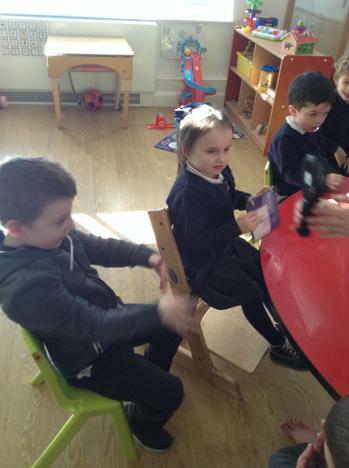 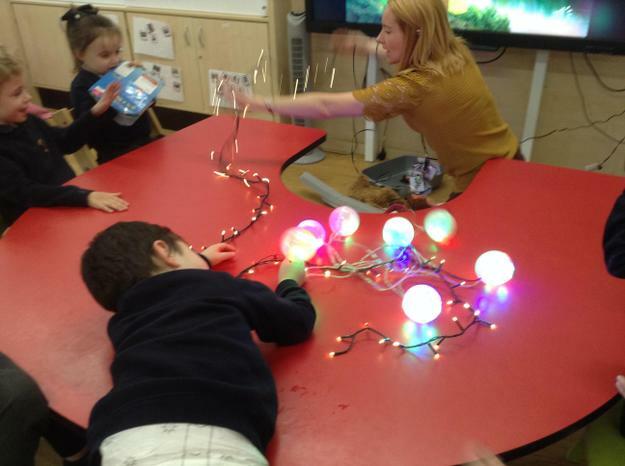 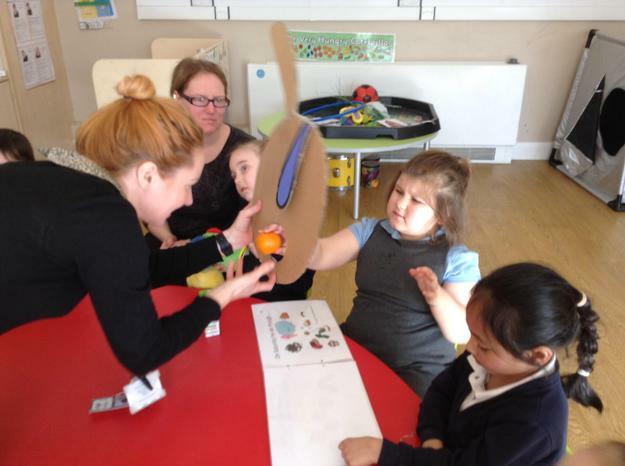 The children enjoyed the story and all of them started to anticipate what was coming next and copied action using the props.